Welcome to the fourth recorded operating session. The new operating session takes place on ĵaŭdo 23° januaro, or Thursday 23rd January sometime in the sixties. The weather forecast is for imminent snow over the Altingablecaŭtoj but, thankfully, there will be no fog. It will be an extremely cold but clear day if it is not snowing! The temperature is forecast to rise to minus 15 centigrade! Daylight hours today are between 07.30 and 16.30 hrs. An additional problem is that steam locomotives' thermal efficiency drops in these conditions so tonnage will have to be cut across the Altingablecaŭtoj and the railcars may need piloting. A large build up of forestry products also demands that Lacono control does something about the piles of timber accumulating in the High Country. If control had any brains (?!) they might attempt to ensure that all workings over the north country were powered by diesels. What chance of that? There are a couple of innovations that I hope to use whist presenting this session. Hopefully I can work out the complexities of the website construction package to keep these running! One is to clearly mark where each new batch of photos has been posted so that you do not have to spend too much time scrolling through previous posts. Simply press the "Go to new photos" section of the menu button below. 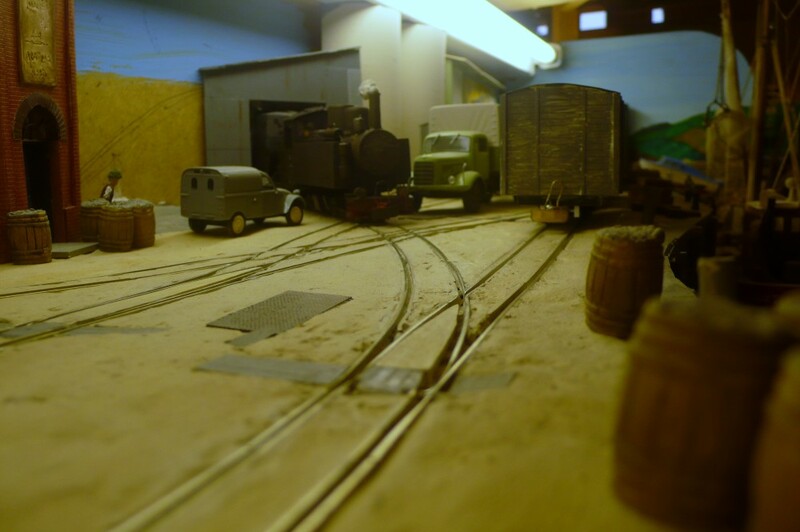 The other is to include a layout diagram so that it is clear where the photos have been taken on the layout. As a reminder to regular readers and an introduction to newcomers the system map is diagramatically shown below. 1. Preparation for the operating session includes the obvious things such as track and wheel cleaning. This takes up to two days of concentrated effort. There are roughly 1¼ route miles and that doesn't include sidings and running loops. Something like thirty locos have also received attention and, almost inevitably one will have been missed. 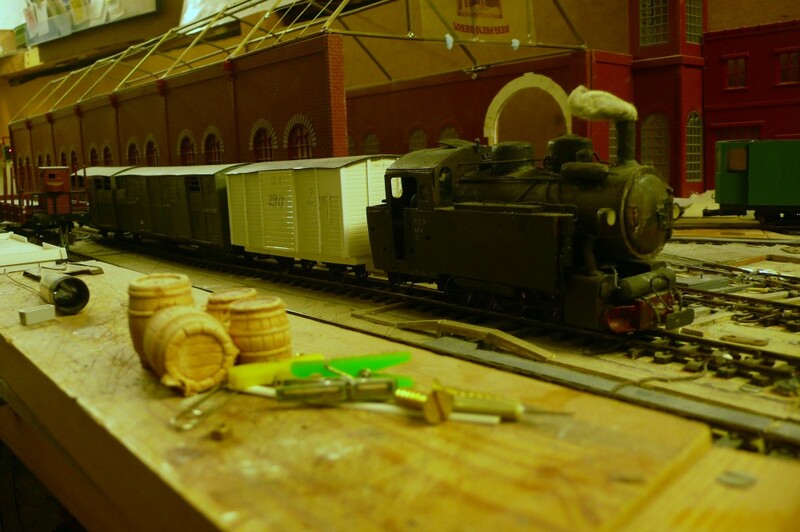 A few minor repairs were carried out on both the track and the locos. The scenery also requires attention. Running a hoover nozzle over it is a double edged sword. On one side of the coin it freshens things up, on the other anything not very securely fixed soon disappears! Here the swing bridge at Eromarbordo has been opened to allow access to the creek to dust it. The crude alignment bolt is clearly visible on the bridge deck between the road and the railway. 2. 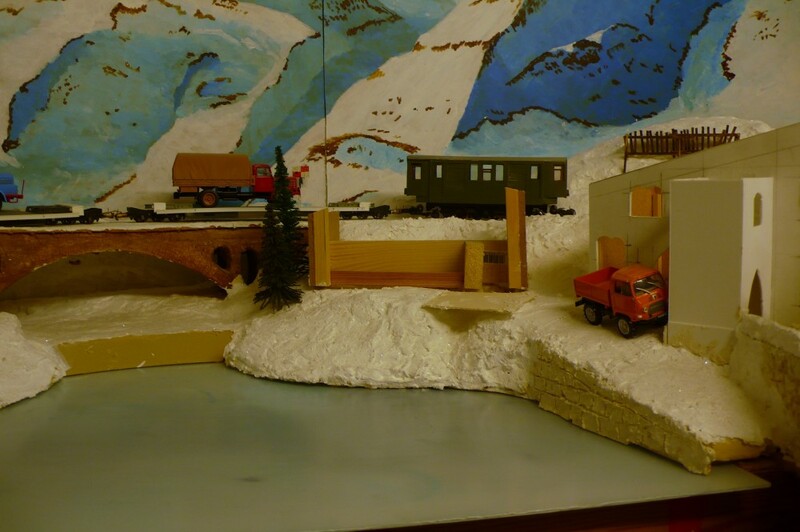 The snow scene has only recently been prepared but doubtless it will demand much attention in the future. This rickety snow fence is the latest addition. The balsa glue, bought from a well known manufacturer, acted as though it mainly consisted of water. 3. There is some continuity with the previous session in that the 2-8-2T is running the big rotary down the north side from Ospicio. It stops at Caladonno's home and proceeds at caution as directed by the Instructions for Working (a cross between the Rule Book and a Sectional Appendix). It will not meet anything in the thick snow! The plough is a bit bright and reflects modern practice on the Rhaetian. I suppose it might not have been so garish in the sixties. 4. The diesel takes the smaller rotary down the south side to clear the line. This run is a little more incongruous in that the scenery is either modelled in Spring, as here, with the ice and snow melting, or high Summer. The van is the munitions van for Jakarutu which was wrongly carried through to Fenditavalat in the last session and which Control insisted was taken back over the hill in the middle of the night. One interesting point was that the "snow drifts" (see session 2 photos 1 and 2) have an electrically conducting back side causing much fun in tracing the shorts until the penny dropped! 5. The AFK normally wakes up at 02.30 when the Urteno goods leaves Relforka. The new 0-8-0, still on acceptance trials, never got the trial run it was promised. 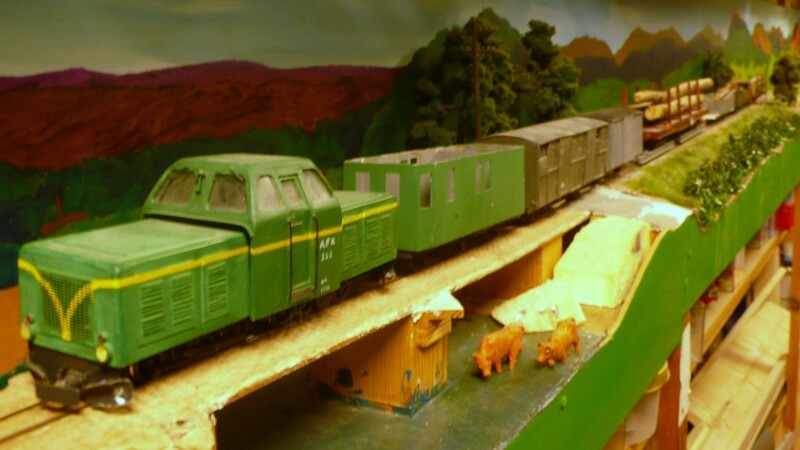 Relforka shed have sent it out on the goods on the principle that "It's a freight loco. Lets see what it does without being nannied." 7. At the same time the Lacono pilot struggles to assemble the local goods and make space for the Urteno goods. The new floodlight pylon (which will eventually be supplemented by a mate), has a distinct twist in it and was awkward to assemble due to the nature of the plastic used in the kit. Still, I can remember the bent pylon at Fenland Park (the old home of Wisbech Town) and this one has nothing on that! 8. Having come off Aspargo (Lacono's shed) at 03.45 the Vulpafaŭkangulo banker/Urteno pilot today is 0-10-0T number 909. 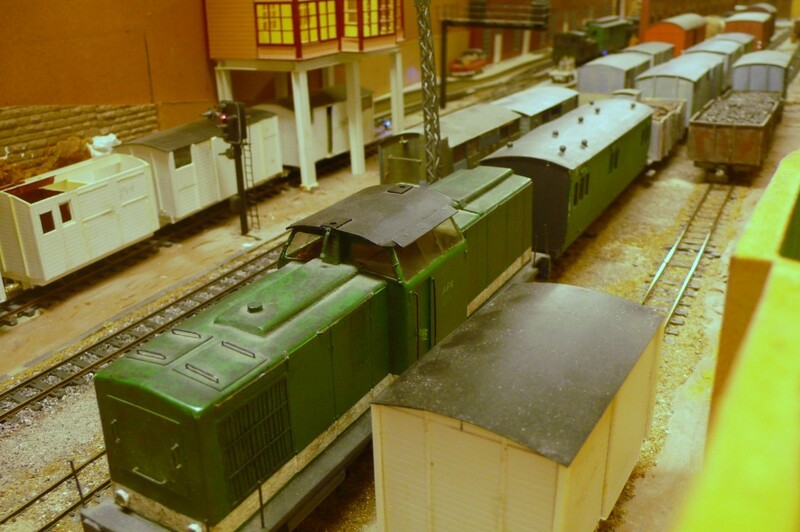 It will trip the four vans into Urteno without a brakevan as allowed by the regulations. One of these is a van of tinned foods wrongly delivered to Lacono yesterday. One objective in this session is to crudely rough paint all the white styrene vehicles to increase the impression of completeness. 9. 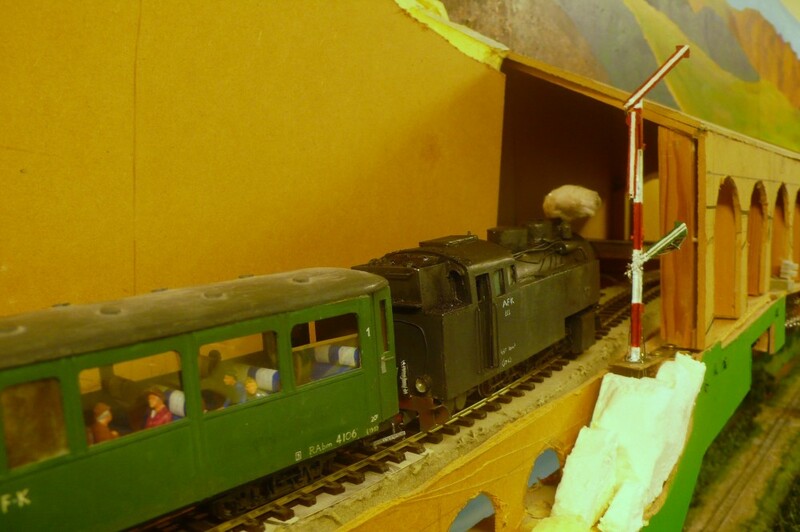 The cement train reaches the top of the bank to find the home for Ithilarak in the "off" position. This is the first train past this newly installed piece of equipment. Due to the steepness of the bank a sign will eventually be installed to indicate "No Dead Stop". Hopefully the avalanche shelter will receive a portal at the same time. At this time in the morning the station is unmanned and the train usually creeps past the signal ready to stop on sight. It has a clear run this morning because the plough crew operated the frame once the train had entered the section and released the controls. 10. The 0-8-0, provisionally allocated number 818, pulls into Gasafabrikatastrato yard on time with the Urteno goods. 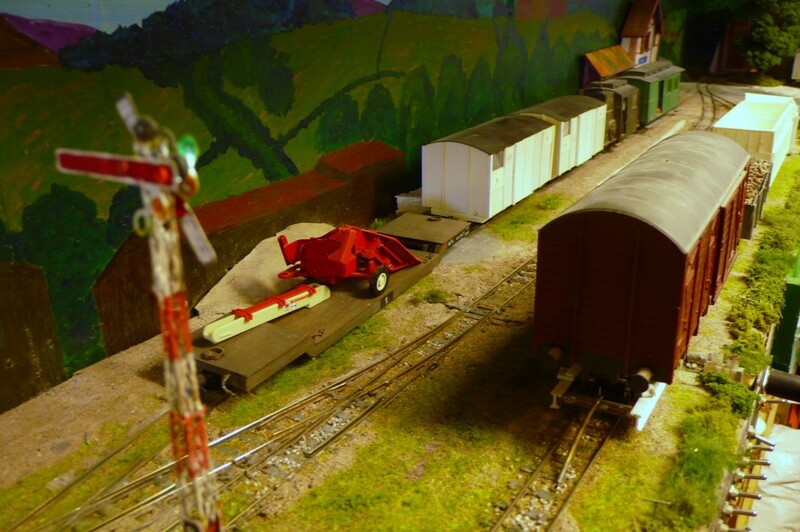 As usual the three road yard is overwhelmed with traffic and the pilot has pulled a cut of wagons onto the main so that the goods train can enter the yard. 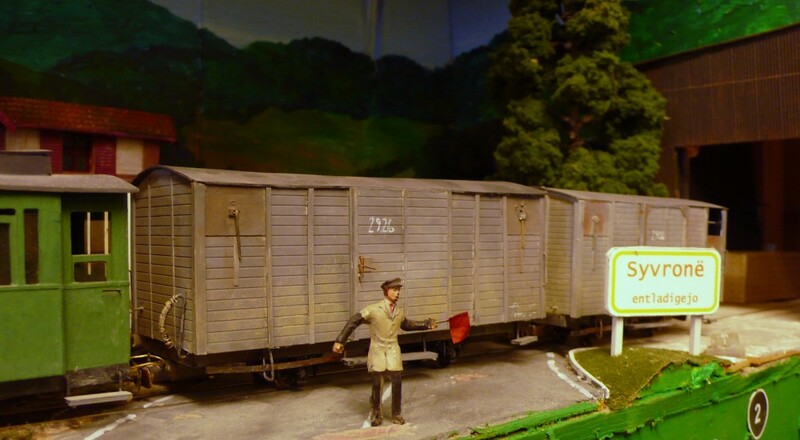 It consists entirely of SG wagons as is often the case on this service. Once it is inside the local Kasatritikakamparoj goods on the near road will leave. 11. The following Fenditavalat goods crosses the Kasatritikakamparoj in the early morning darkness. 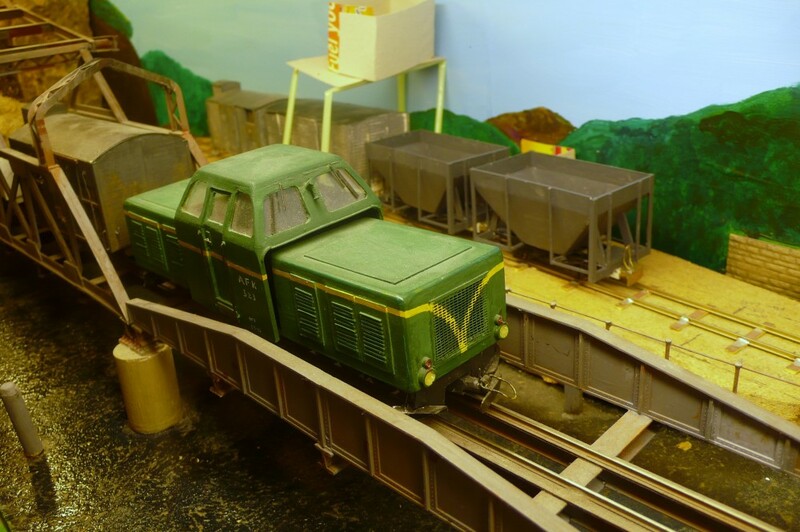 It too has a number of SG wagons in the consist including a bogie flat to take away some of the forestry products backed up in the upper reaches of the line. Control have insisted that a large diesel is turned out for this train due to the snow in the high passes. The rabbits give an indication of how the local ganger supplements his income. 12. The cement train marks time at Cadsuiane-Fanhuidol. 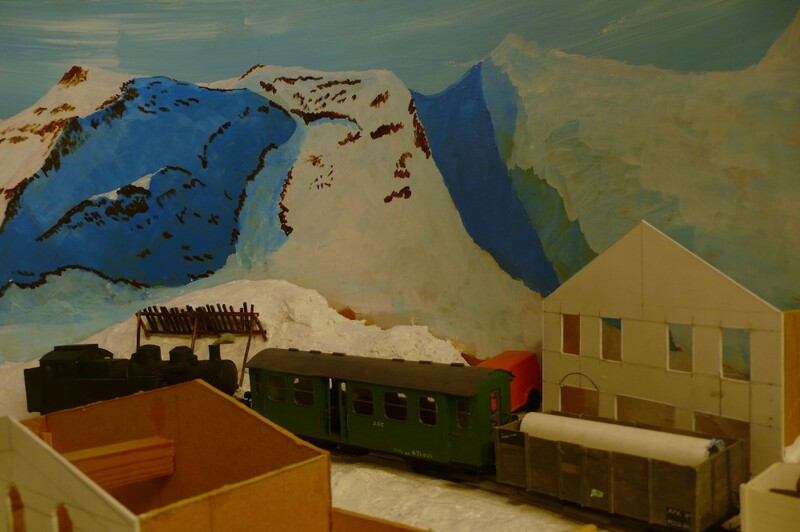 There is supposed to be two or three feet of snow at this location but it is not possible to change the scenery to reflect the winter season so this area is modelled in high summer. The train is being held here as the station is a block post, although there is no loop. It is waiting for the snowplough to clear the line to Ospicio. It eventually left 20 minutes behind time with the engine and transmission screaming as it restarted the heavy load on the stiff gradient so there will not have been too much sleep for the station staff tonight! The train faces the prospect of losing more time waiting at Ospicio for the plough coming up the Orbon valley. 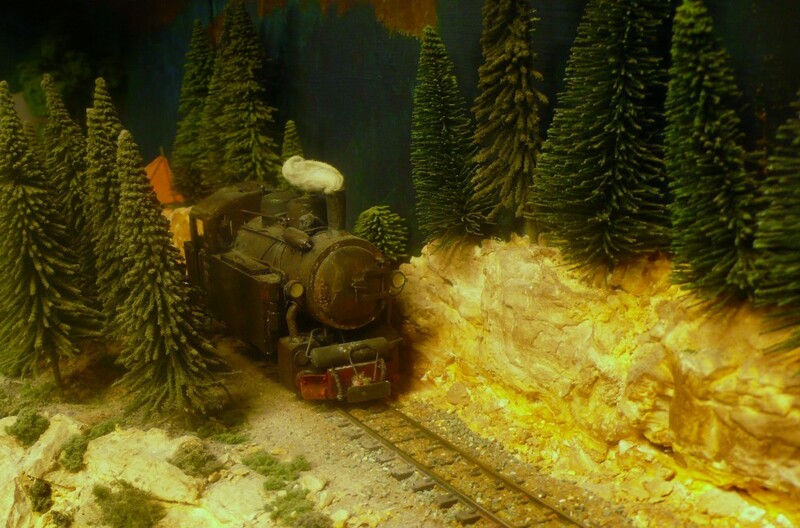 This is one of the operational problems that I wanted to simulate in running a busy railway over a high Alpine pass. 13. 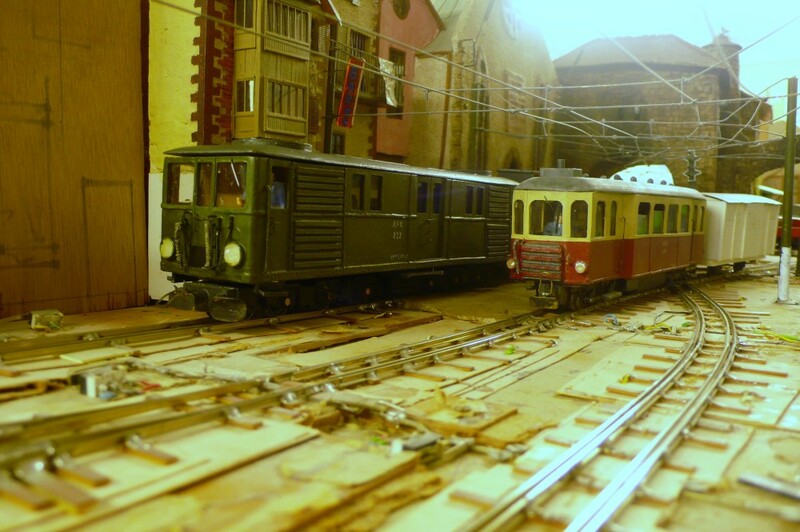 At 05.06 the Urteno goods, by now reduced to just a single SG van and brake, pulls into Urteno. The 0-10-0T has fished out the reach wagon and is already pushing this onto the apron to unload the ferry. 14. In a well tried and trusted set of moves the motive power from train 2401 runs round its train before the ferry is "pulled". 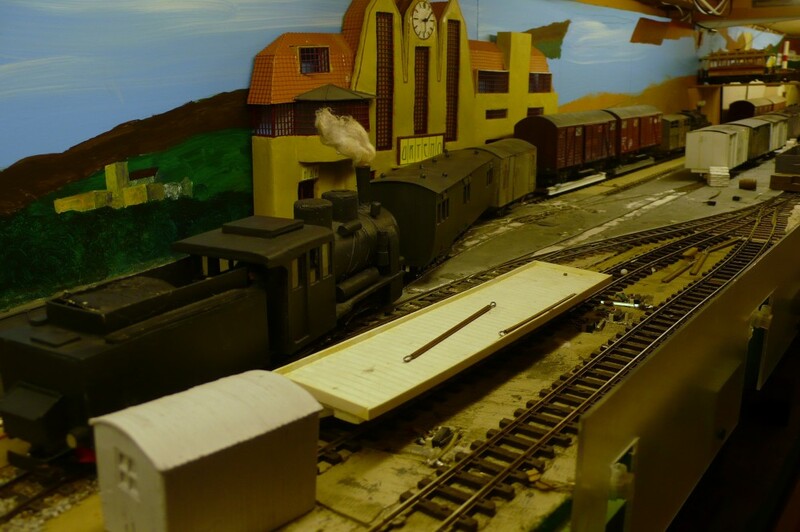 This provides the station with locos at both ends and helps to avoid too much congestion. As I have remarked before, these sort of working procedures were carried out every day and railwaymen knew what was required to get the job done. It is often difficult to replicate this on a model, especially if it operated infrequently. 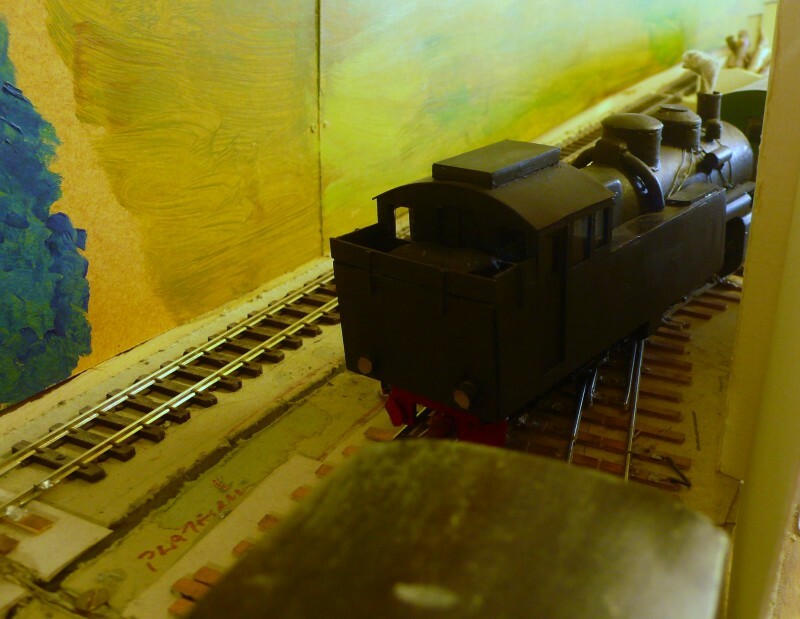 The 0-8-0's engine has put the reverser across and is about to back down onto its train. 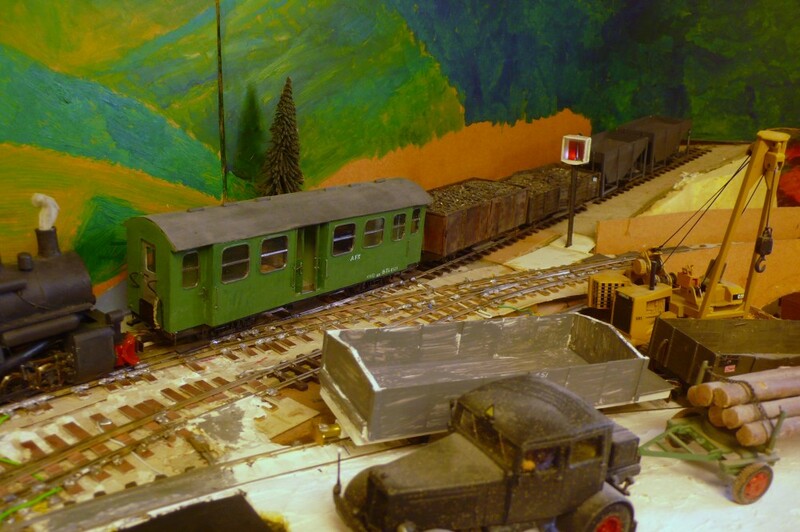 The pilot's crew have wasted no time in pulling the wagons up the steep slipway into one of the loops. 15. The reason for their haste is apparent because train 1106, the Urteno-Relforka local, which conveys mails, is booked to leave at 05.18 having made its connection with the ferry. This is a "railcar" but the AFK's ambiguous stance towards this appellation has been commented upon previously. 16. Meanwhile another ritual plays out at Lacono Cittavecchia. 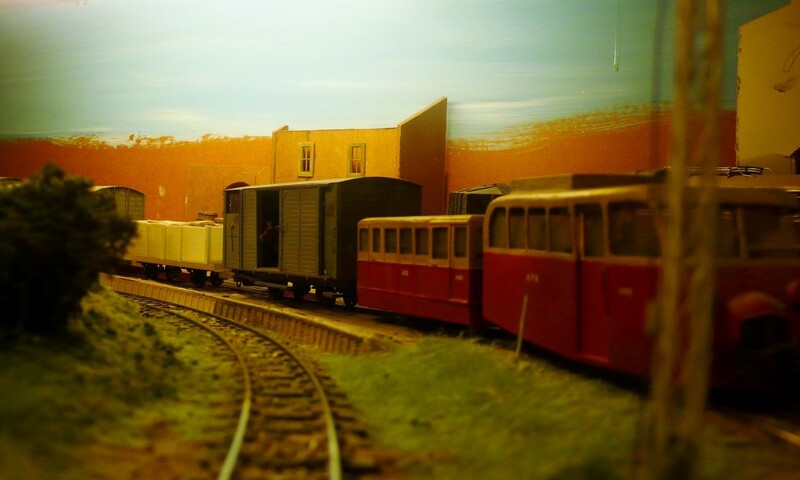 The schools' railcar waits to pull off shed whilst the station pilot temporarily abandons the chaos in the yard to marshal the additional coach and postal van for train 1106. The usual order has been reversed today because of the train make up. 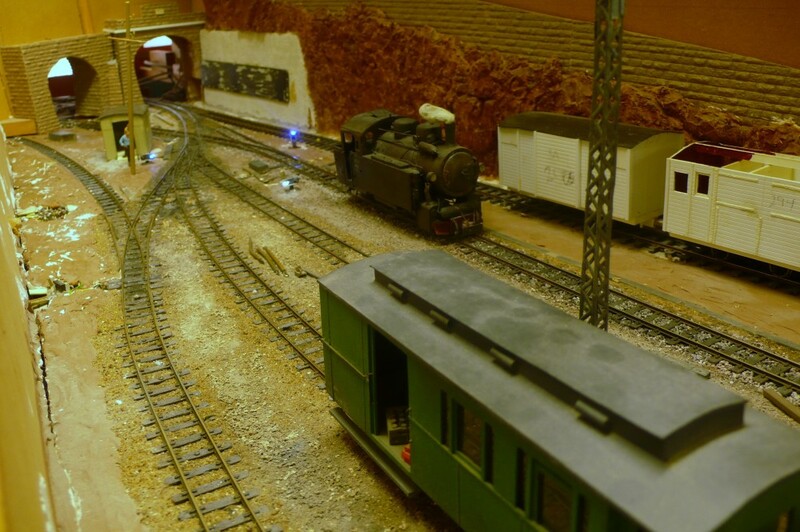 The shunt signal has 'automatically' gone back behind the move. 17. The Fenditavalat goods is running 20 minutes early because there was no need to transfer traffic for Sojonno onto the KTT goods. This is quite a common occurrence and so the driver approaches the station at caution because the schools' railcar actually leaves from the goods yard. The 05.32 booked departure ensures that it often leaves empty. Those who have followed previous sessions will appreciate that it only carries schoolchildren over the latter stages of its journey and acts as a general dogsbody before reaching Ithilarak. 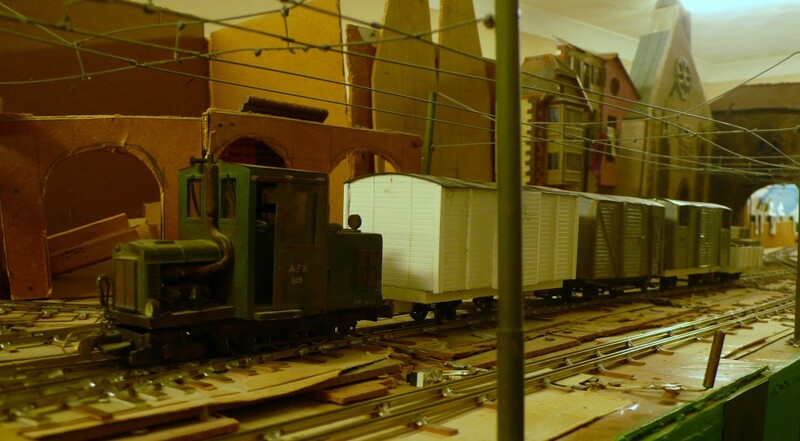 The stake wagons have momentarily been left at the goods shed to await retrieval and transfer to the Danulbo industrial zone. 18. At 05.00 Fenditavalat's residents get their clarion call as the pilot pulls into the Basabazaro with the trip working from Rivabordo. 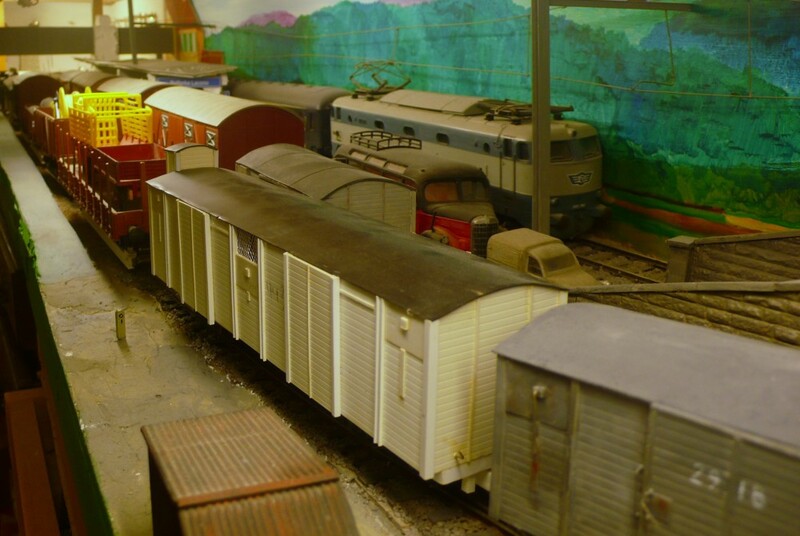 This consists of two empty wagons to cover outward bound loads from the blanket factory and one inward van of wool. The open contains military equipment for Jakarutu. 19. The congestion in the Lower Market at Fenditavalat is such that the railway would most likely have been removed during the 1960s. 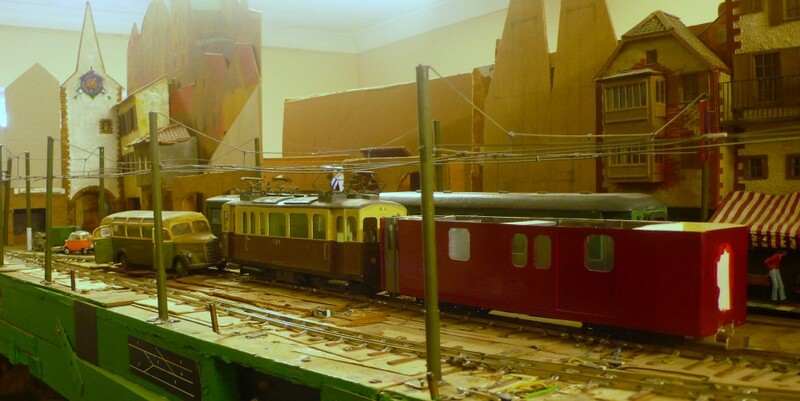 On the right the cement train has just arrived, in the middle the mallet loco and part of the Relforka goods stands in front of the pilot whilst the remainder of the train stands in the loop at the left. The three phase wiring shows up nicely. The solder blobs are supposed to be insulators! 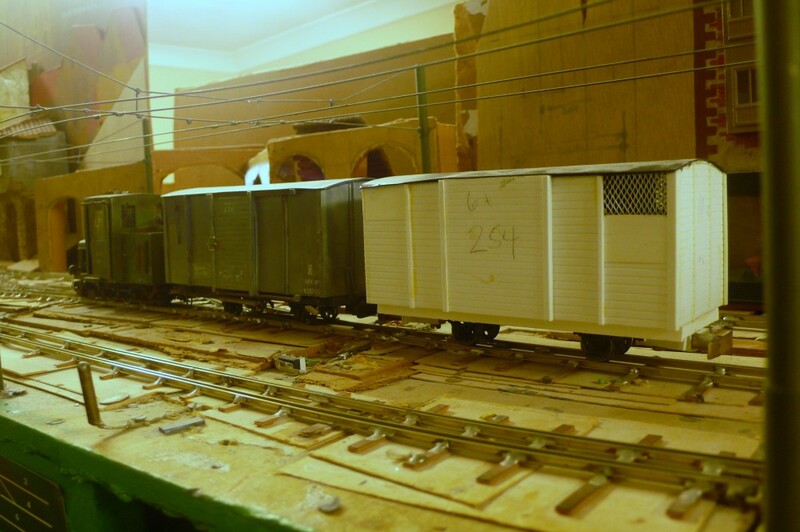 Having assembled the train in the yard there was insufficient siding space to pull it clear of the yard points hence the convoluted manoeuvres necessary to re-assemble it. 20. The ploughs wait in the clear at Ospicio d'Helcaraxe. It was more by luck than judgement that two separate goods loops were provided but it has proved to be a useful asset in dealing with the snow fighting equipment. 21. The Kasatritikakamparoj local has begun its work at Boursson. Any motorists wishing to use the RN424 can expect a twenty minute wait as the train shunts the canning factory. How much use a red flag is, shown on one side of the train during the hours of darkness, is open to question! I suppose that the trajnaĉefo should have purloined the train's tail lamp. 22. The trajnaĉefo has other things to think about. The agricultural machine (a maize harvester) supplied yesterday still awaits unloading and has been "respotted". Behind it stand a van of canned goods that should be in the train and then a prepared van for a cattle load during the afternoon. In the foreground the SG van is at the front of the train to go to Sojonno, where there are, of course, severe restraints upon the loadings that can enter the steeply sloping siding. 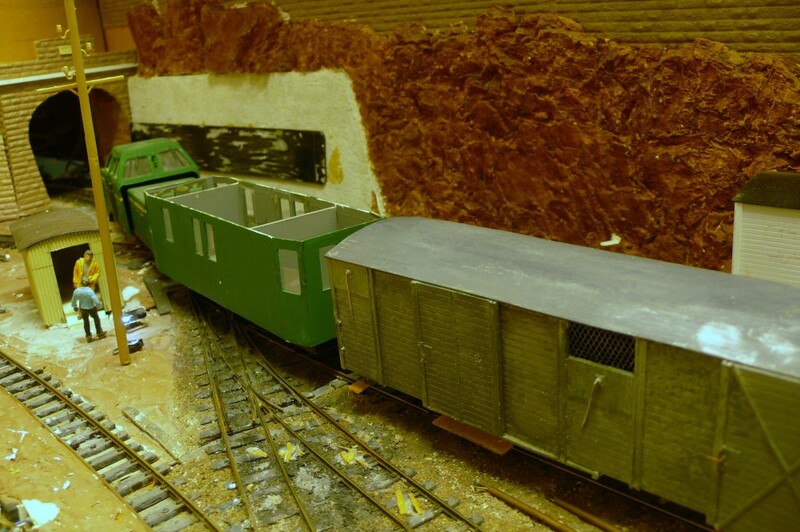 The rear of the train is formed of two wagons for Breĉo de Glissent which are in the right place to access the sidings. 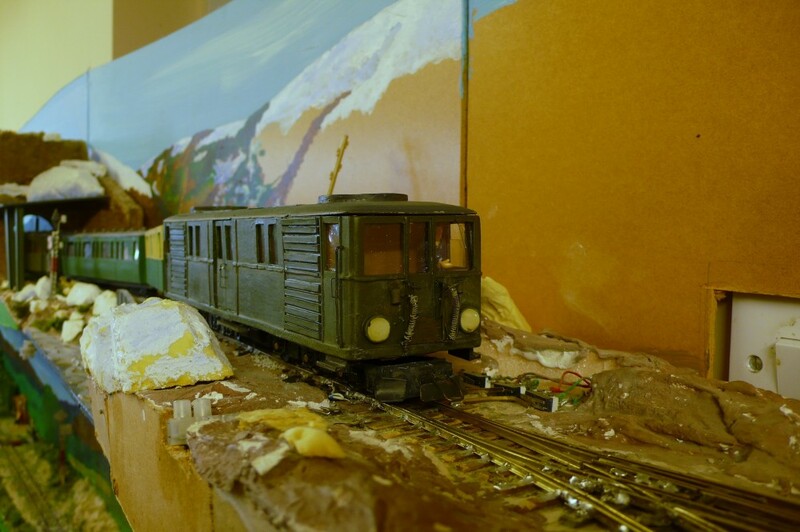 The question is, bearing in mind that the down railcar will soon be approaching, do you run into the loop and wait for it to pass or do you go into the goods loop? 23. The crew have cut their losses and have opted to go into the goods loop to fish out the van of cans. This will make working at Glissent slightly more difficult but there is still the Co-op siding to shunt and time is getting short. There is also little chance of pulling time back at Sojonno today because there is traffic into and out of the factory there. 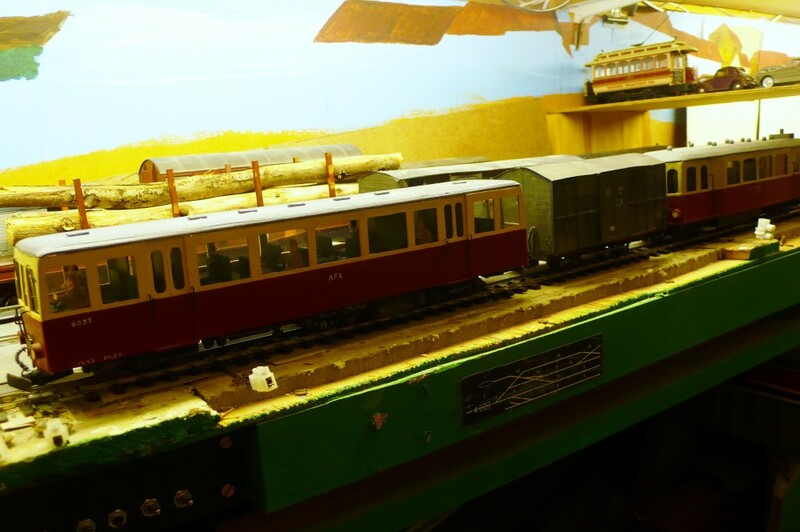 The crew have cleared the main with more than the 5 minutes to spare, as recommended by the Instructions, replaced the point lever keys into the locking frame and worked the block instruments before clearing the signal to give the railcar a clear run. The chances are that they will already be over the main road with the loaded van before the railcar leaves. 24. The Fenditavalat-Relforka goods pauses at Caladonno so that parcels can be loaded into the crew van and any intrepid passengers can join the train. The first wagon is a load of pipes for Ithilarak that was carried past its destination yesterday. The limiiting factor for trains climbing between Fenditavalat and Caladonno is the loop length at Fenditavalat, which caused the problems shown in photo 19. From here onwards the cold weather adversely affects the loco's thermal efficiency reducing the tonnage that can be taken to the summit. As this equates to FDV loop's length this does not cause too many problems, although in normal circumstances extra loads would be tripped out to the CDN loop (here) for attaching. 25. The morning railcars cross the road/rail swing bridge as they leave Eromarbordo. There was no need to wait for the freight train this morning as it was annulled. There is not much traffic for Eromarbordo today and high tide, and hence the fish loadings, is not due until after midday. The afternoon freight should be able to cope. 26. As is often the case, early morning at Urteno sees the track layout taxed to its limits. 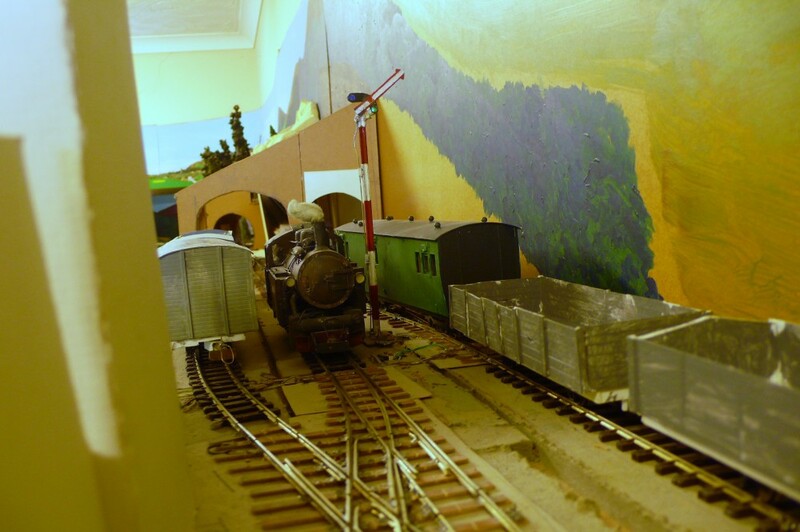 Although the prototype was circumspect in providing expensive underused facilities the AFK, like most model railways, pushes the boundaries regarding what could be achieved on the track available. 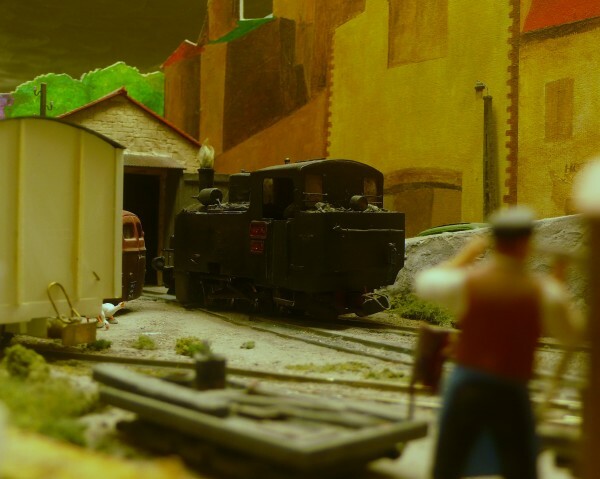 Matters are held up by the need to wait for the railcar's booked departure time before the 0-10-0T can pull out of the goods shed loop to allow the goods train engine to push its cut of wagons in. Tonnage capacities are limited for trains climbing the Vulpafaŭkangulo and this train allows a few extra wagons to be tripped up the hill rather than waiting and occupying space on a conventional service. 28. The casual attitude of the AFK towards road crossings is illustrated here as the URT-RFK service leaves Boursson. A couple of cross bucks and a sound on the whistle are the only warning that the tractor driver receives. The area has become more wooded recently which further restricts sight lines but the locals are fairly sensible and manage to avoid the trains. 29. 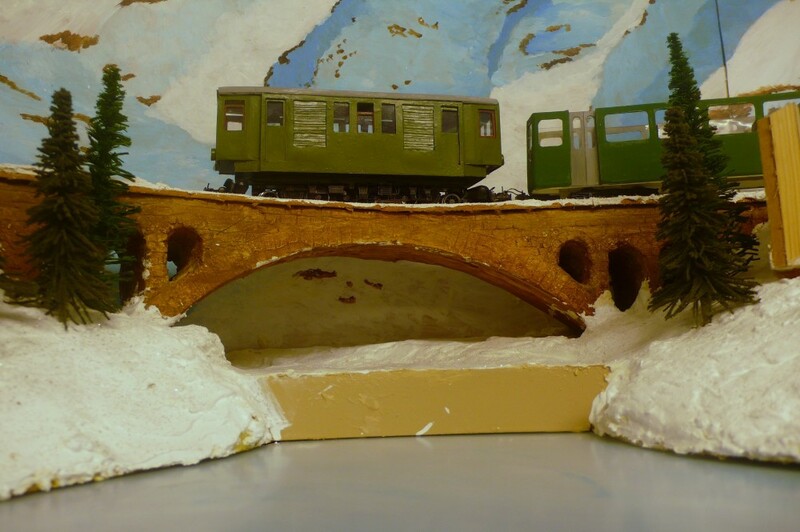 The ITH-FDV snow train leaves Ithilarak, crossing the viaduct over the Aepto. The early morning service is provided for any lorries that have made it this far along the RN424. 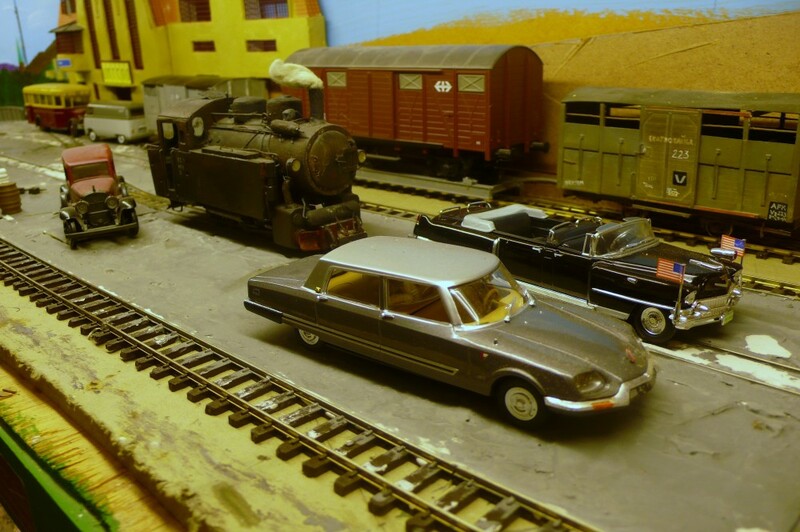 It would be nice to have a much longer train but the usual model railway restraints apply. 30. With both up freights having passed by and the local LAC-RFK freight having left the yard, staff can begin restoring some sanity at Lacono, even if only lasts for a short while. 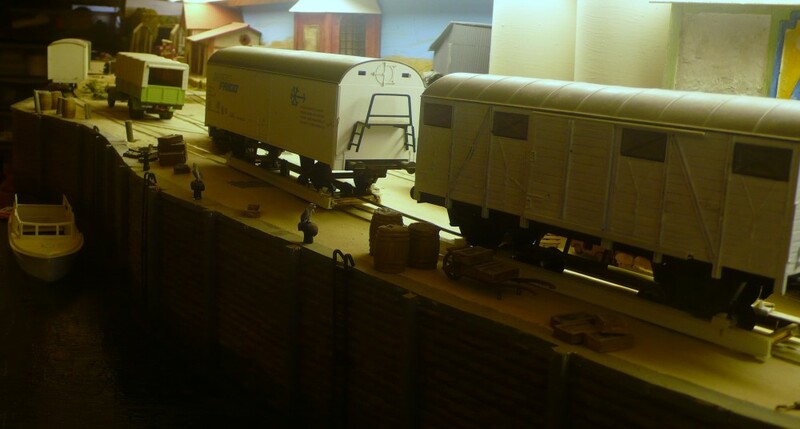 The pilot pulls the wagons due to go to the Danulbo industrial quarter out of the goods shed so that the incoming SG vans at the left can be pushed in for unloading. The 24.00 to 08.00 shift on the pilot does not allow too much time to watch the world go by! Not much longer now before the fireman can unload his bike and cycle home, although life could be worse. At least the loco is oil fired. 32. ...As a result the train is piloted from the front. I am unaware of any banking operation where NG locos attached to the rear of trains carrying SG wagons. It would seem likely that all such trains would be double headed as appears to have been the case on the Bulgarian and Polish NG. With no DCC the train engine had to reverse about three inches onto a separate electrical circuit to allow the pilot to attach. This is an 'uncharged technical timeout' where the clock is not moved. All moves are recorded against a click clock and charged at three minutes, as outlined in the Operating articles on the website. The legitimate moves have taken so long, however, that departure will be roughly ten minutes behind that shown in the WTT. 33. The snow train passes the 'Star of Bethlehem' with the home and distant off. In the WTT there is only a two minute window between the arrival of the FDV-RFK freight in which to achieve this and the common practice, as noted before, is to hold the freight outside the station and let the train coming up the hill have the priority. The freight is booked for time to attach wagons at Caladonno which it often does not need, as today, and so it leaves early and stands in the clear. The locking prevents both homes being off together. In reality there is no locking and no down home but a signalman's common-sense dictates that two trains cannot arrive simultaneously. 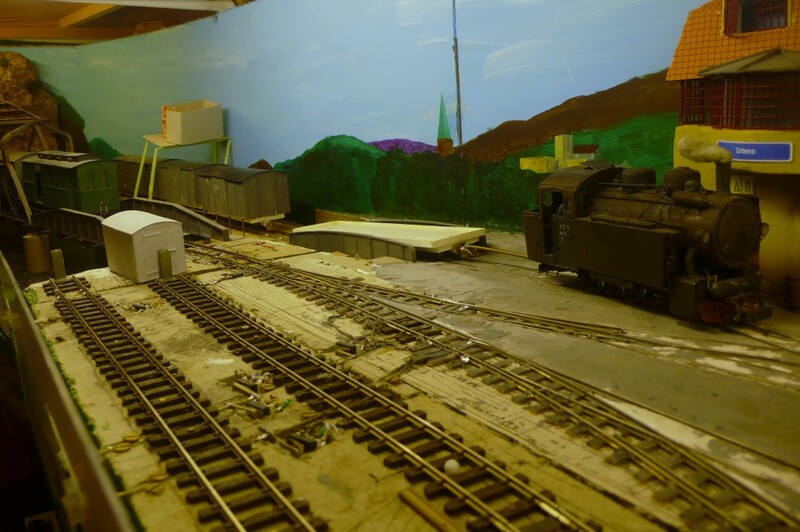 Such scenery as there is here was completed some time ago and like so many other areas of the layout could do with some attention. 35. Needless to say the ERO-URT train gets checked as the distant is "on". The distant, barely visible in this photo is the yellow diamond. The curate is assiduously doing his rounds in his cassock before 7 in the morning. Perhaps he has a service in a remote chapel if he survives crossing the rickety bridge over the drainage ditch. He doesn't look too sure on his feet! 37. A rare shot of the glory hole that is Aspargo depot (at Lacono). The lake bed at Caladonno had to be removed to get this shot. 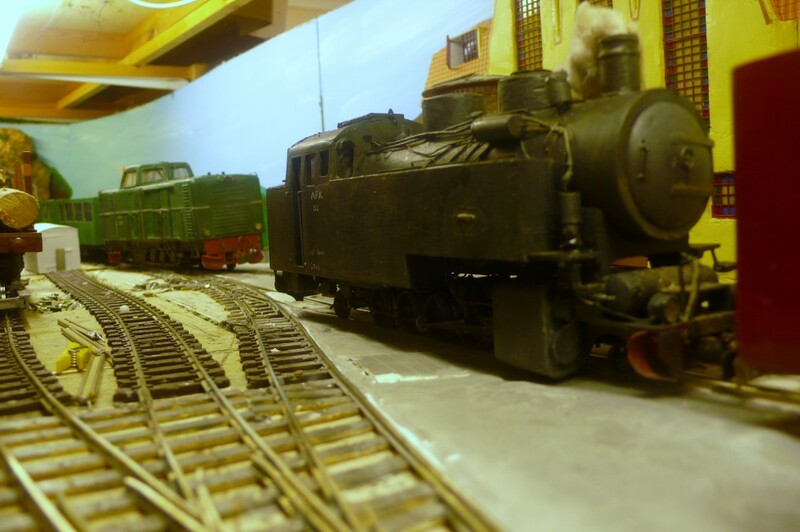 The depot underwent repairs and a rebuild fairly recently which required that a lot of the finished ground surface had to be chipped away. This photo all but shows it in its entirety. 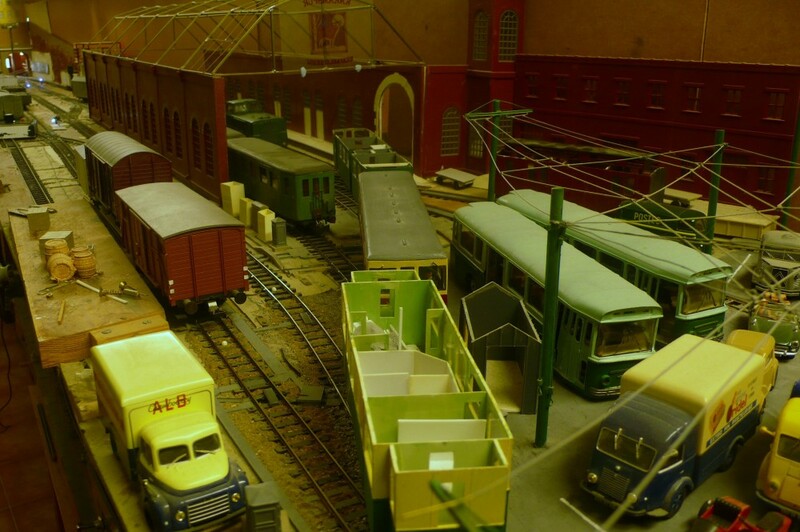 It is very small and simply functions as a dressed staging yard. The 1-C-1 rod drive diesel by the coal stack is the designated spare loco for the day but Aspargo has temporarily gained another spare. The late evening goods which should have continued to Relforka yesterday was running late and last seen in session 3 photo 220. It was cancelled at Lacono as there was only a very light load. It now looks as though there will be too much traffic to forward from Lacono on the scheduled trains so the first "von Ryan" is called to depart at 07.12 to take the excess forward and return the loco to its home depot. 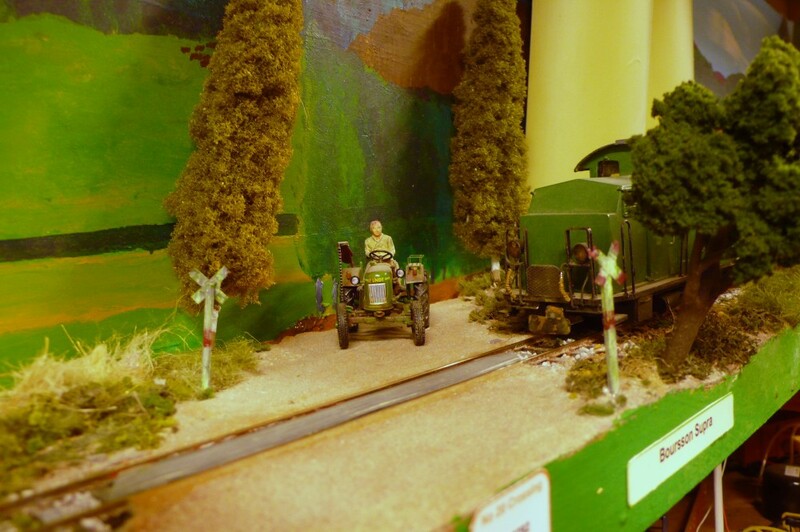 The carriage in the background is the driving trailer which will be attached to the ERO-URT railcar. 38. The frozen lake bed has been replaced, highlighting the black line around the base. There is little that can be done about this unfortunately as it is one of the many compromises demanded by the layout's complex design. The wooden structure in the centre is intended to become a watermill. 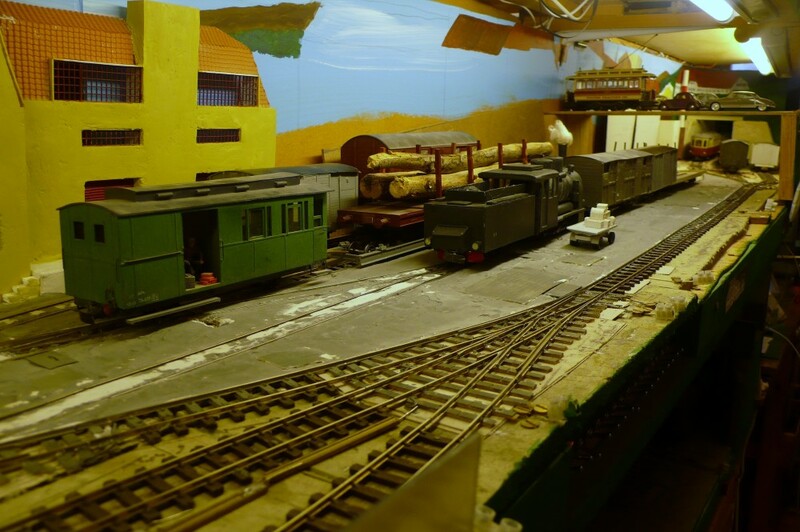 Whereas in the past operating sessions concentrated simply on running it is my intention to keep smaller projects on the go as far as possible in this session so perhaps this will develop as I go along. I used to make more progress before I retired! 39. The extra goods, running as train 9151, leaves Lacono immediately after the railcar has arrived. It will have a long slow journey as it will have to wait "in the hole" at Boursson for the morning up passenger trains to pass. One of the van's doors has obviously been replaced some time in the past. 40. 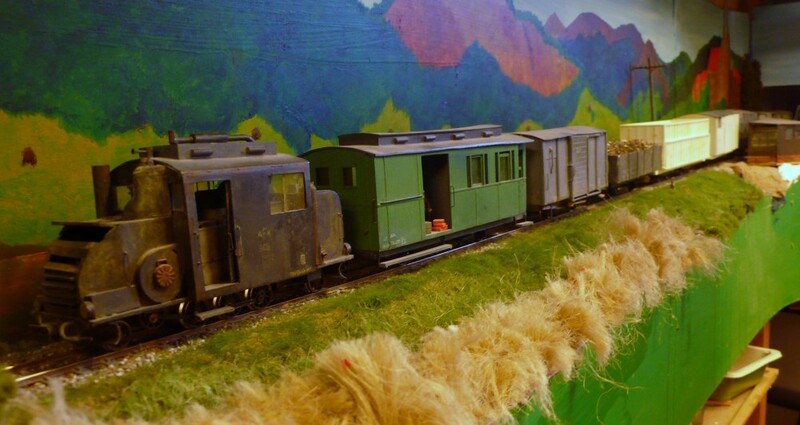 The schools' railcar across the Altingablecaŭtoj is being piloted to Ospicio by the 2-8-2T and plough, although the snow has currently abated. The train stops at Ayleha halt by the Chapel of Our Lady of the snows as this is a regular pick up point for pupils from remote farmsteads in the Maejoroãltyrn, the valley below the railway. It can be difficult to keep track of these obscure little used names on such a large layout so labels have been attached to the fascia to act as reminders. 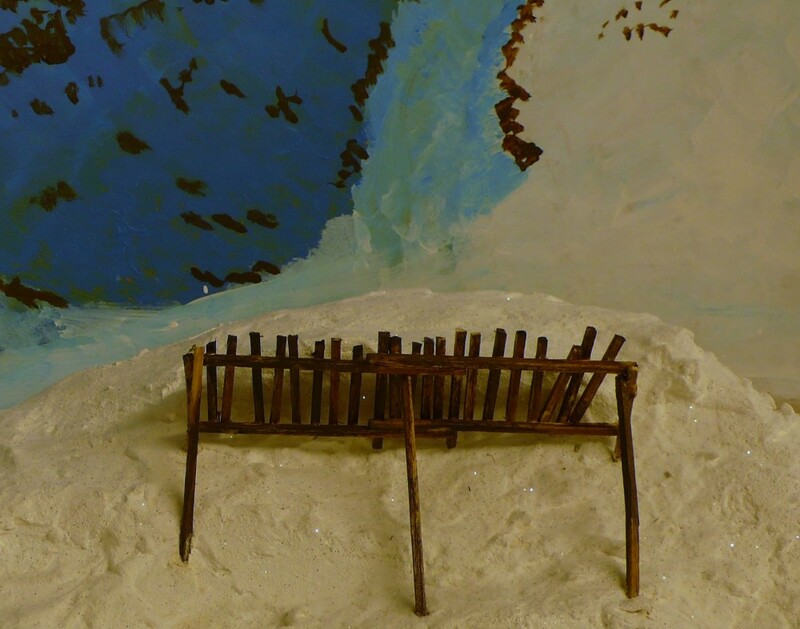 The valley is well known for its cold microclimate and the snow lays in the hollows even in the summer (as the scene is depicted on the model). No doubt the local wolf population will be making its presence known at some of these isolated farms. 41. The KTT goods shunts at the Sojonno preserves factory. 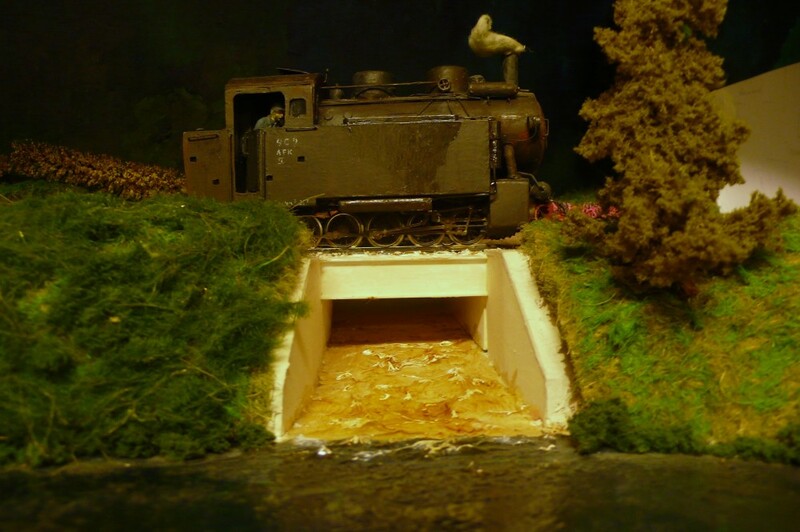 This is an old model from some years ago which was rather too enthusiastically weathered and could do with revisiting. 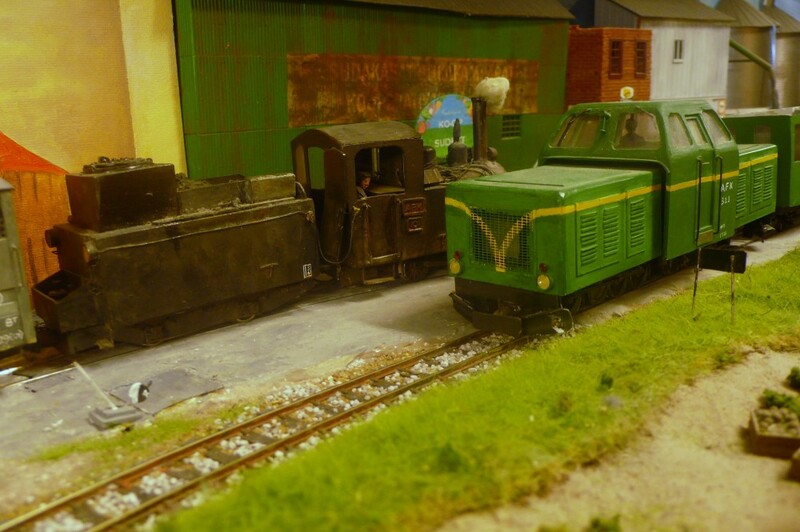 The loco propels the SG van into the yard to pick up the NG van. If it did not do this first the resulting cut of wagons would be too heavy for the class III loco to push up the slope. The work's tractor stands by to help if necessary. 42. The morning goods has been regularly been photographed crossing the fields of the Kasatritikakamparoj so here is another one to add to the collection. It is nice to be able to have a bit of space between stations in which to capture this sort of scene. In operational terms the train often stops on this section of line so that shunting can be carried out at Breĉo de Glissent before its arrival, hence its frequently photographed status. The train can then be brought into the station on the local controller, as required, rather than using the remote controller on its long lead. 43. The RFK-FDV freight labours heavily as it enters Tunnel 231 on the Vulpafaŭkangulo. 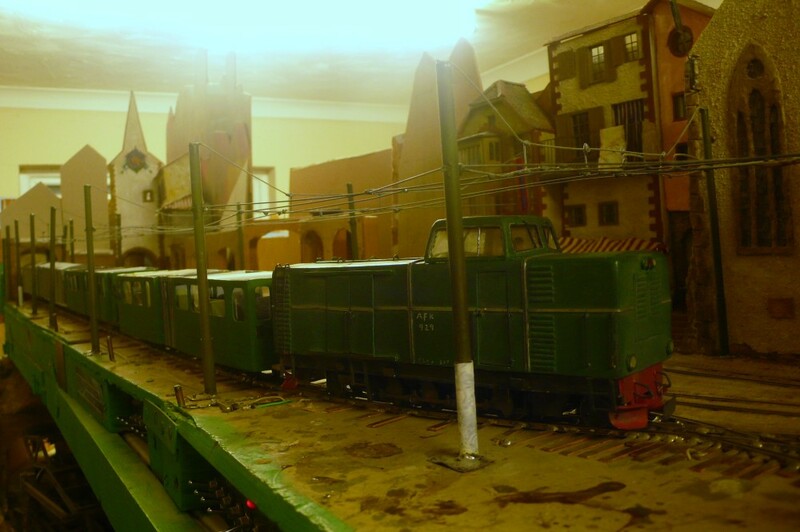 The train is the longest permitted by the Instructions, and with the two locos drawing power on straight DC the voltage is such that it isn't going too fast. The far side of the tunnel (right) has had rock inserted because it is visible from normal viewing angles. The near (left) side will not receive attention. 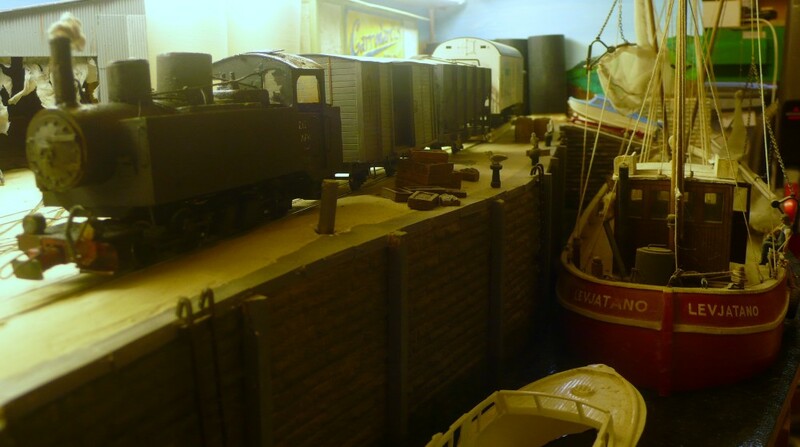 Only the bottom end is finished but once the top is completed the ballasting will be finished. This is not the 231st tunnel by the way. It is just that all the infrastructure, bridges, culverts etc., have been included in one numbering scheme. 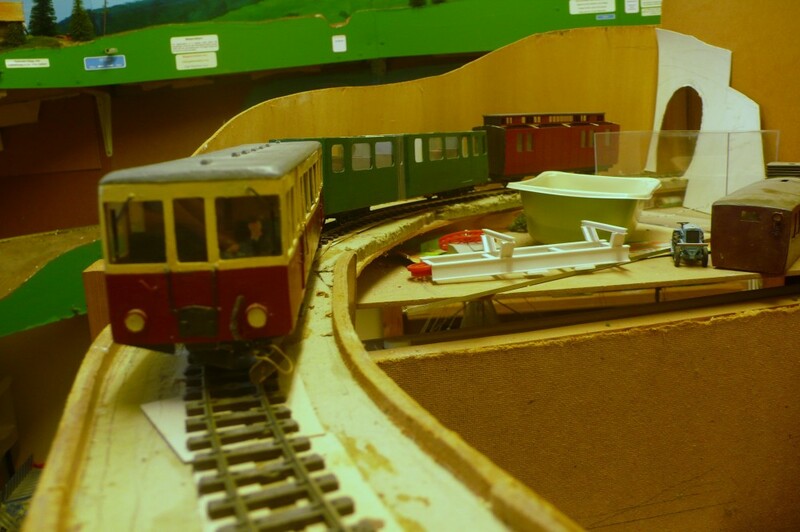 There are plenty of gaps in the sequence to allow for the unmodelled parts of the railway. 44. The pilot and the train loco run into Ithilarak. The train stops at this precise point because the two locos are on different circuits. The rails were cut and an extra section inserted when piloting became mandatory. It still causes minor problems however in that the train will have to pull forward for clearance purposes after the pilot detaches. I suppose that DCC would circumvent this but at great expense and with something way beyond my capacity to troubleshoot. 45. With the train pulled forward there is just sufficient clearance for the pilot to retreat down the bank. 46. In yet another move that would surely gain BoT disapproval the morning railcar backs down to Aspargo from Cittavecchia, complete with passengers, to attach a driving trailer. The continentals were more laid back about these types of moves. In Britain everyone would have been forced to leave the nice warm railcar and stand on the cold platform for ten minutes before its return. 47. 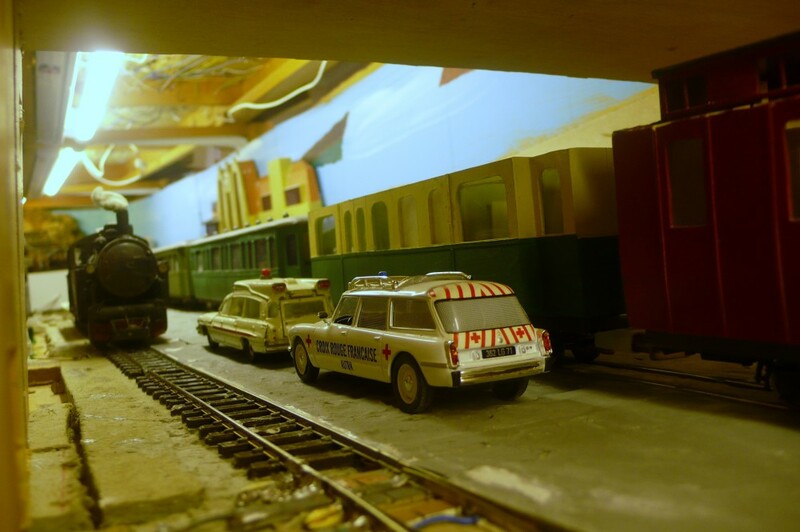 The railcar, carrying the medics going onto the morning shift at the hospital, is held in the tunnel by shunting at Urteno, as is often the case. 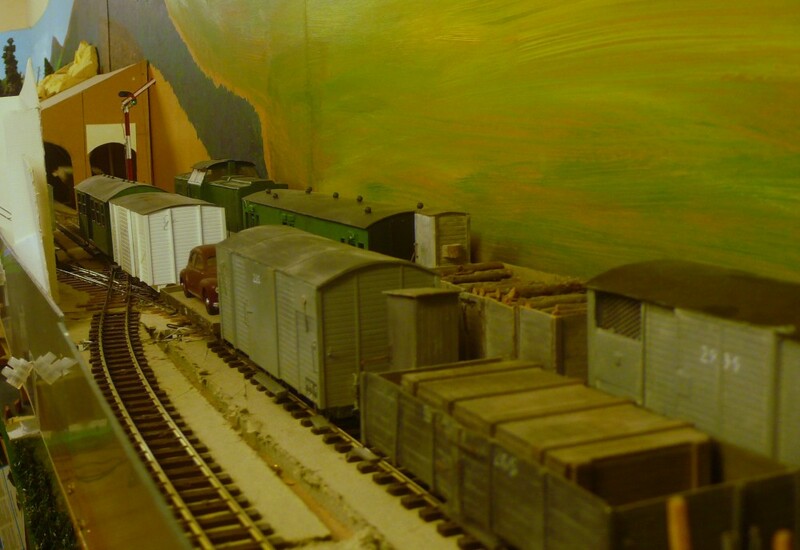 There are a large number of loads to be picked up today so the goods train will be quite long. 48. The CFS schools' railcar has arrived at Fenditavalat on time and will be towed down to Rivabordo by the AFK pilot. This job is usually done by the AFK railcar but as it is running about 20 minutes late this morning this is the easier option. 49. The down FDV-RFK goods pulls into Ithilarak behind the 0-8-8-0T mallet. Some work was carried out on this between sessions including adding a board to expand the bunker's capacity. Performance is still a little hit and miss but better than it used to be. It's up counterpart. sitting on the loop, waits to leave. It will have to shunt at Cadsuiane-Fanhuidol today which may be a source of problems with a SG van positioned at the front of the train. Hopefully everything will perform as intended! 50. 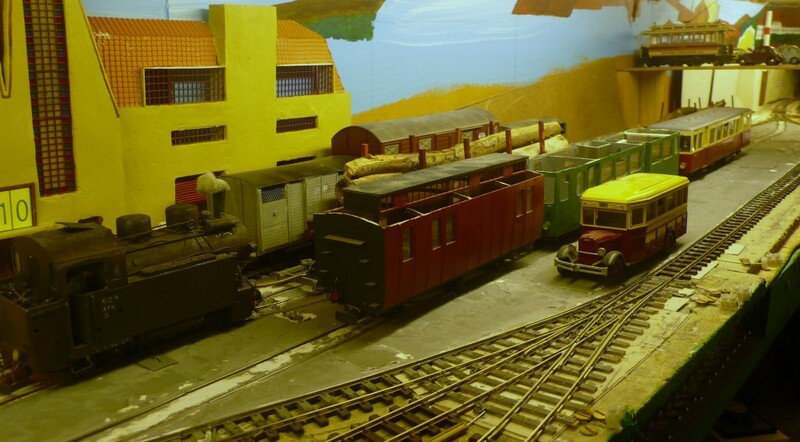 Having tripped the three SG flats into the factories, (last seen in photo 30) the Danulbo shunt returns from the industrial district with four SG wagons on transporters, two vans of carpets and two flats containing agricultural machinery. No attempt is currently made to keep tabs on how long the shunt moves take but, now that the Instructions have been published, it is intended that this will be done in future sessions. Those frequenting the Kaprapordego (Goatpen) at his time of morning are used to seeing large railway wagons in the middle of the street. The machine at the front of the long flat is a type of silage forager I believe. The somewhat unusual street name reflects its one-time pastoral connections. 51. 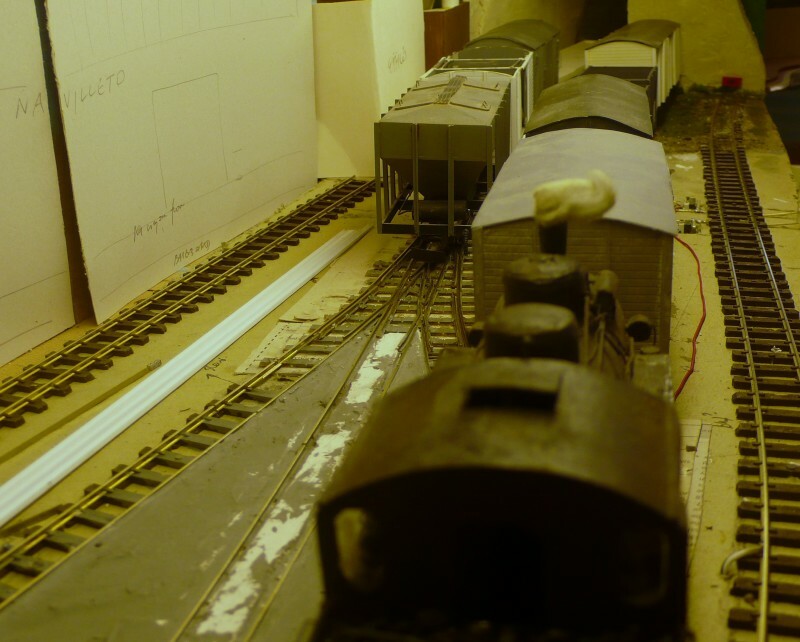 Having taken the wagons into Gasworks Street yard and retrieved some others out of the sidings, there is some debate as to how much of this it will be possible to forward on the two morning trains booked to take traffic from Lacono. 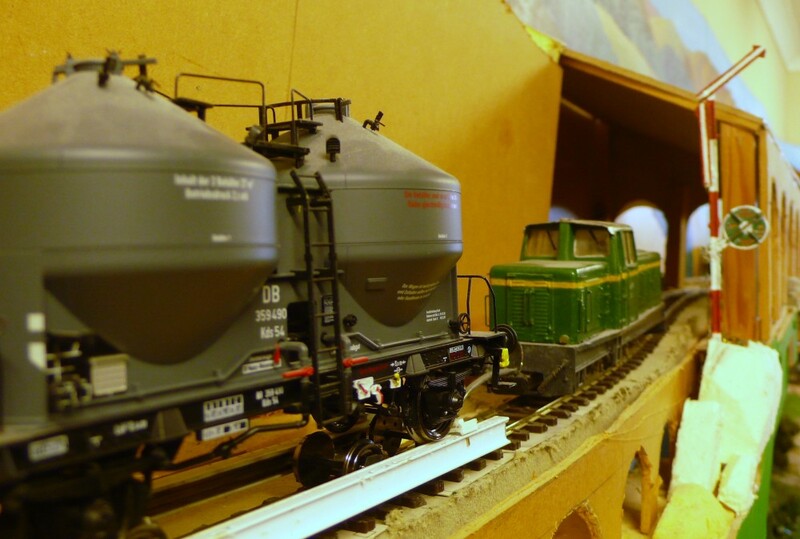 The Urteno train is running near capacity and there may not be too much space on the FDV-RFK goods either. Whist it is standard practice to hold some wagons for afternoon services this quantity of vehicles will overwhelm the yard. It may yet be necessary to run another special. 52. The local goods across the KTT has just arrived at Glissent, on time rather than early as is often the case. 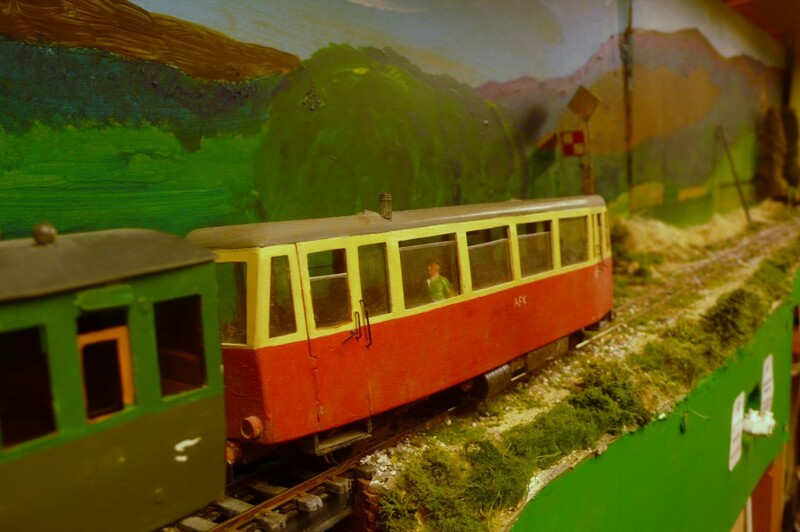 As soon as the schools' railcar has left the crew will begin to sort out their train which is not in an ideal order for the work to be carried out. There may not be time to eat at the Golden Perch this morning! 53. By now the two passenger trains connecting with the overnight express are lined up at Relforka. The connection is running on time today, something of a collector's item. 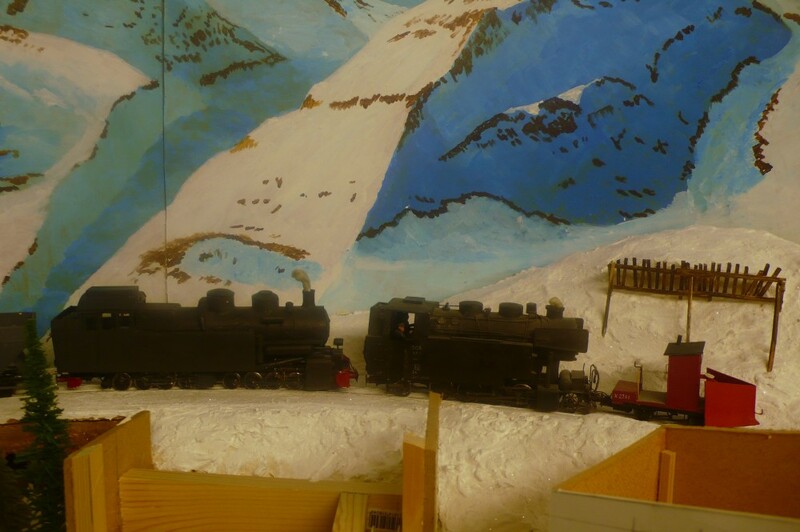 The local waits behind the 2-6-2T and the 2-10-2T stands with the express, which carries a Pullman at this time of year to take upmarket passengers to the winter resort of Urteno and the ski slopes. The express loco received attention during the last shut down and is now supposed to be complete. 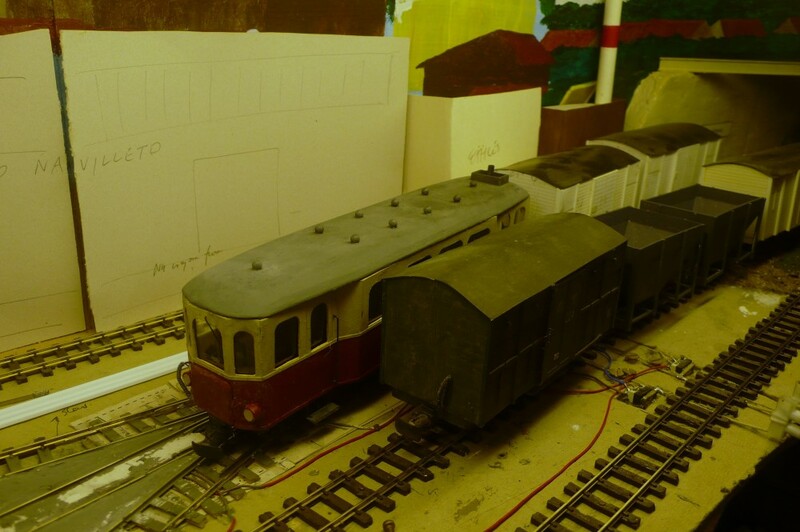 She was finished in a 'used but clean' state in contrast to some of her freight orientated sisters.The railway bus will give a faster connection to Eromarbordo than the railcar from Glissent. 54. Cadsuiane-Fanhuidol is one of those minor places on a large layout that just seems to get overlooked. As was noted in the last session an attempt to isolate a locomotive in the siding failed and a new section had to be put in. 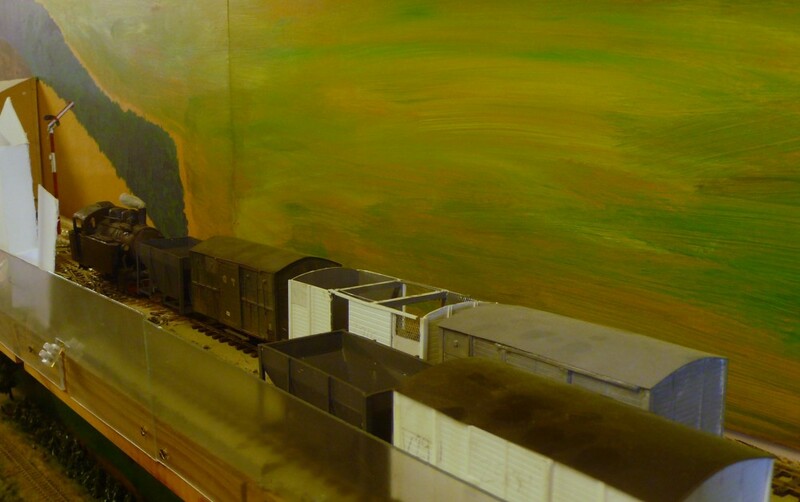 In this session my main concern was that the transporter would ground running along the siding but this did not happen. Instead the SG van caught the overhanging side of the station building which surprised me as I remember testing it for clearance against the big Co-Co. The envelope must be slightly larger. The building was removed and repositioned to allow the SG vehicle to pass. Thankfully the scene is not completed and the exercise did not create too many problems although a clean up will be needed. 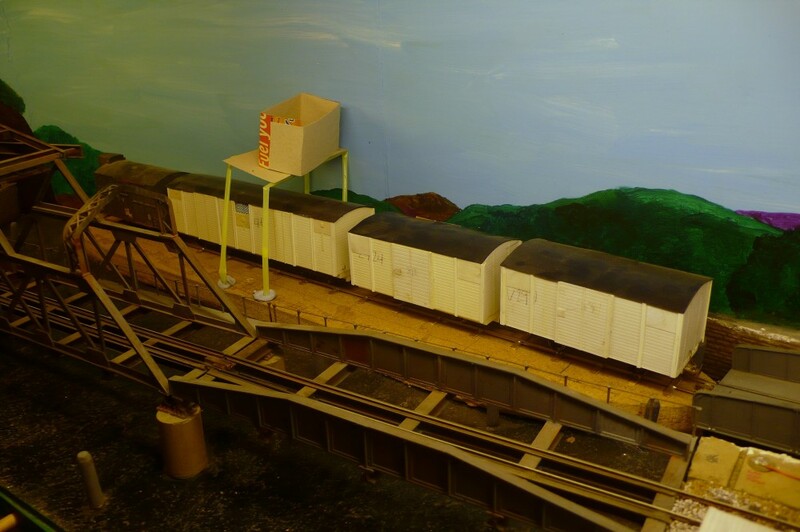 In the past wagons for the siding have been placed at the front of the train so the Instructions might need altering but then again they may not. 55. 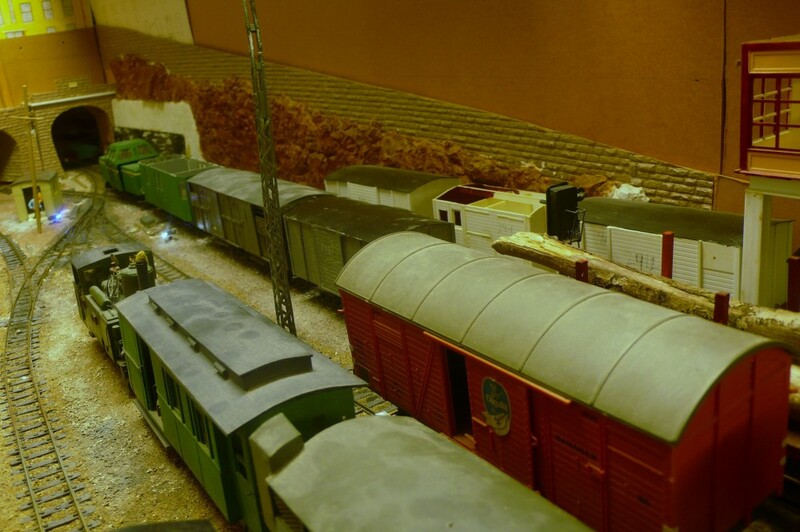 The siding is now crammed full of wagons. Three is the maximum that it can hold (bogies count as two) because of the curvature and it has often stood empty for "weeks" on end. 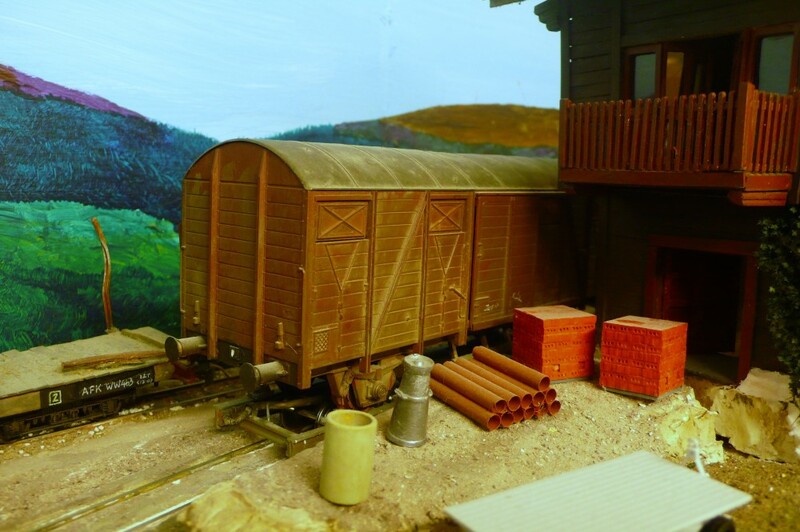 The bogie timber wagon, which itself is not much used nowadays, has been sent to pick up a load of logs. The open has been left 'just in case.' The loading probabilities tables for Cadsuiane and Varden have recently been tweaked to generate more traffic during the winter. No traffic came from Varden 'yesterday' and none will leave 'today'. These are minor players in the overall scheme of things and provide a contrast with the heavy hitters such as Lacono. 56. The train is only booked for 20 minutes shunting at Cadsuiane-Fanhuidol and this particular shunt took 48 minutes. 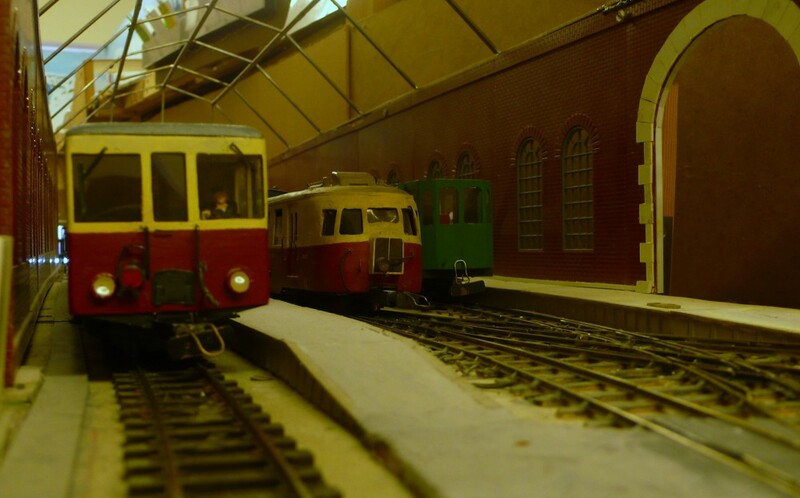 The late running freight will not impact upon the opposing passenger services, however, as it is allowed time to work at Ospicio d'Helcaraxë which is not usually needed in winter. Ironically it will need to shunt today to detach the pit props picked up at Cadsuiane. This is one of the problems thrown up by single ended sidings, and one that I wanted to include in the layout's operating pattern. Many continental station layouts had loops, which functioned as double ended sidings to avoid these problems. 57. The morning commuter/schools' train across the Kasatritikakamparoj stops everywhere, including the halt at Lamassco. If one wished to be critical one could question why so much has been squeezed into such a small area. The curate (referred to in photo 35, at the right) and the washerwoman would be much too close to the railway in reality but removing these sort of signature scenes would probably result in an unsatisfactory blandness. 58. The problems with the blocking of the LAC-RFK local goods have come home to roost. Quite often slight problems become major complications if not attended to. In an ideal world the hopper of limestone (for the glass factory) and the grain hopper should have been on the rear of the train but, as was noted, there was insufficient time to block the train correctly before it left Lacono. The heavy workload at Boursson and the need to drop off and pick up wagons at Sojonno have resulted in the train arriving at Glissent in a less than ideal condition. Often an early arrival gives some spare time to sort out these problems but the train arrived on time today, leaving no leeway to deal with the problem. Ideally the Glissent drop offs should have been at the rear of the train but they are mixed into the consist. The grain hopper, bound for Eromarbordo could then have had a quick transfer on the back of the railcar and the limestone hopper could have been taken around to the glassworks. 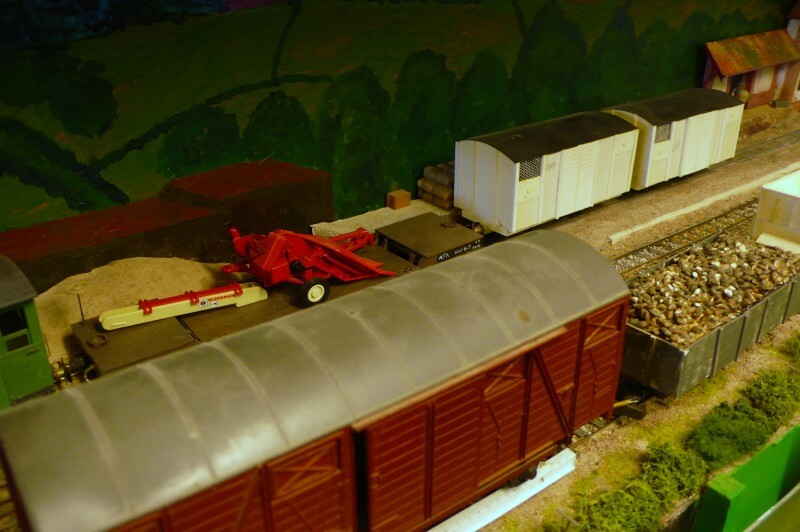 The need to propel for just under a mile to reach the glassworks mandates that no surplus wagons are taken along the siding and so the bogie hopper will have to be detached from the train whilst the rest of the wagons are put back onto the train. The grain hopper will have to wait until the loco returns before it can be forwarded along the branch. 59. 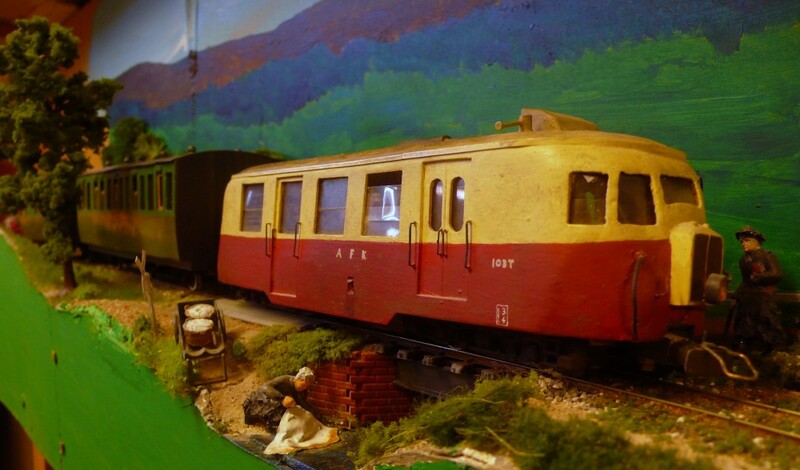 The loco and hopper have gone round to the glass factory. The mainline passenger services will pass by during its absence. 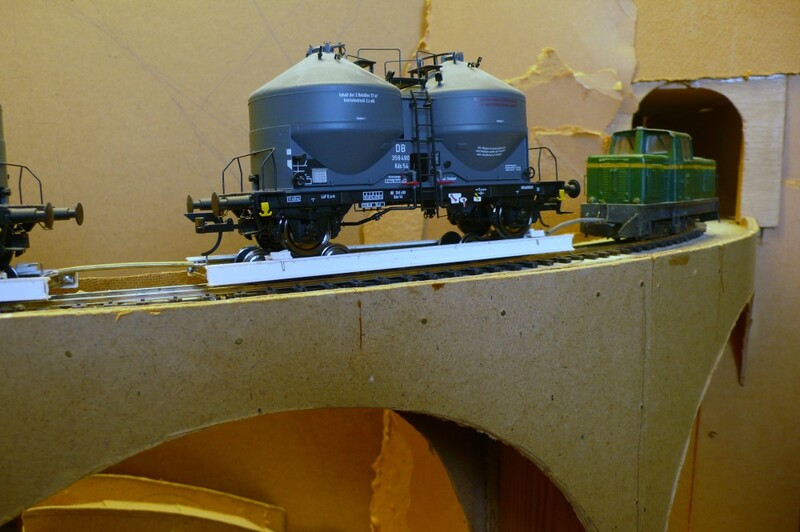 In reality the hopper has been put into a nearby drawer and the loco stands at the limit of the truncated siding. 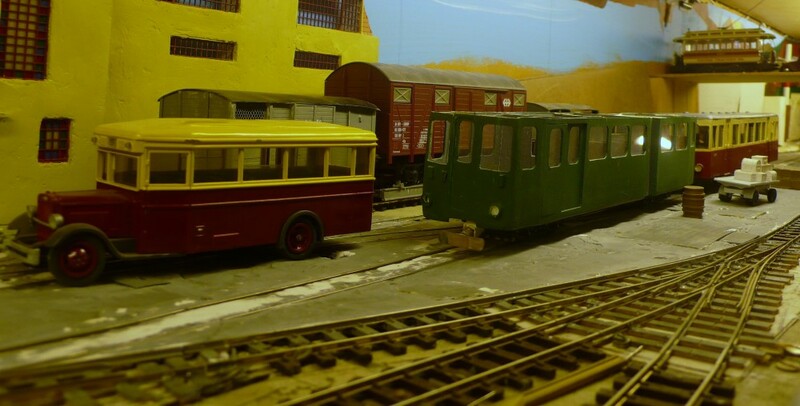 The railway bus has been slightly moved to accommodate the loco. This is another area subject to overcrowding, but one that I accept to improve the operational possibilities. 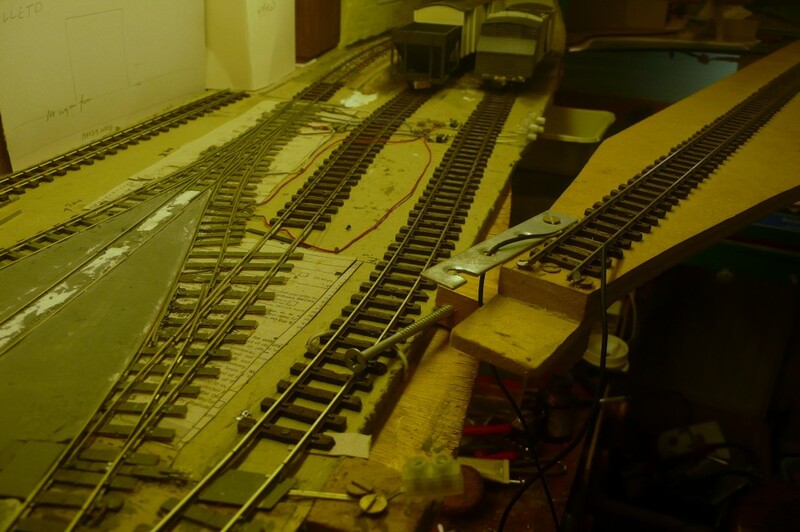 Once again, now that the notional layout of the glassworks has been established in the Instructions, shunting moves will be simulated with mapping pins in the near future. 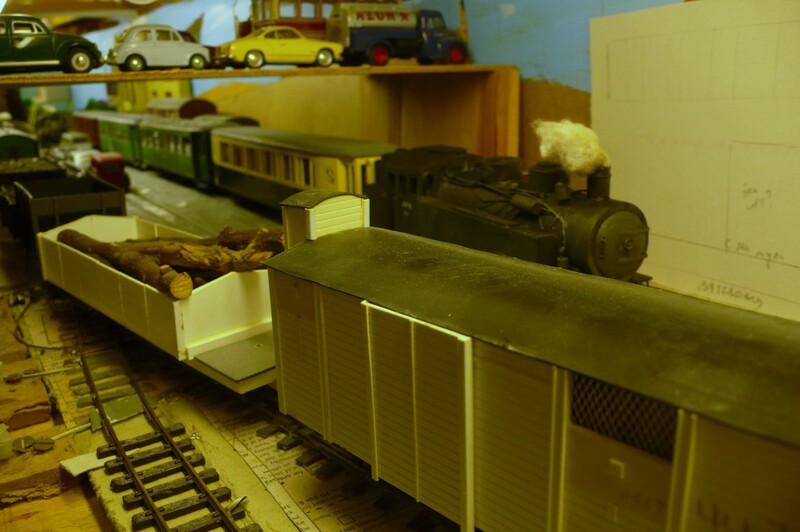 Once the passenger trains and railcar have gone the outgoing wagons will be taken from the drawer and placed on the siding behind the loco so that they can be dealt with. 60. 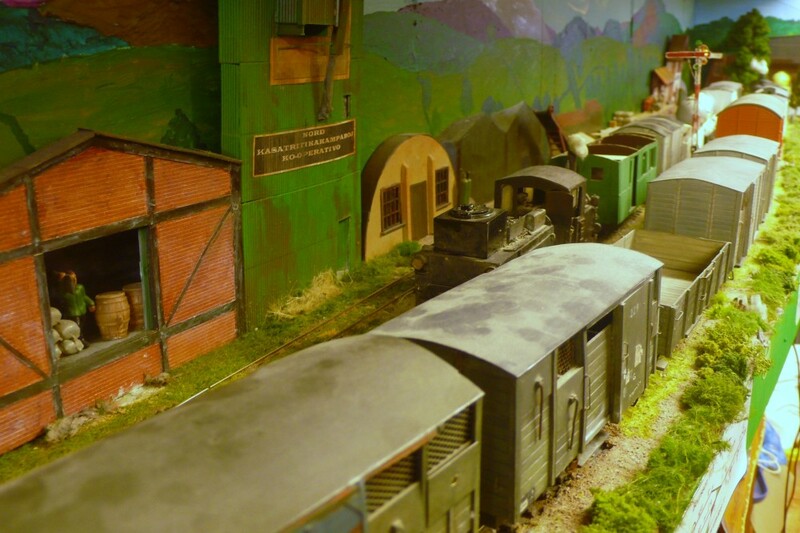 The late running schools' railcar has discharged the pupils and is propelling a van of beer into the goods yard at Fenditavalat. 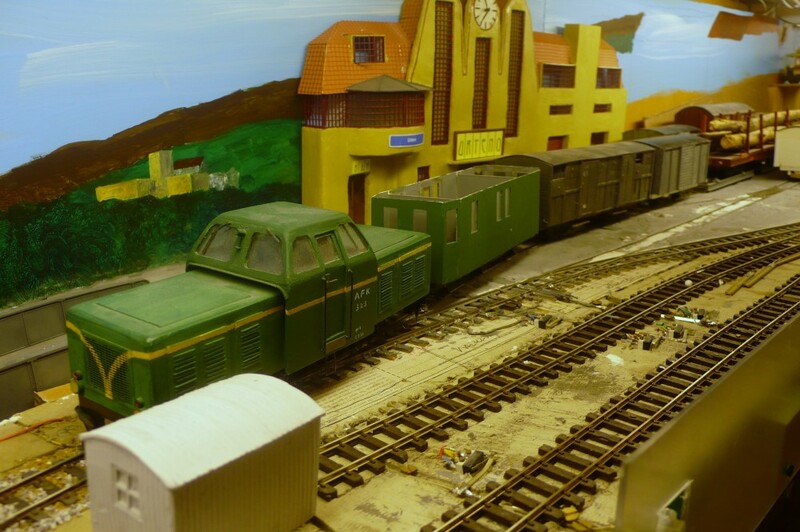 Control has decided to replace the railcar with a loco hauled train as this will remove the need for piloting. As was noted in photo 53 the mainline connections are on time today so there should be no need to use the reserve set which can be cascaded to cover the railcar diagram. Loco 222 has received some attention since having the doors inserted into its side to convert it into a motorised luggage van. It is supposed to now be complete but there are problems with the roof's attachment. A set of BA box spanners are on order, which hopefully should solve the problem. If they don't other measures will have to be taken. 61. The length of the train requires that two trips are needed from Rivabordo before it can be put together in the Basabazaro. The resulting congestion for road traffic would, as has been previously noted, most likely have been unacceptable. The need to work around the late running railcar means that the express can only just meet its scheduled departure time. 62. The two morning commuter services have reached Lacono Cittavecchia on time and the white reflection of the shunt signal at the left shows that the signalman has wasted no time in setting the road for the nearest train (from Urteno) to shunt into Aspargo. 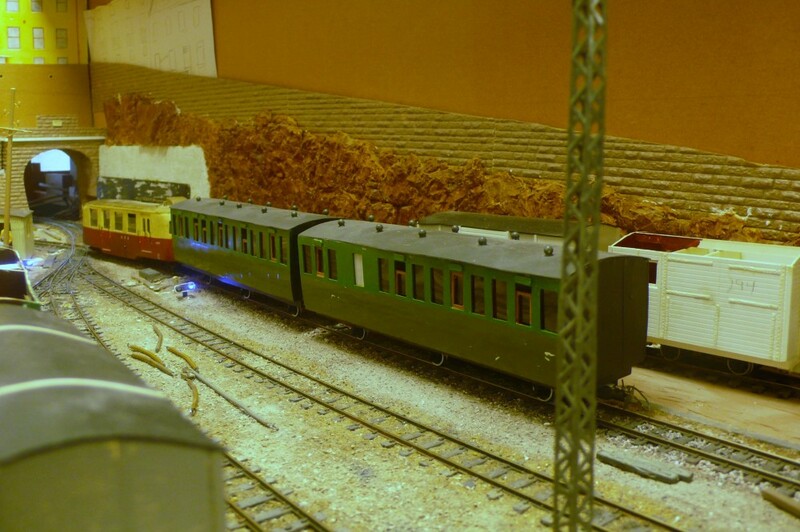 The other railcar will then run round the six wheel coaches and follow it down to the depot. The coach in platform 1 (at the right) will be attached to the down FDV-RFK train later in the morning. 63. The mallet powring the FDV-RFK goods has a series of shunts to make at Ithilarak to drop off wagons. 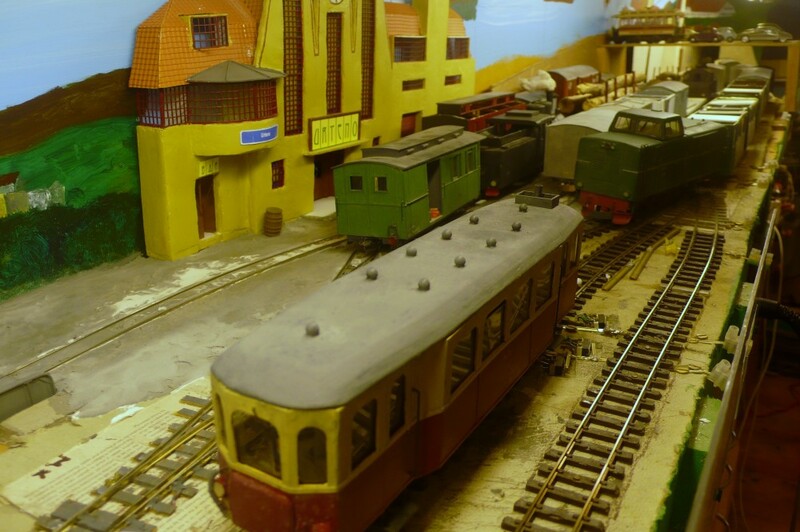 Only 30 minutes is booked for shunting and it is imperative that the train leaves before the two main passenger trains of the day, which cross here, arrive. To make a punctual departure the colliery traffic would have to be left behind. The trajnaĉefo is therefore on the phone to control to advise them and to ask for orders. 64. There is some latitude in the timings and so the train is instructed to 'lift' the colliery traffic. Unfortunately the heavy loadings will exceed the limits prescribed in the Instructions for safely braking a train down the Vulpafaŭkangulo, even with the retainers turned up, and so one wagon will be left behind. 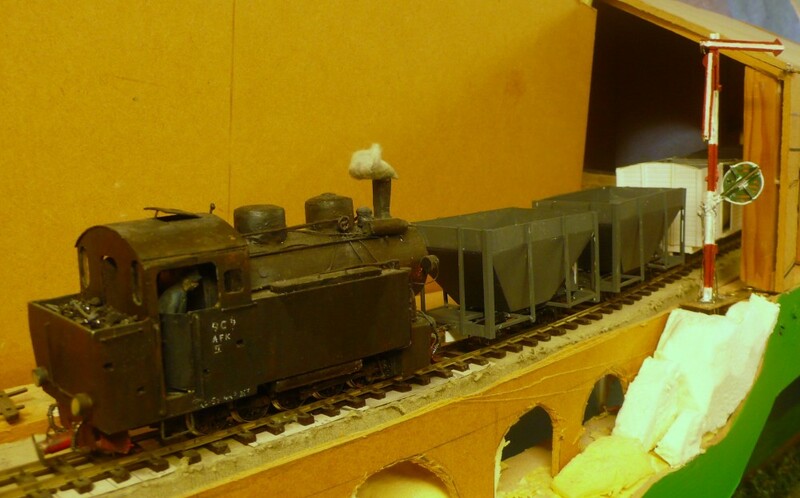 Both the hoppers at the uphill end of the siding are due to replenish the bunkers of the AFK's ferry on the Spegulalaguno but there is no question of working them as a pair. This is a mountainous railway and trains must work to the maximum tonnage as far as possible. It is not quite an American drag freight, especially at only 14 axles (less the brake), but it is as close as I can come! 65. The express rolls sedately through the upper reaches of the Kasatritikakamparoj as it approaches Boursson with the signals "off". I hesitate to use a verb such as 'rushes' because that is something that train 11005 certainly does not deign to do. The well heeled passengers in the Pullman car are unconcerned however. They have comfortable individual seats. a copious supply of coffee and are waited on hand and foot. 66. I have included this photo out of interest in showing the overall scene. The train stands nearly in the same position as it crosses the drop flap in front of the door. (It had to be slightly pushed back to obtain the photo above because a tree was in the way.) As it continues its journey around the room it will climb until it reaches the upper scene on the ledge above where it now stands. 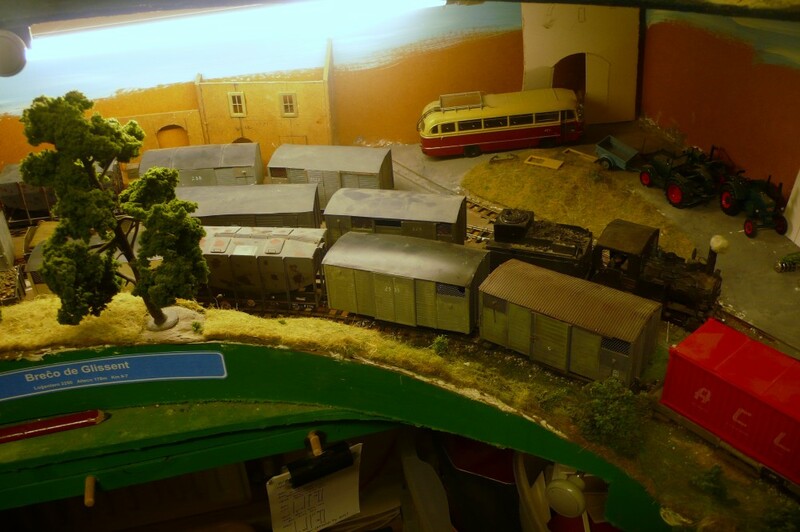 The area below the train is used to store some of the vehicles and figures that can be placed onto the layout. Many of these, such as the bathers at the lido or the ice cream van, are only used at certain times of the year. 67. The local, following the express, pulls out into the RN424 at Breĉo de Glissent. Road vehicles are few and far between in this isolated province during the 1960s and those in the vicinity will have been expected, upon hearing the loco's whistle, to have made themselves scarce from the bridge over the Ero. The trains do not take prisoners! The train is passing in front of the Co-op where the top end of the siding is now empty. The hopper wagons that were parked here were removed by the Eromarbordo railcar, which acts as a station pilot as required. The road signs beside the engine show, from the bottom upwards, 30 kph speed limit, main road diverges to right and tram pinch, where the train will sideswipe any unwary vehicles driven too close to the track. The indifferent road surface helps to explain why the railway maintains its superiority as the transport of choice. 68. The URT-RFK goods is arriving early at Lacono at 08.55 (bottom right). It eases cautiously along the road that doubles as a siding and goods reception line because the schools'/commuter railcar that ran across the Kasatritikakamparoj has run around it's train and is retreating to Aspargo. The equipment will not be needed until the evening. 69. 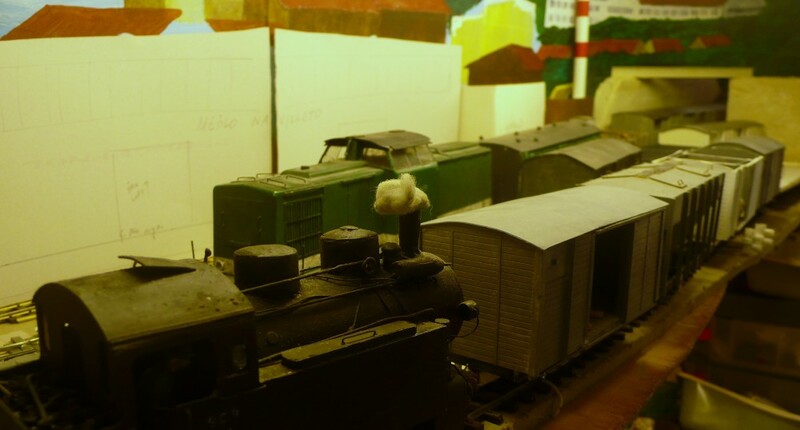 Both passenger trains have passed Glissent and the railcar has departed before the local goods loco returns from the glassworks. There will definitely be no breakfast at the Golden Perch today. Never mind, the canteen at Relforka is not too bad. 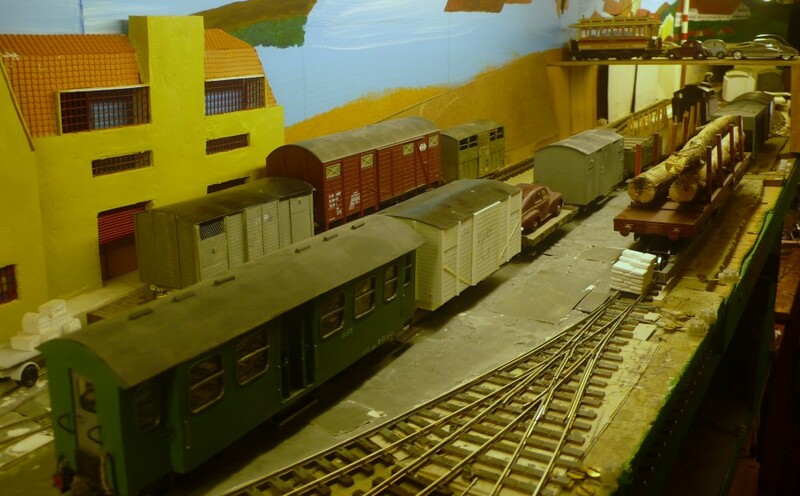 A fair number of wagons were found at the works which needed tripping round to the station. These two vans are full of bottles going to the cannery at Boursson and the distillery at Karamspur. 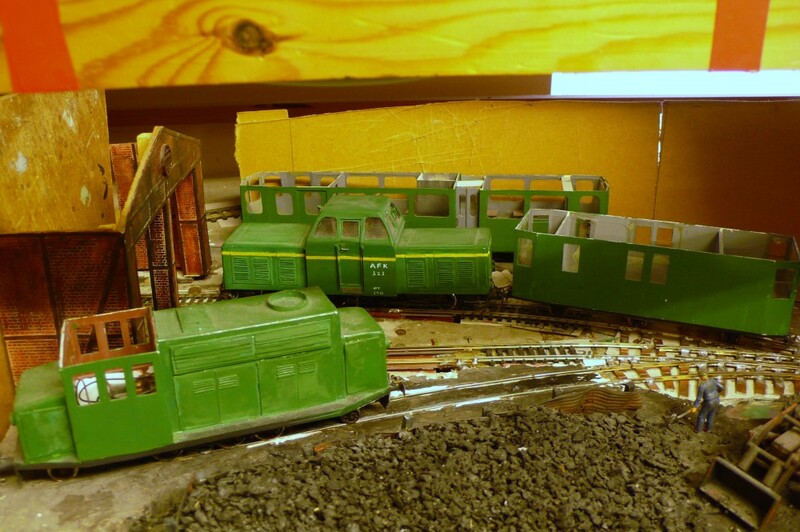 They will be pushed onto the goods shed siding for pick up by the up goods. 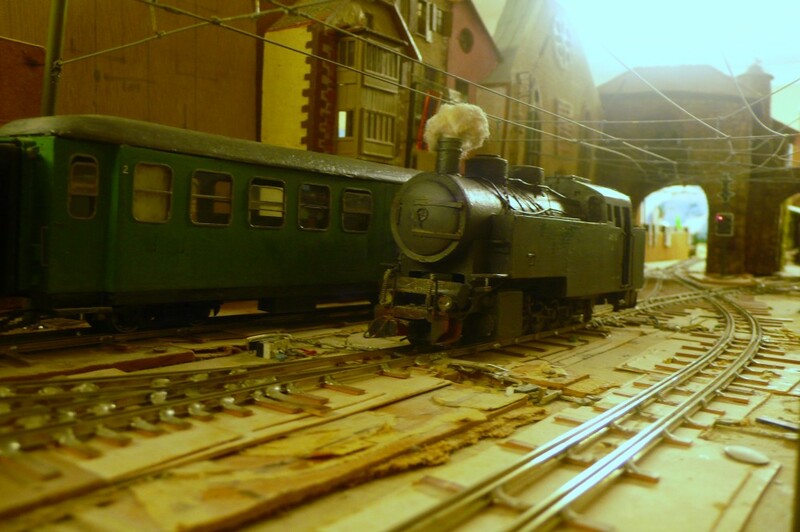 The loco will then return for the second cut, that it left 'behind the station building' (i.e. still in the drawer), and attach an empty SG open and an empty container on a flat to the rear of it's train. 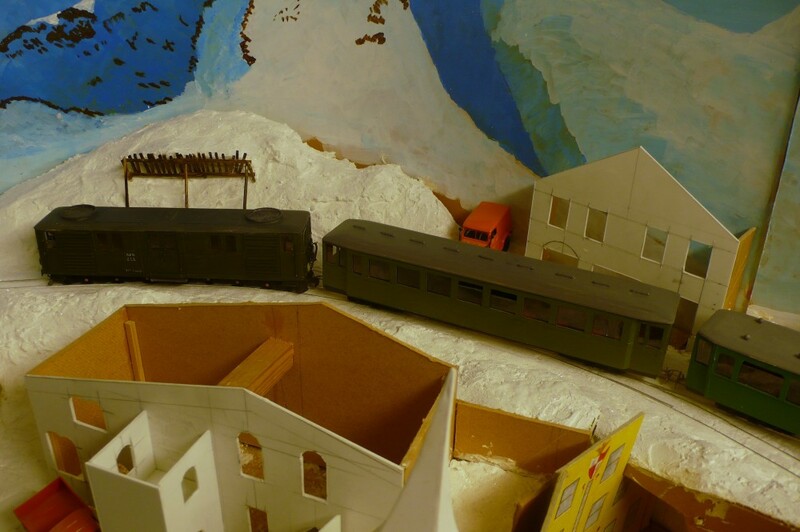 Even now the shunting is not finished because there is a possibility that the crew may be asked to detach the confectionery ingredients (picked up at Sojonno) and place it onto the rear of the up train. It is now round about 09.00 at all locations on the AFK. I try to keep the various stations roughly synchronised with each other because events at one location can impact upon another. There are currently ten areas of activity so I have decided to give a view of each one so that you can get some idea of how the session is shaping up. 70. The two KTT goods are now crossing at Breĉo de Glissent. The up train has just pulled into the station, having been held at the ES to allow the loco of the down train to regain the front end of the train. Both trains are well loaded this morning and the siding (in the background) is also full. 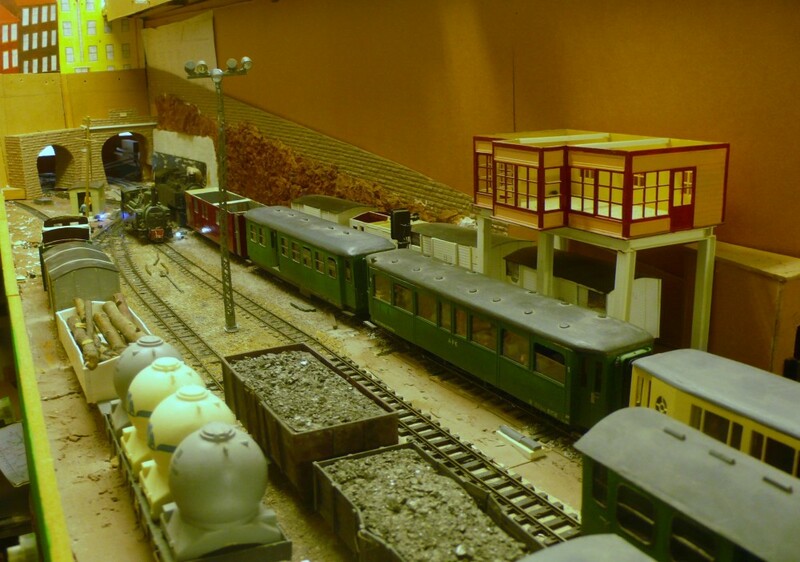 There are twenty two wagons in this small wayside station at the moment which is more than the original layout ever possessed! The red container, which brought in chemicals yesterday, could do with toning down. 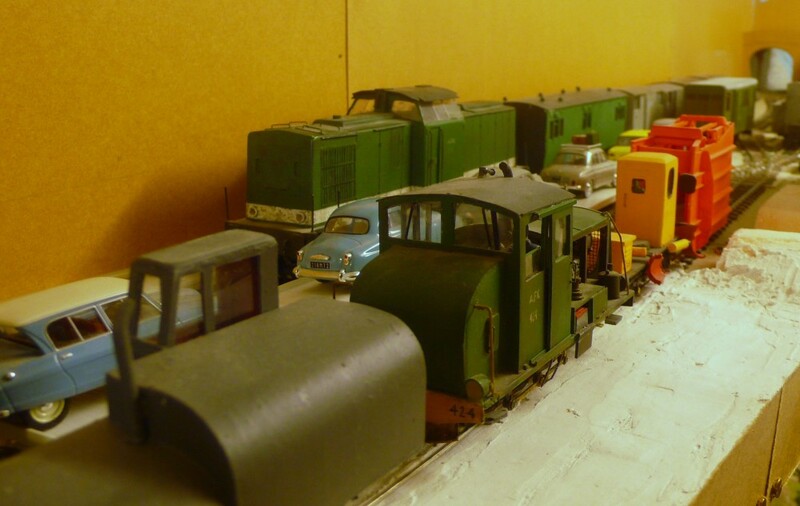 The down crew have told control to forget any more shunting. The van of ingredients can be taken to Relforka and marshalled into an up train, which is common practice anyway. 71. Meanwhile the express is arriving at Lacono Cittavecchia. 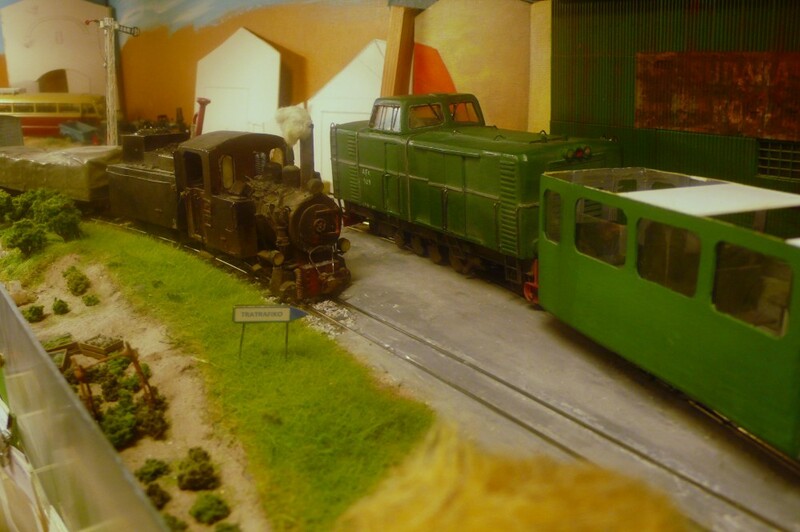 To the right the loco of the URT-RFK goods is remarshalling its train with the help of the shunter, which is out of view but attached to the cut of wagons in the foreground. 72. The following RFK-URT local is arriving at Boursson under clear signals where it finds the goods extra waiting for the road. This will depart, once the local has cleared the locking, and continue its journey. Interestingly enough it is running on the path of a train which was pencilled onto the timetable yesterday. (Well not exactly because I use water soluble pens to write onto a plastic sheet attached to the timetable graph.) This path may become a semi permanent fixture as the loadings continue to rise as new traffic is added to the generator..
73. Out in the wilder reaches of the system the loco hauled train replacing the FDV-RFK railcar pauses at snowbound Caladonno before resuming its journey across the cantonal boundary. The road crosses the railway in the middle of the platform and so the plough will have to wait until the train leaves before it can continue to clear it. The leaning church spire is visible in the foreground if you look closely. 74. The RFK-FDV goods is waiting to cross the railcar at Ospicio d'Helcaraxë. Given the large amount of snow fighting equipment occupying the sidings one of the plough engines has been commandeered to detach the wagon from Cadsuiane-Fanhuidol to place it where it is convenient for them. It will wait to go forward on the down train in the afternoon. There is no point taking it to Fenditavalat because of the restricted loadings forced onto down trains by the short loop there. 75. 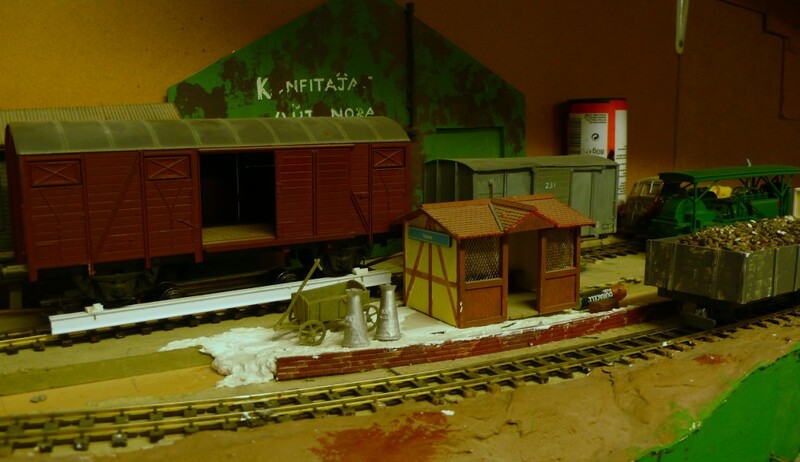 Once the FDV-RFK railcar has left Fenditavalat some tidying up can be done. The schools' railcar comes out of the yard and prepares to go down to Rivabordo. 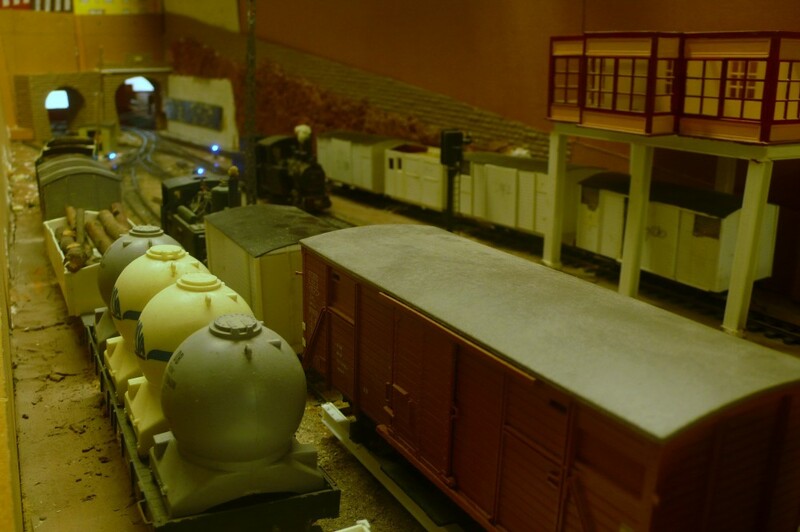 The pilot will go into the blanket factory to retrieve an empty coal wagon before pushing some empty vans in for loading. 76. The Jakarutu-Ithilarak train has left the high moors of the Tegmentadelamondo (to use the Thalnian) and has engaged the rack. It should arrive at Ithilarak in plenty of time to carry out any shunting duties. As has been noted before it is a pity that this line had to be placed on a tangent. A sinuous climb would have been much nicer. 77. The FDV-RFK goods is running cautiously down the Aepto Gorge with the maximum weight of train allowed for an unassisted engine. This view is taken from the opposite side of the gorge and the stream is invisible between the rocks. The scene is directly below the preceding one and would be compromised if the rack branch was not straight. The loco has just crossed the electrical boundary between Ithilarak and Urteno. It will be left here for some time before running down to Urteno on local control. 78. The banking engine's crew enjoy a breather between duties and are probably in the station cafe drinking coffee and reading the paper. The various limousines have arrived from the upmarket hotels so that their clients can continue their journey in comfort. The Volkswagen van in the background will take care of their luggage. The stars and stripes will be repainted into Thalnian or Altonia colours whenever I remember. 79. 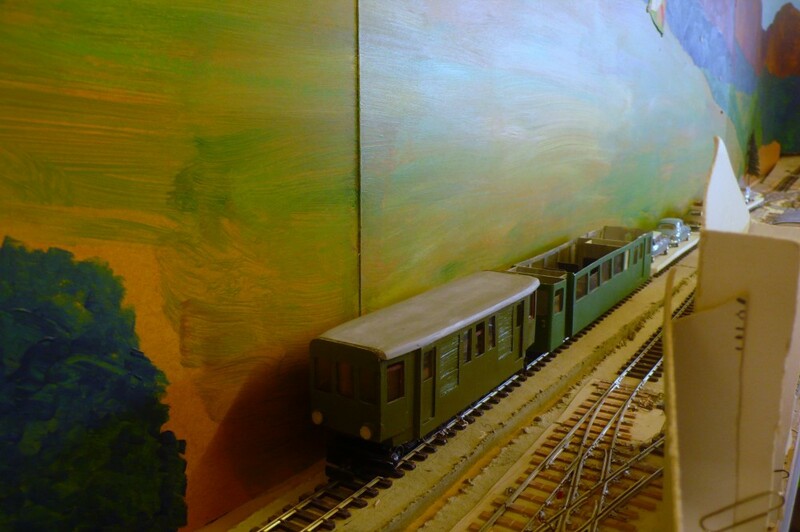 In this closing view of the state of play around 09.00 the railcar has arrived at Eromarbordo and is making its connections with the railways bus which will travel out into the marshes to serve the remoter villages before providing a connection with the Thanian railways at Trebuchal. All three vehicles look to be rickety contraptions. The front buffer also seems to be falling off the railway version so that will need a little TLC. 80. The express has arrived at Urteno. It will detach the Pullman here, as usual, which will reduce the load to three carriages. This is well within the loco's capabilities on the Vulpafaŭkangulo so the banker will not be needed today. 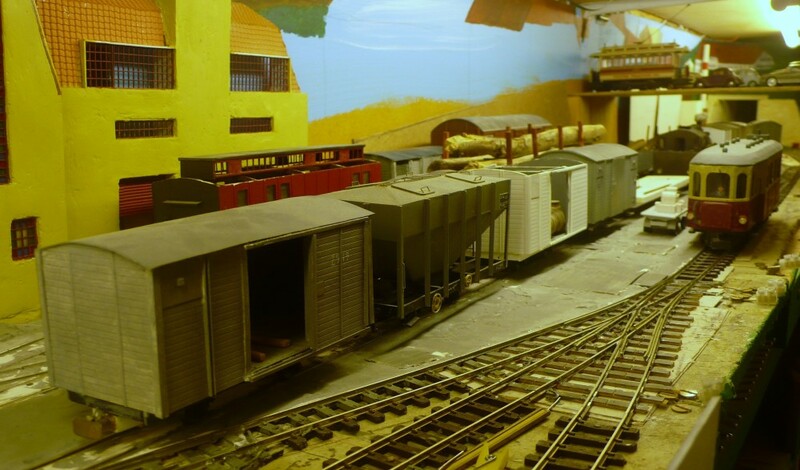 The wagons in the foreground are part of the FDV-RFK goods. This arrived slightly late after the minor problems at Ithilarak (photo 64). The short loops at Urteno cannot hold this train in the clear and, in another one of those practices designed to make life easy, the loco pulls the train forward before setting back into the coal sidings. This will allow the wheels and brake blocks to cool down whilst the Westinghouse retainers are set back to the normal position. The train can also shunt without affecting the banker and the express. Quite what the upper crust clientele make of being deposited onto a ground level platform amidst dusty coal wagons is open to speculation! 81. 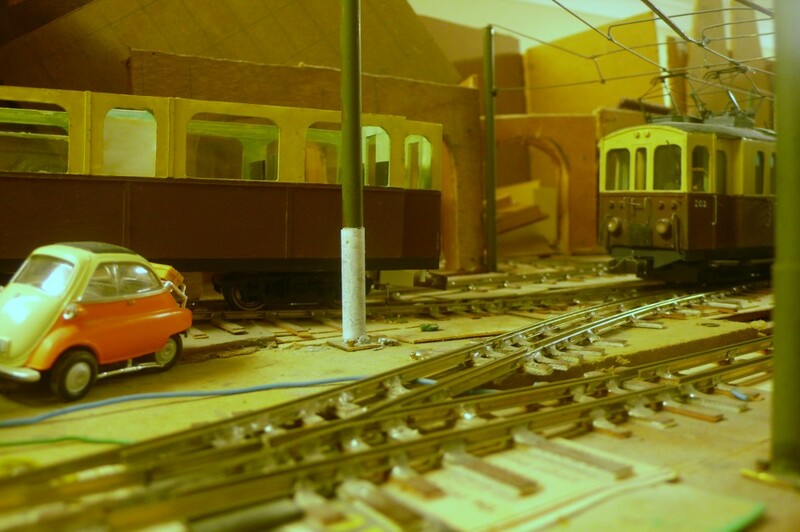 The view from the foreman shunter's office at Lacono Gasafabrikatastrato. The URT-RFK goods stands at the left, waiting for the passenger train to come in so that it can make an early departure. 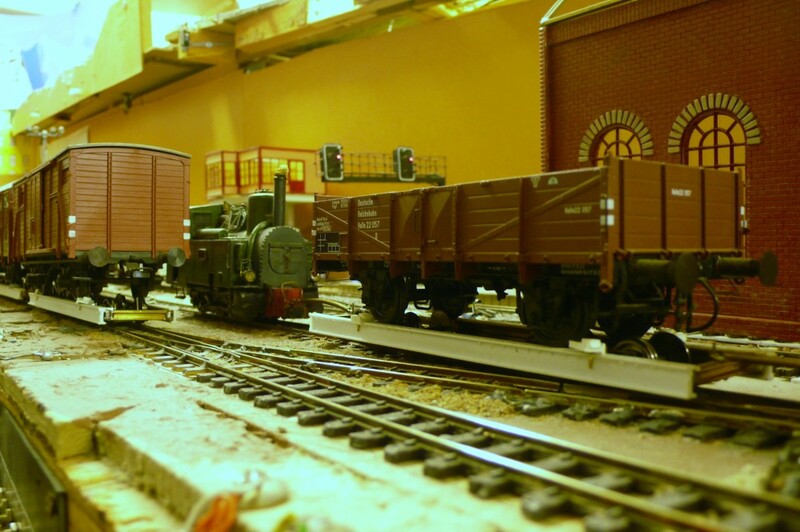 It is now formed of 5 SG wagons and a NG van, the maximum load allowed. Telephone calls have revealed that it is likely that the FDV-RFK goods, currently at Urteno, will have enough spare capacity to forward the remaining 4 SG vehicles assembled by the pilot on the middle road. The other vehicles will most probably be placed onto the afternoon KTT goods. A large collection of transporter wagon coupling poles can usually be found lying at this end of the sidings, although I suppose that they would constitute a trip hazard in reality. 82. 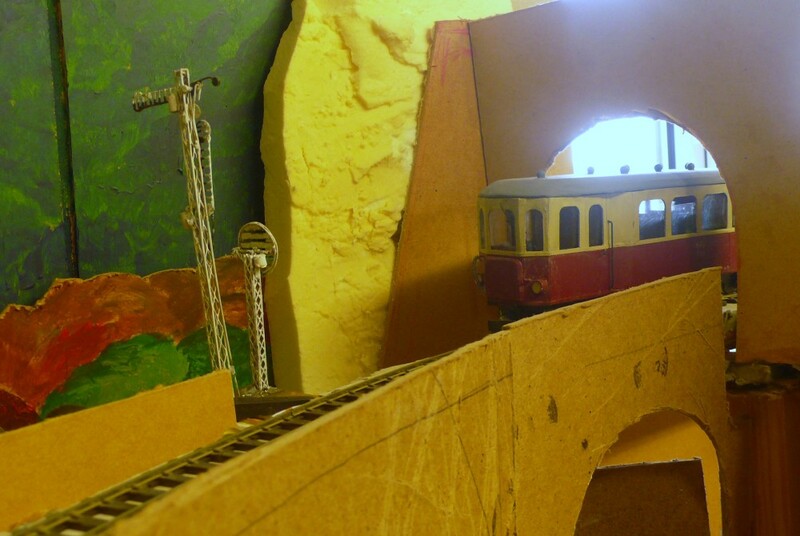 The shunting continues at Breĉo de Glissent and the 0-4-0TT pulls out onto the bridge over the Ero, by the medieval guard tower, to confront a VW van. The van driver stands his ground though as he knows that this is only a shunt move and the loco will retreat down the steep slope in a minute or two. Bridges in Altonia do have parapets, incidentally, but this one remains incomplete. 83. 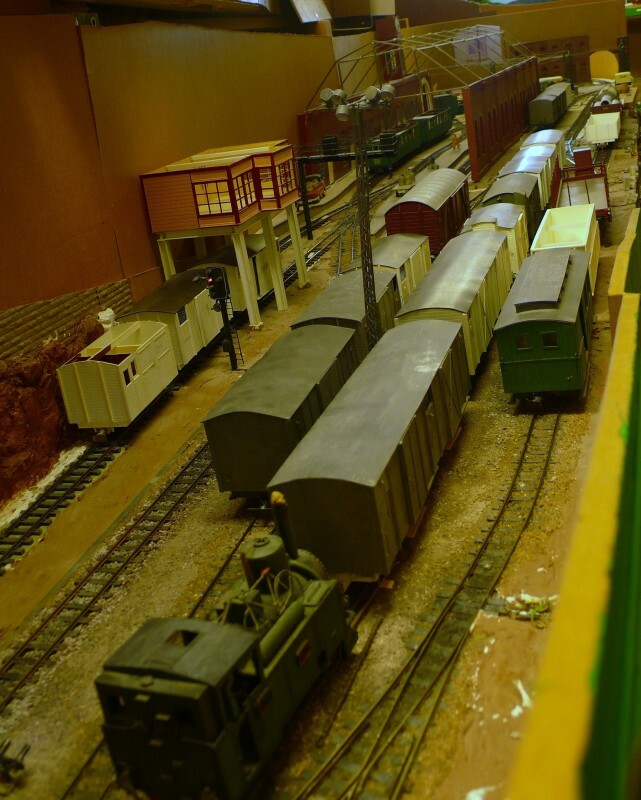 The extra goods train was checked outside town before receiving clear signals. The 0-4-0TT casually stands in the middle of the canton's main thoroughfare to let the extra pass before it resumes its work. 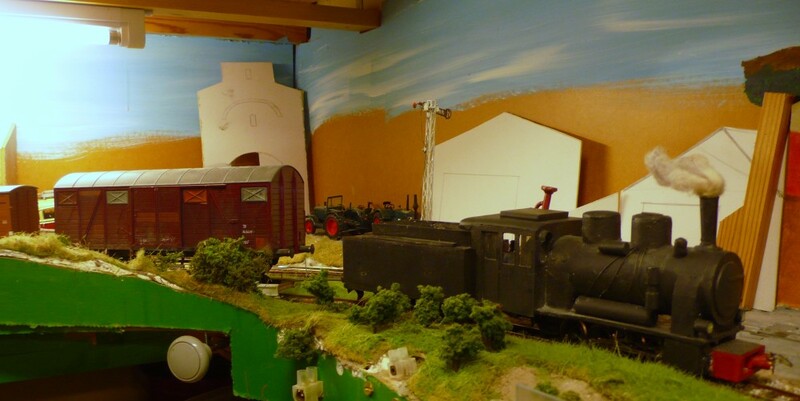 By chance, almost everything in this scene is complete, giving a good idea of how the finished railway might look, but the observant will notice that the brake van has no roof and the diesel needs minor attention to finish it..
84. 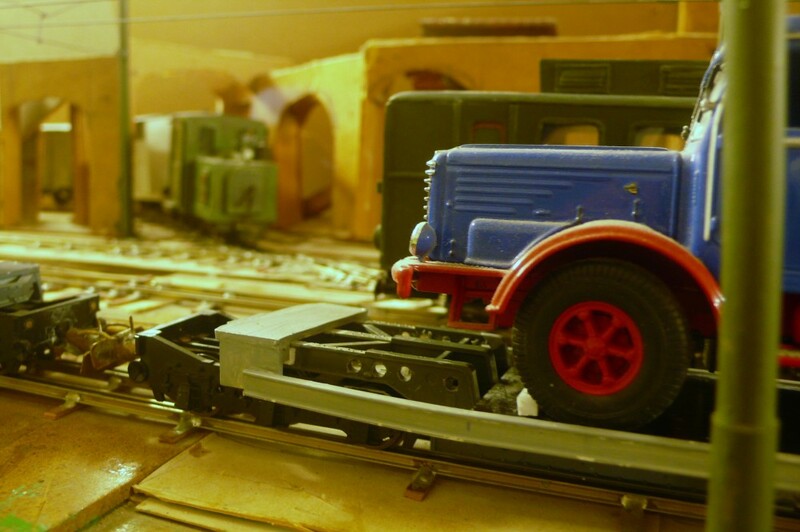 The Fenditavalat shunter pushes a cut of vans into the blanket factory. No 246 in the centre breaks with convention in that the door opens the 'wrong way' (to the left). It has been finished in a care worn condition with mottled paintwork attempting to capture the feel of bare wood poking through as the finish fades and peels whilst rust begins to show on the metal parts. Van 2935, behind it, and incomplete, is also a somewhat bedraggled specimen and a close inspection of the shunter will reveal that little there is square or vertical there either! Some of these features are deliberate and some reflect the bodges carried out during construction. 85. Any-one who wonders why the Jakarutu branch train arrives almost one hour before its connecting trains at Ithilarak would do well to look at the exchange siding. (This is protected by a transparent plastic sheet to stop stock being knocked to the floor in this exposed location.) 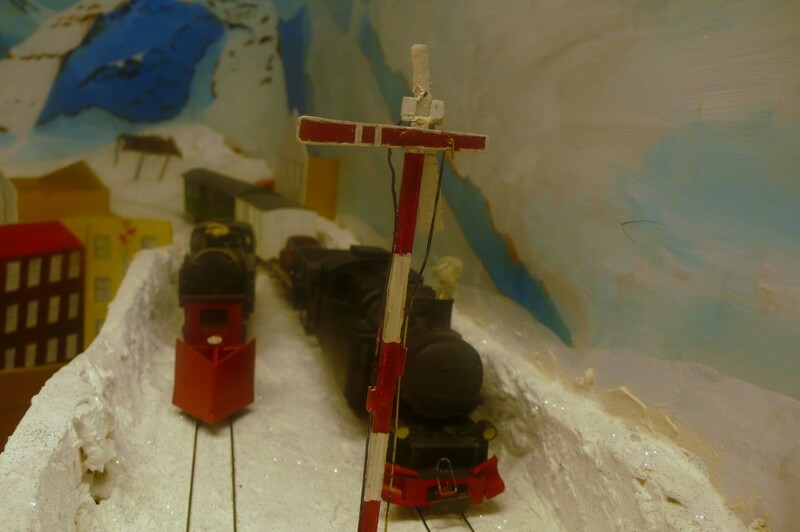 Whilst the station restaurant provides good quality cooked breakfasts for ongoing passengers the train crew have to brave the cold winds and the snow to remarshal their train. 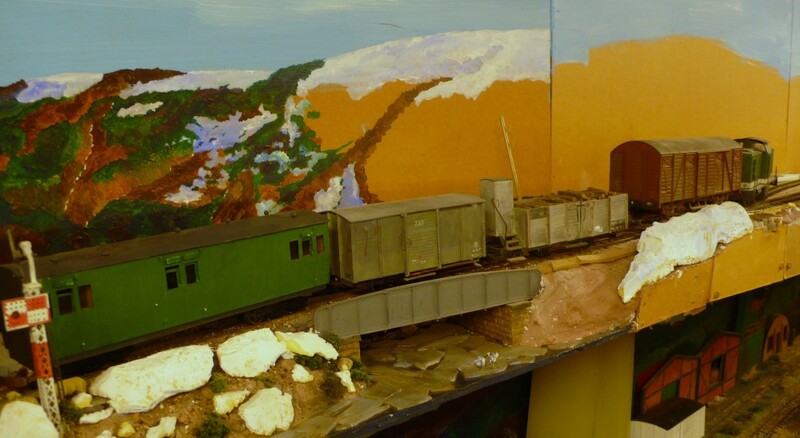 The branch train has to drop off its wagons and pick up anything bound for the high moors from this siding. 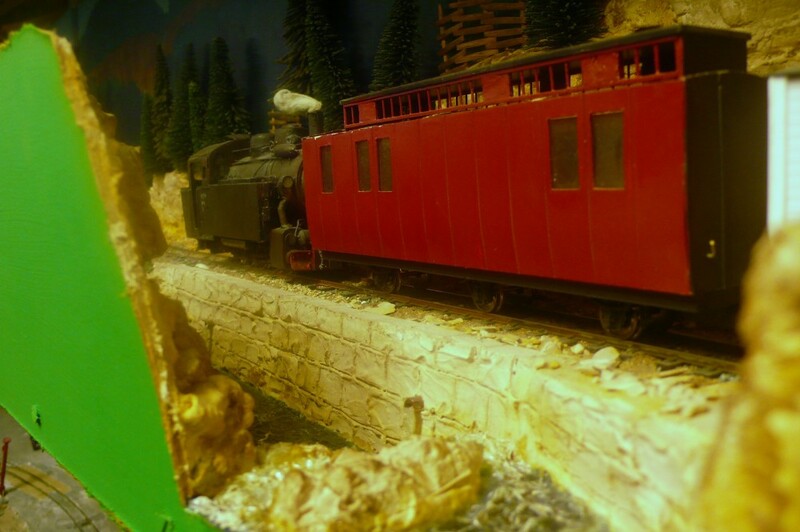 Given the mixture of loads in the siding the crew will have their work cut out to meet the departure time. One other aspect of this work is just visible in the top left of the photo. To release the points for shunting the Bavarian home signal has to stand in the "Ruhe" position thereby locking the entry signals in the stop position. There is thus the potential to delay mainline trains. 86. 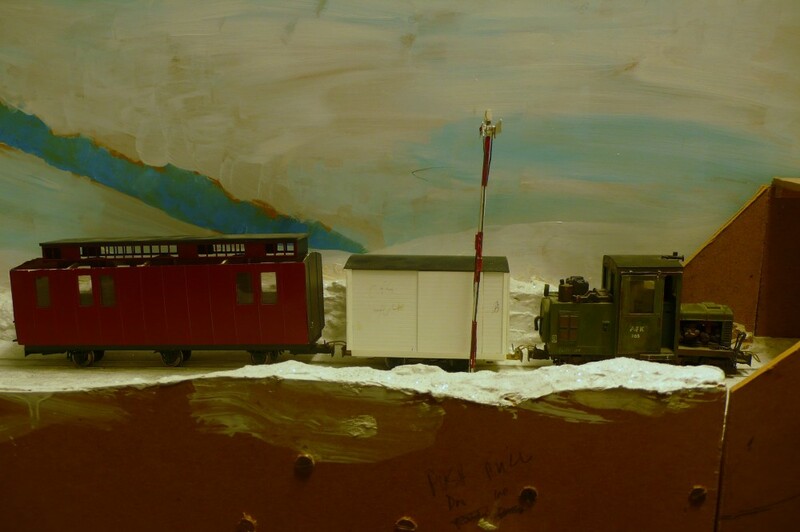 The FDV-RFK railcar substitute train has arrived and pulled onto the PFT, as seen by an intrepid photographer standing on the avalanche shed. It will cross the up express 11005 here. 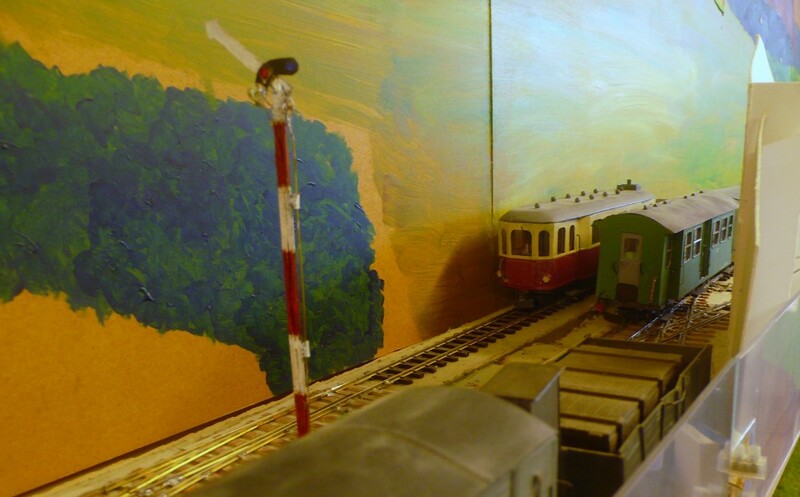 and, as is standard practice, the branch train has pulled into the loop behind it. There is usually clearance for this but the loco is taking up extra room on the loop today and the branch train is fouling the main line at the far end of the station. There will be another technical time out when the express arrives to shunt it along the loop. The 'railcar' was almost delayed by the shunting but the loco cleared the siding just in time to allow the FS to be placed at danger which released the locking for the ES. 87. The URT-RFK goods stands at Boursson as the up KTT goods pulls in. This is a regular occurrence and both trains are running early today. Once the through train departs the local will shunt the station. 88. The up express is the first train to pass the new signal at Ithilarak with the distant in the 'off' position. The Bavarian Railways chose to give a positive indication to the driver rather than use the standard continental format of making a clear signal invisible to the driver. The distant normally stands in the 'on' position as in photo 9. I have had it suggested to me that some form of protection should be provided for this signal as it is placed in a vulnerable location next to the aisle, so I am contemplating a plastic shield. 89. As the morning draws on the URT-RFK crosses the arched bridge with its train almost totally composed of SG vans on transporters, although there is a NG van on the tail. All these vans are loaded with goods travelling beyond the AFK into the heartlands of Thalnia. In one of those little ironies this was the first area of the Kasatritikakamaparoj to be started and it will be one of the last to be finished. 90. 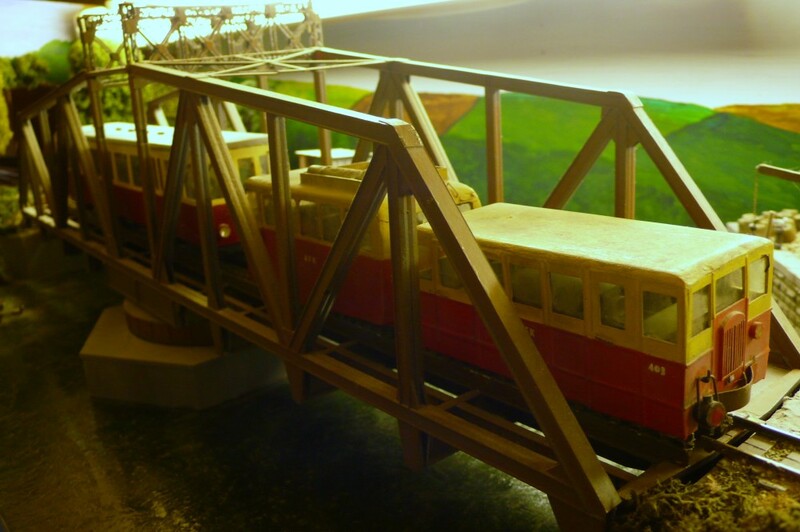 The RFK-URT passenger crosses the lifting bridge over the Spegulalaguno as it nears journey's end. The loco usually acts as station pilot in the banker's absence but as it was not necessary to bank the express there will be no need for this loco to do the shunting. Control are beginning to realise that it might not have been a bad thing for the banker to have travelled with the express because there is a large amount of traffic that needs dealing with at Ithilarak and no loco to do it. The banker's next scheduled trip is during the afternoon so it might be advised to travel light up the bank. 91 The FDV-RFK goods has arrived at Lacono where it will cut out the coal wagons, due for the city's factories, and the wood wagon, which is a low priority load. The performance of this wagon has been poor because it has derailed everywhere. I am not too surprised at this development as it has an extremely long wheelbase, as did the Swiss prototype. It refused to run properly despite numerous minor adjustments, so it was taken to the bench for further attention. Three of these wagons were batch built so before withdrawing them all for attention another example was placed into the train which performed reasonably well. 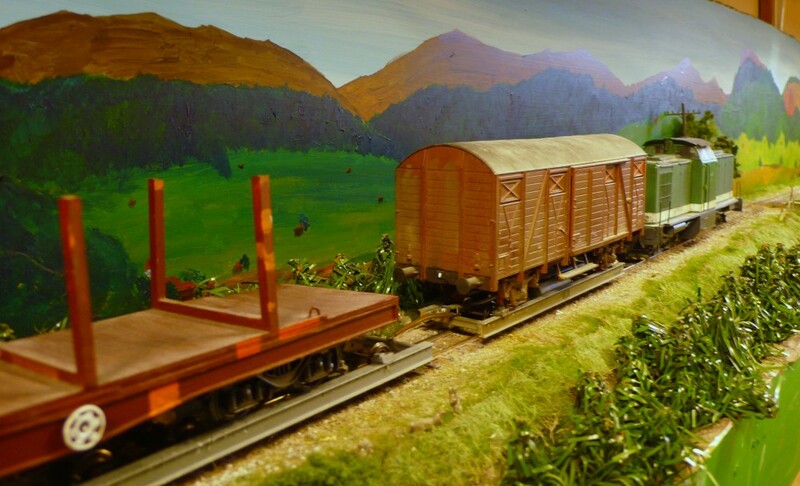 The original wagon has been converted to a bogie wagon, which is shown in front of the train. The jury is out as to whether the other two will follow suit. They are supposed to be self unloading as they tip to either side of the flat bed and are intended for use with the gravel traffic from Ospicio during the summer months. They will also find use on PW trains once these are sorted out. 92. 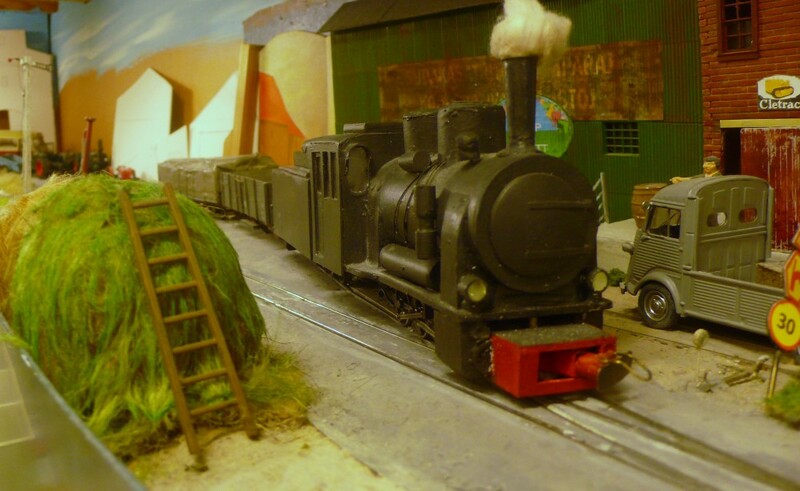 The 0-4-0TT backs down to the extremity of the Co-op siding at Boursson to collect a van converted into a hopper. The siding is rather rickety so the move was performed slowly. Locos do not usually run this far along the siding as the common practice is to use a 'handle' of wagons to drag the wagons out. 93. 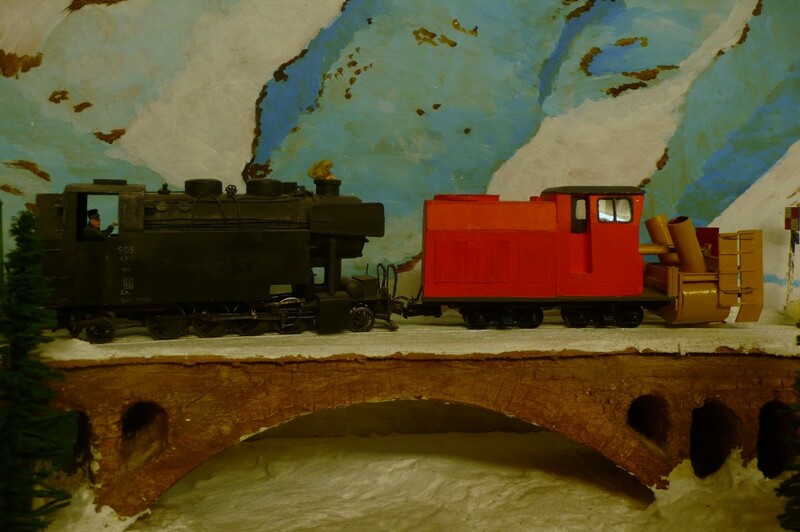 The FDV-RFK goods is running early so the 0-4-0TT is marooned in the siding to let it pass. The majority of the consist is SG wagons by this stage of the journey. 94. Having been detached from the express the Pullman is backed into its designated siding at Urteno. The linen will be changed out, the drinks and food replenished and the carriage cleaned before it is attached to the afternoon express. 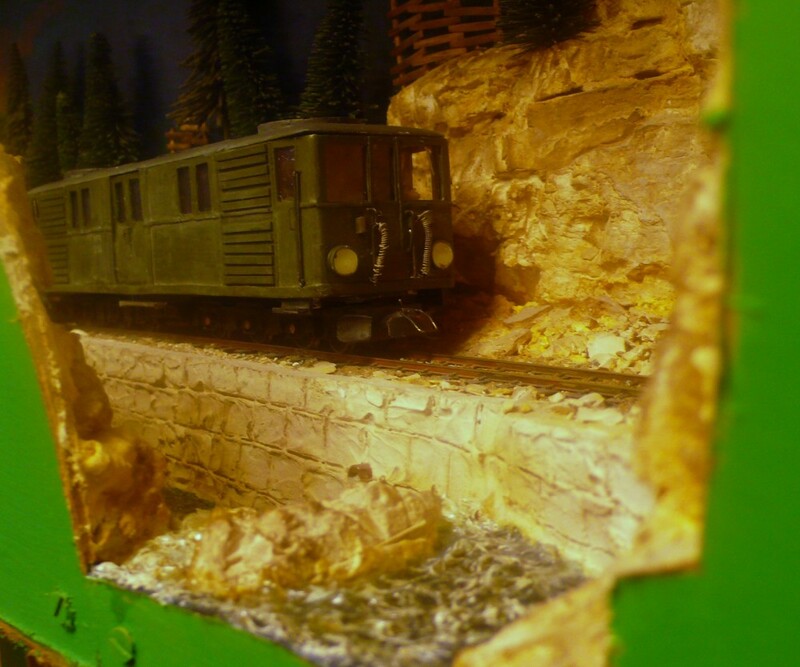 Whether its windows would survive being parked so close to a wood loading siding, as has been remarked before, is open to debate but I claim modeller's license. 95. I suppose that I set up this shot earlier with my comments in photo 66. The express has circumnavigated the room and is now passing directly above the site of that photo. Our Lady of the Snows chapel, at Ayleha, is just visible between the trees. The train is unlikely to have to stop as this is one of the minor halts provided for schools' trains. A crossing sign is still needed here for the Long Distance Footpath. 96a A couple of transporters have become available to make a quick test of the layout's latest acquisition, a modern long wheel base van. 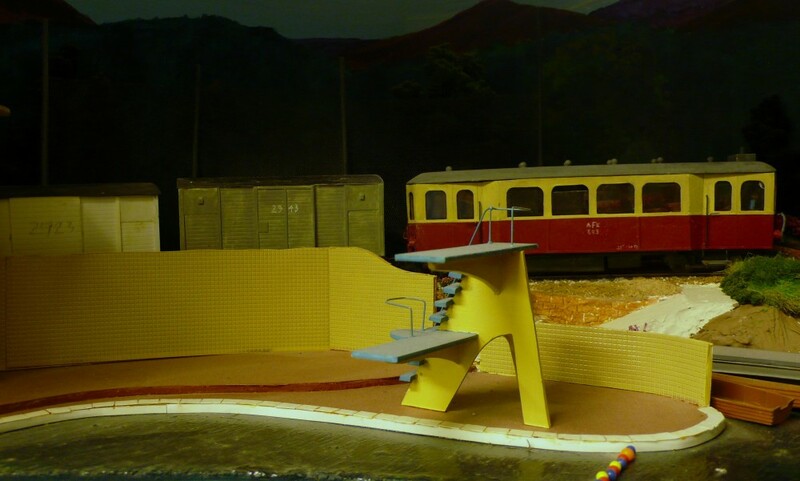 I think that these sliding wall vehicles were introduced onto the German railways during the 1960s but I am open to correction about this. 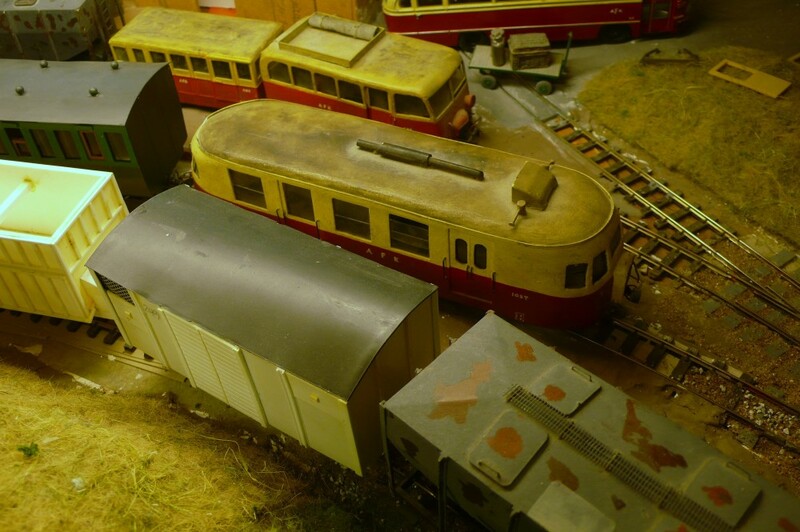 (After posting on various websites I was informed that these are Swiss Hbis wagons introduced in 1967.) Anyway if I am wrong I will once again claim modeller's license because a couple more are on order. They need painting and finishing but come ready assembled with flexible axles so this was the first attempt to see how they performed around sharp curves. The wheelbase is so long that they cannot be accommodated on a single transporter but the first attempt to offset the wagon towards the right hand end resulted in the left hand end of the transporter to the left raising into the air! This obviously isn't viable (!) but I suspect that two of these vans could be carried by three transporters. Time will tell. 96b The test train traversed the 180 degree 2 foot radius loop with no problems and rather surprisingly cleared the tunnel mouth apart from a slight scraping with its steps. 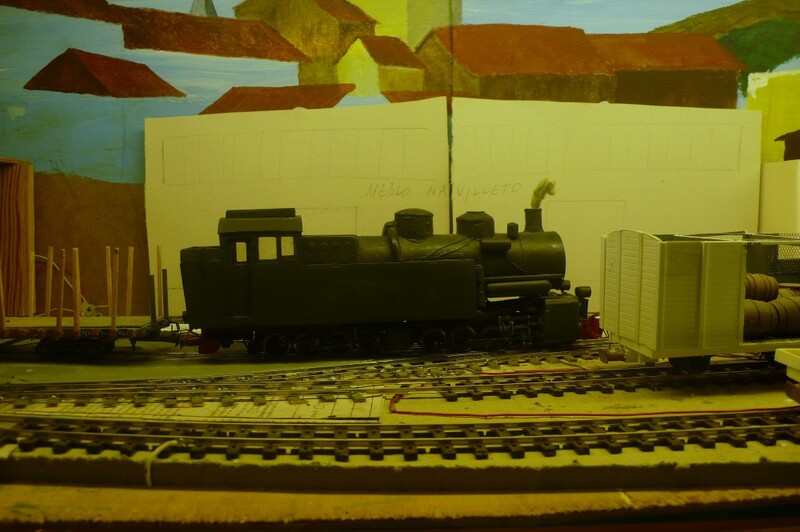 96c I am contemplating adding a paper factory to the layout, although how this would fit into the operating scheme would have to be well thought out before I go ahead. 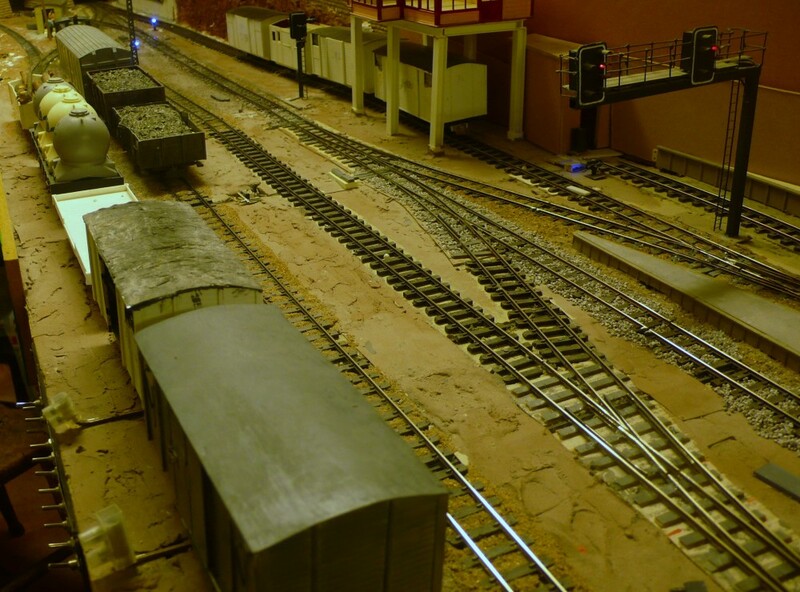 One option would be to place a removable lead alongside the coal sidings at Urteno. The Fenditavalat Rivabordo cassette was propped into place at Urteno and the idea seems tenable. The far end rests on the Vardenamero which would need some protection from scuffing. 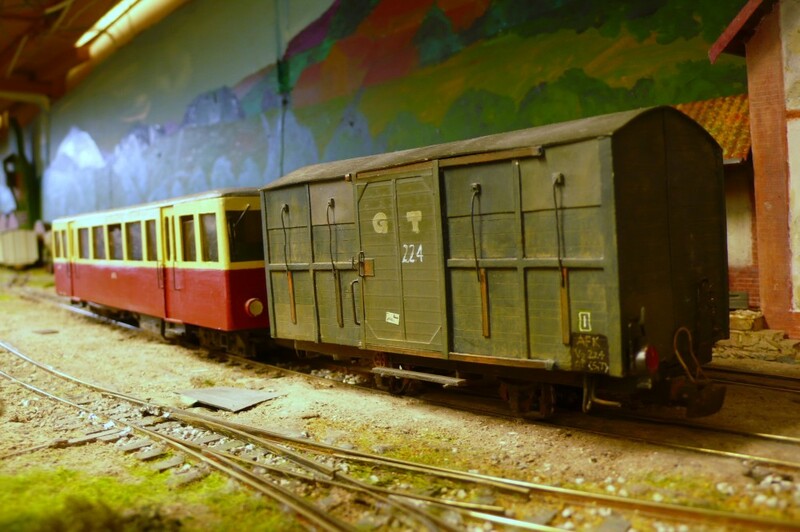 The recent purchase of a rare Billerbahn acid wagon kit, still to be made up, prompted thoughts as to where it could be used and this is one potential outcome. Another option would be to move one of the Lacono industries, such as the carpet factory, to this location and site the paper factory in Lacono. Two other alternatives under consideration are to place another siding in Lacono's yard or to convert the Sojonno site. 97. Meanwhile the operating session continues. The ambulances have arrived to transfer patients from the railway ambulance to the road vehicles so that they can be taken to the hospital. These are the serious cases that cannot be treated at the outlying hospitals. There is no hurry because the railway ambulance is detached here and goes forward by a later train. 99..... the trains need to be carefully choreographed in the Basabazaro to avoid tying the town into knots. After almost one hour's manoeuvres the layout in the square is set up to accept the express. On the left the car train waits. This only runs when the RN 424 is closed over the Helcaraxë pass by snow. 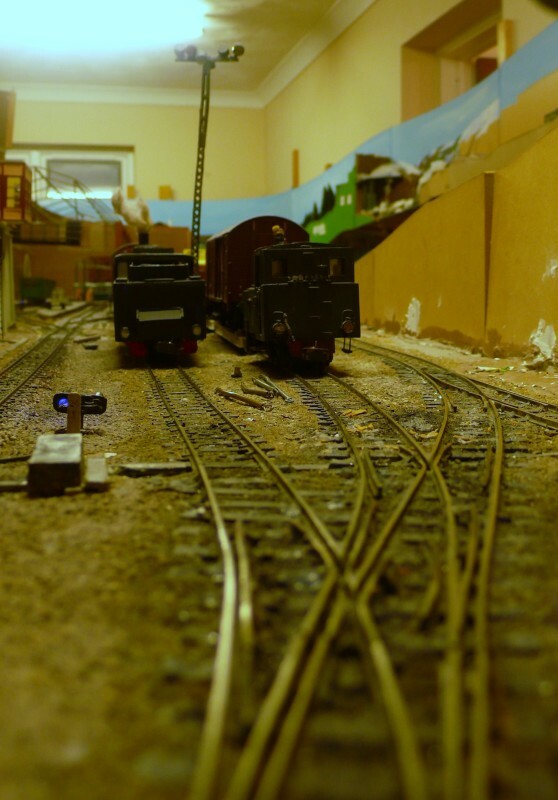 The connecting CFS service waits at the far end of the central loop and the shunter has pulled out of the yard so that it can transfer the Travelling Post Office onto the railcar once the car train leaves. Such complicated arrangements were the norm on the SG but I am sure that NG systems such as the Rhaetian have similar situations regularly. 100. The two main morning down goods trains have arrived at Relforka. 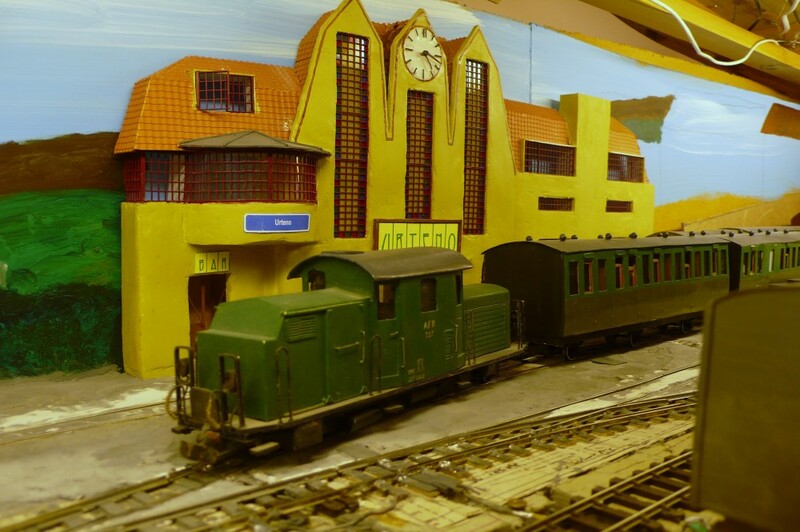 As has been observed before, this is simply a fiddleyard dressed up to resemble a station. 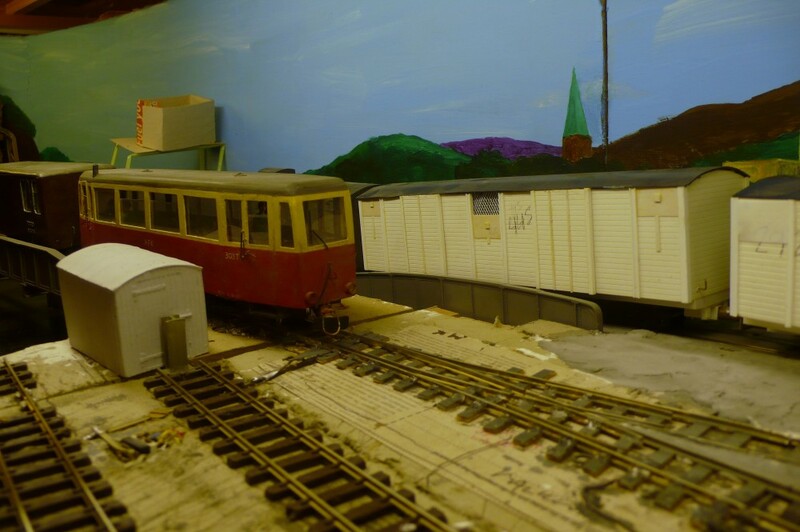 This stock will have to be removed and placed into various drawers before the later trains are set up to depart. 101. The local goods between Relforka and Lacono is finding plenty of work at Boursson. As usual the problems are compounded by the need to keep out of the way of through trains. 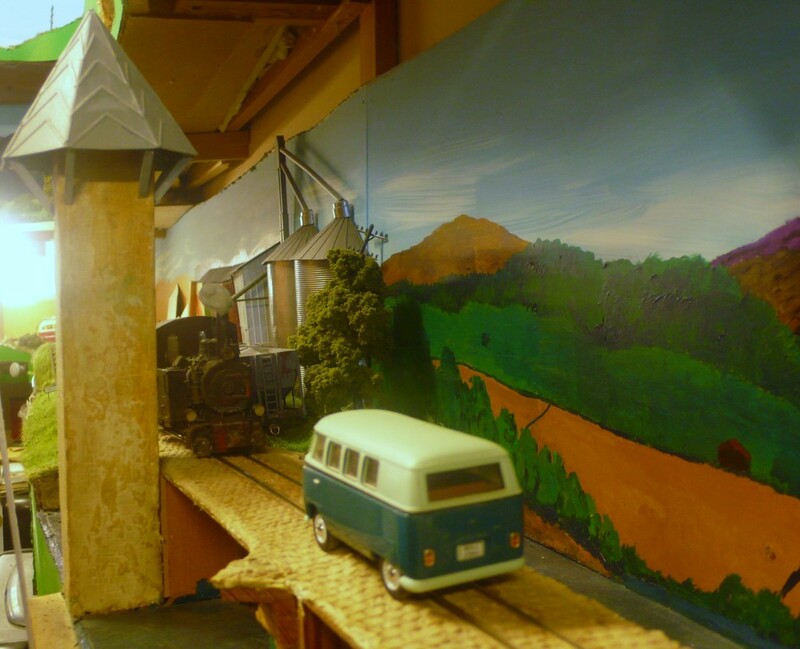 The loco has pulled the converted van, which is now a grain hopper, from the Co-op (photo 92) and has replaced it with a modified van. These have a pipe in the floor to allow for unloading but they are usually only seconded for this role in the harvest season. There must be a shortage of hoppers. The loco has run into the goods siding to let the FDV-RFK railcar pass and has left its train in the PFT. It has coupled onto the flat which has now been unloaded of the agricultural machine (see photo 22). In all probability the flat will be left here and collected by the down working in the late afternoon. 102. The car train crosses the viaduct over the Orbon at Caladonno during the late morning. This is another seasonal service that only runs when the high passes are blocked. 103. 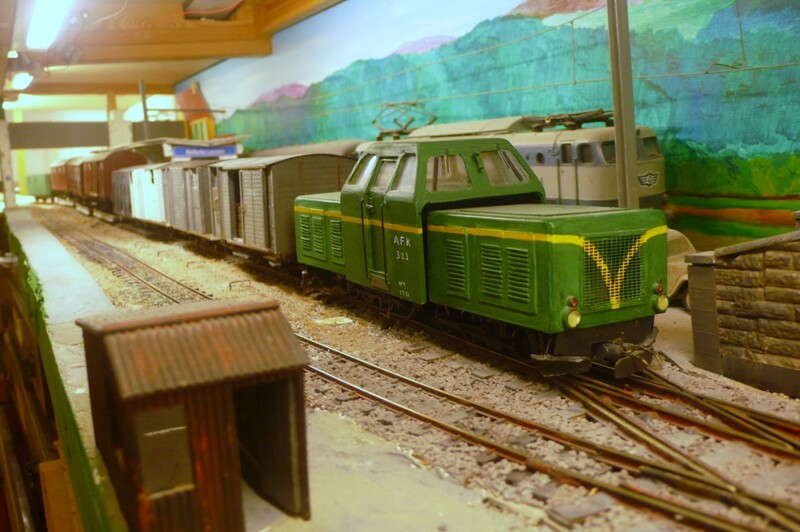 With the car train departed, a complex series of moves sees the CFS railcar coupled onto the TPO which will be carried across Calviero province to Krelm, providing a connection into Ruritania. As can be seen the train is signalled down to Rivabordo where it will reverse before running to Fenditavalat Orbonoraklifo as the timetable calls it but known to all and sundry as Bordanordo. 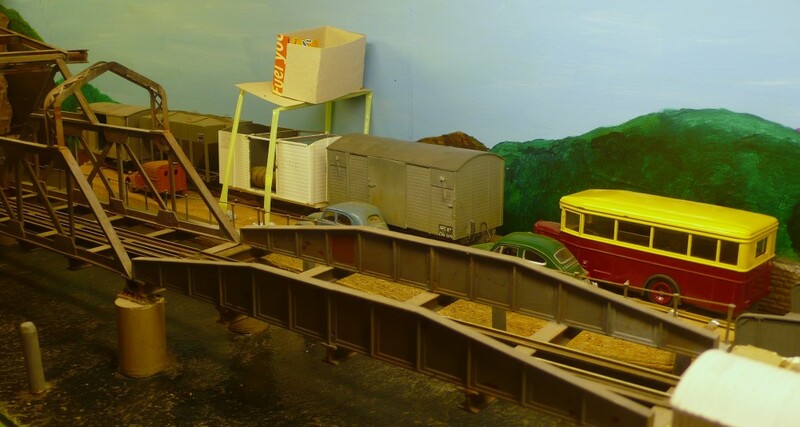 (These translate as Orboncliff and Northside respectively and show how difficult it is to keep track of the unmodelled places connected with the layout.) Arrival at Basabazaro is listed at 11.27 and at Orbonoraklifo at 12.15, allowing roughly three quarters of an hour for a journey of around one mile as the crow flies. It is not unknown for the more intrepid passengers to walk this part of the journey during pleasant weather to take some exercise! The arrival time at Strelsau, the capital of Ruritania, is listed as being at 21.10, after the connections have been made. 104. The train engine is ready to follow the railcar down to Rivabordo. 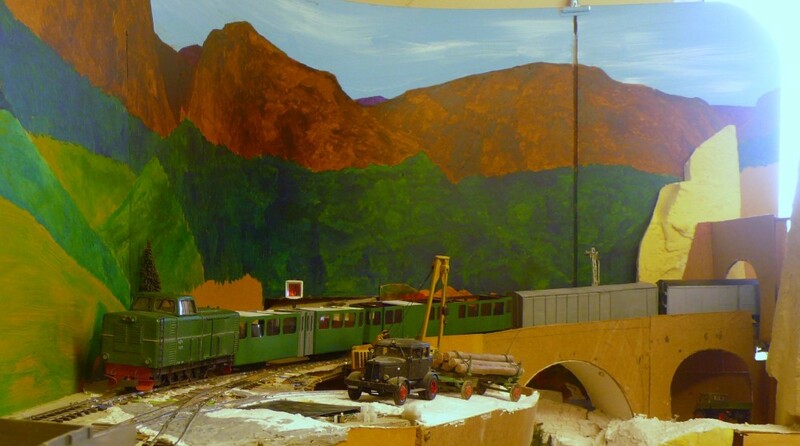 In actuality the unwieldy plank that acts as the cassette has been removed and the loco will take a shunt aspect before being removed from the hidden area behind the town. Departure of the return working is at 12.55 so there is only just time to clean the fire, oil round and take on water before the return trip begins. The connecting TPO (and through carriage in summer) are scheduled to cross one another at Orbonoraklifo. I hope shortly to build a CFS loco to ring the changes. 105. The banker is instructed to go up to Ithilarak to sort out the wagons there. It is seen here crossing the stream that enters the Vardenameo just outside Varden station. The stream bed has been canalised for use by winter sports and would, of course be frozen today. 106. The banker's departure means that the loco of the local passenger has to shunt as usual. 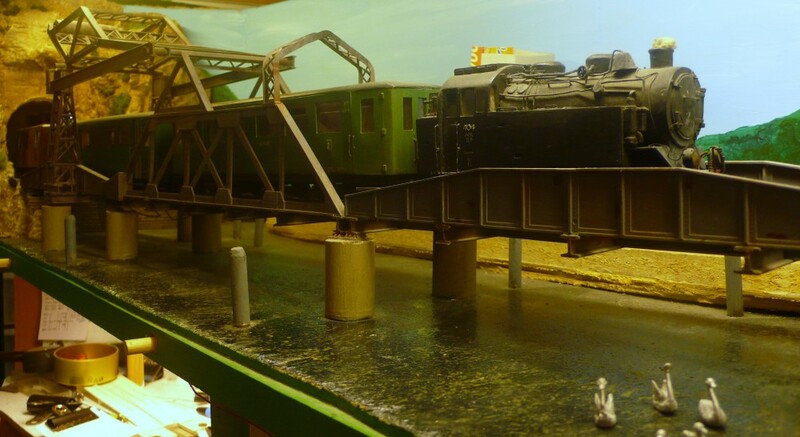 It pulls the ambulance and TPO detached from the FDV-RFK train onto the bridge to push them onto the front of the stock brought from Relforka. The TPO serves to transfer a lot of internal communication between the three sites of the University. The \Medical faculty is located at Urteno. Many of the more 'modern' science faculties such as Chemical Engineering are located at Lacono. 107. The railcar shuttle from Lacono is extended to Varden at this time of the year for the benefit of skiers. It is at the extremity of the (currently non existent) colour light signalling system installed in the pre-WWII era. 108. There is generally a midday hiatus in activities. 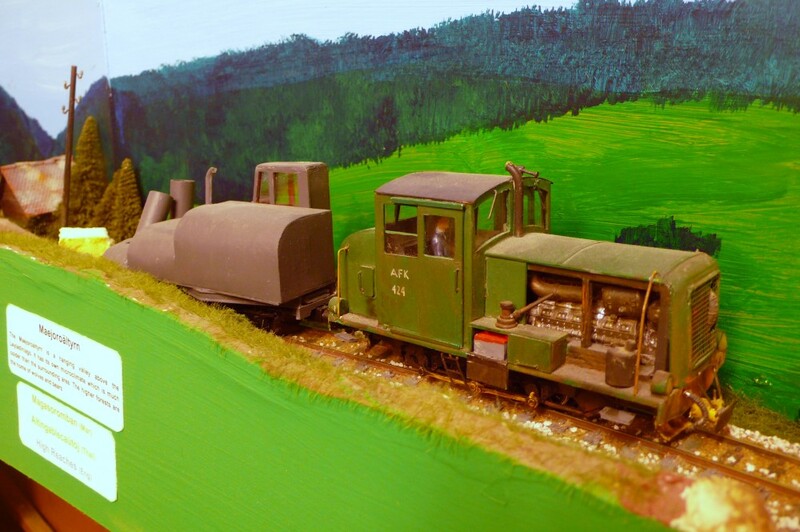 The Lacono pilot has finished shunting for the time being. The coal loads for the factories will probably not be delivered until the late afternoon whilst the KTT afternoon goods has been roughly formed in the near road. 109. The local up goods stands ready to leave Boursson approximately half an hour late. This train often runs early but today has been busy. 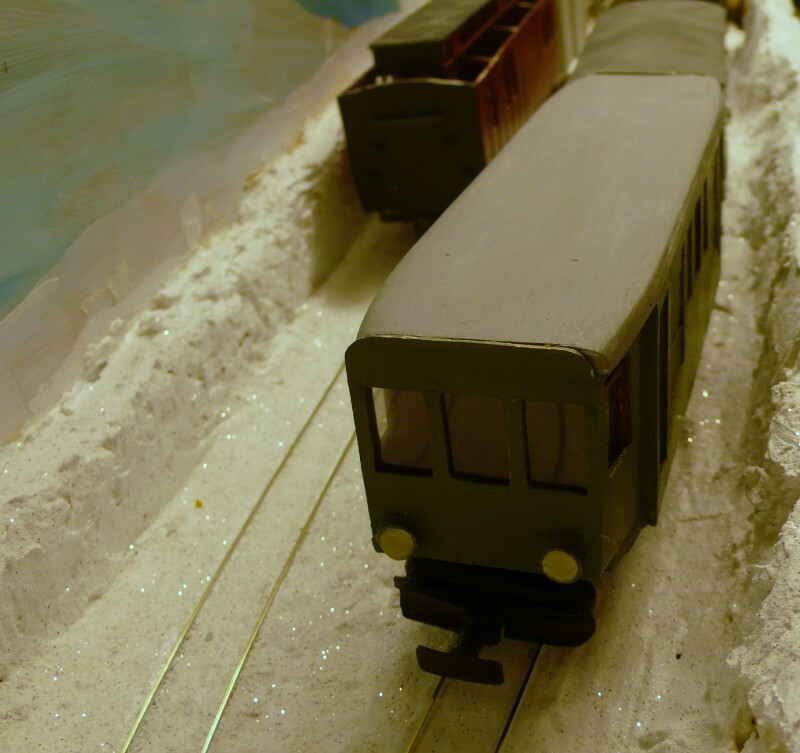 The rear van contains sugar for Sojonno so it will be marshalled into the down train. 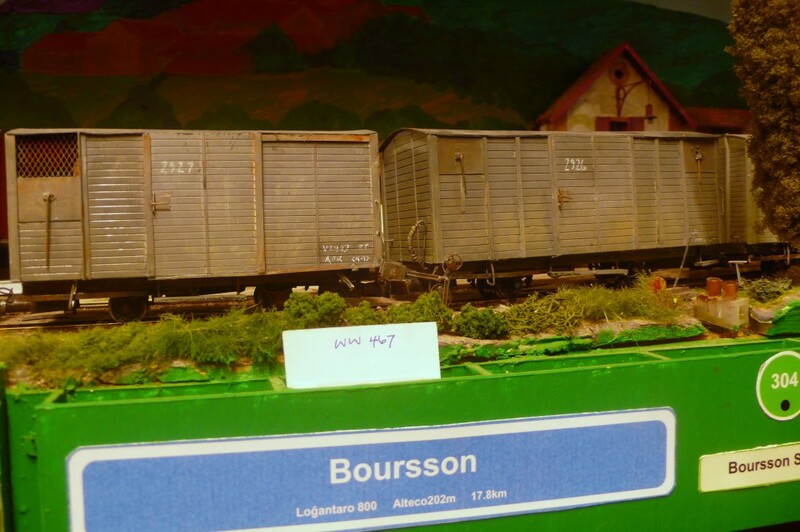 The other two wagons contain malted barley for the breweries at Karamspur and Bitrano (on the CFS). 110. The banker finds plenty of work at Ithilarak. Having removed a couple of hoppers from the mine and attached some vans it restarts its uphill shunt from the top of the Vulpafaukangulo. 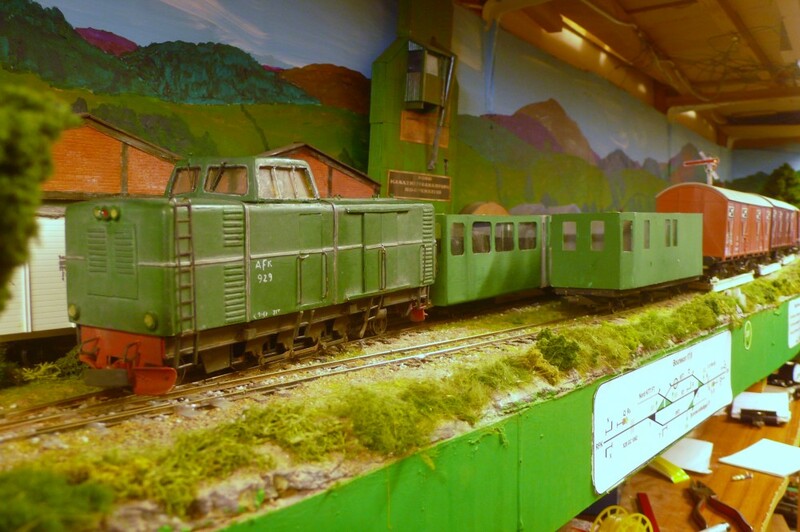 Whether it would be advisable to go onto such a steep gradient to perform shunting moves is a moot point but, as with many model railways, lack of space prevents.any choice. The observant will note, as well, that the shunt move is outside the protecting home signal, which would never occur in reality. 111. 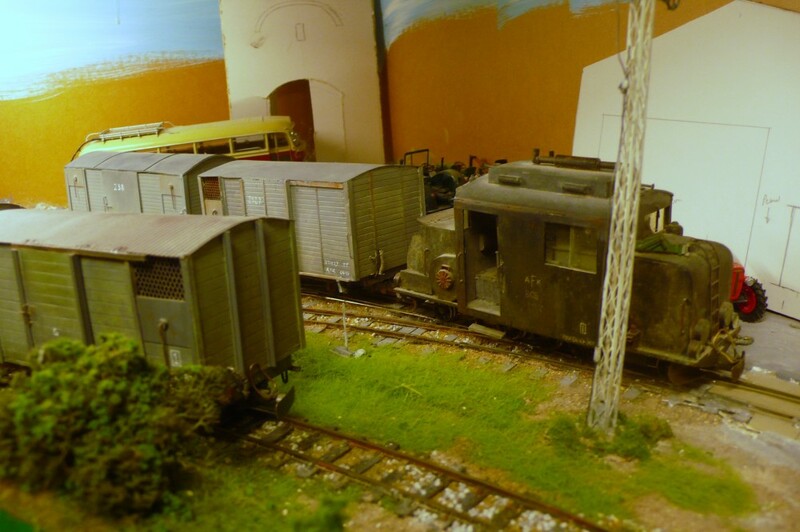 After the better part of an hour's shunting the banker is ready to depart with four wagons. This is the maximum allowed in the Instructions without a brake van being attached. Even so there are wagons being left behind but these can hopefully be dealt with by the afternoon goods. 112. The car train arrives shortly afterwards and terminates. There is supposed to be a loading platform alongside the loop. Given that this train will occupy the loop for some time to come this was one reason why the banker/shunter was ordered to sort out the problems before its arrival. 113. The clock has passed midday, a period when the AFK takes a breather after the morning's frenetic activities. 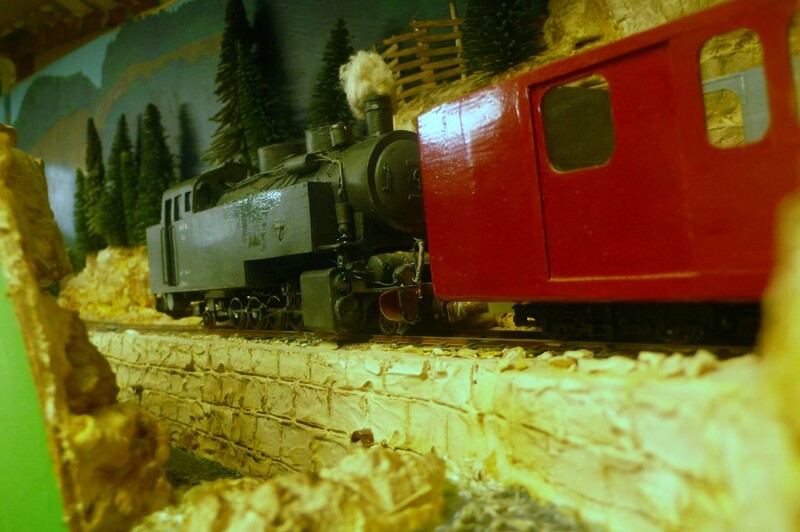 The train engine from the URT-LAC local pushes the Post vans into the Post Office platform. 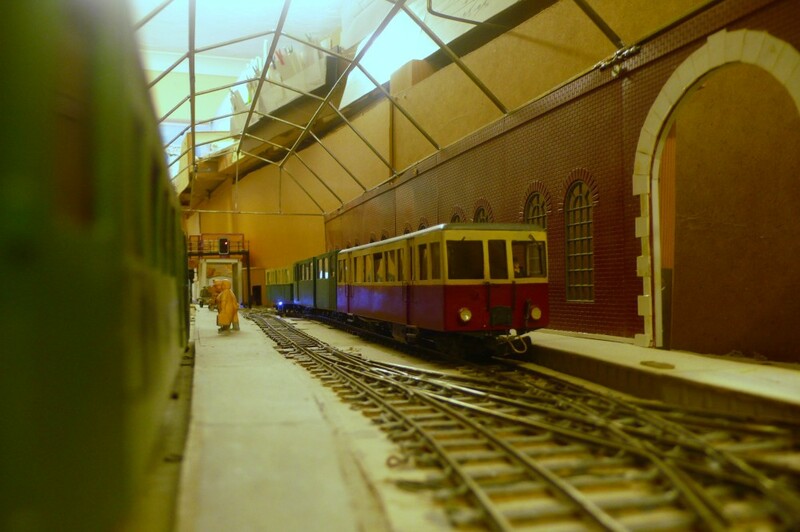 The railway ambulance will be placed in platform 1 to allow easy access for ambulances from the Station Square. 114 The LAC-URT shuttle drops down from Varden to connect with the AFK bus which has crossed the lake via the ferry on the run from Callistano. 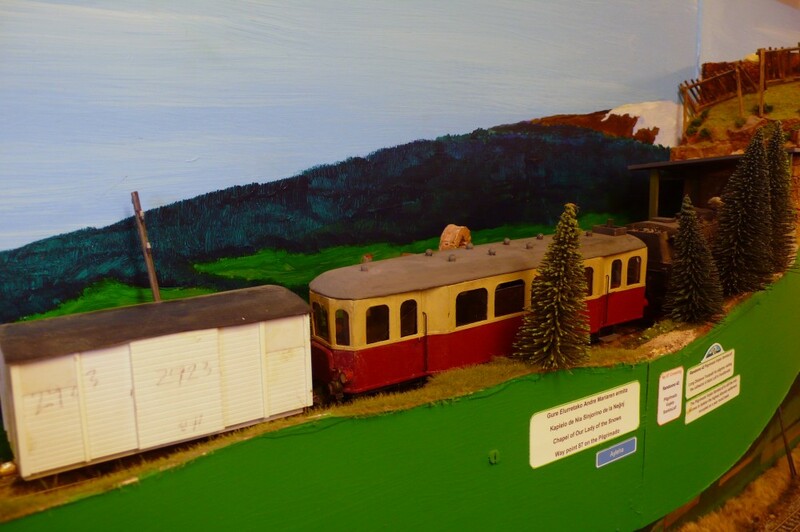 The train is virtually empty at this time of day, especially seeing as Varden is served by the Urteno tramway system. 115. The Superantaǔpordo clock has moved round to show that the CFS train has arrived on time to connect with the AFK express. 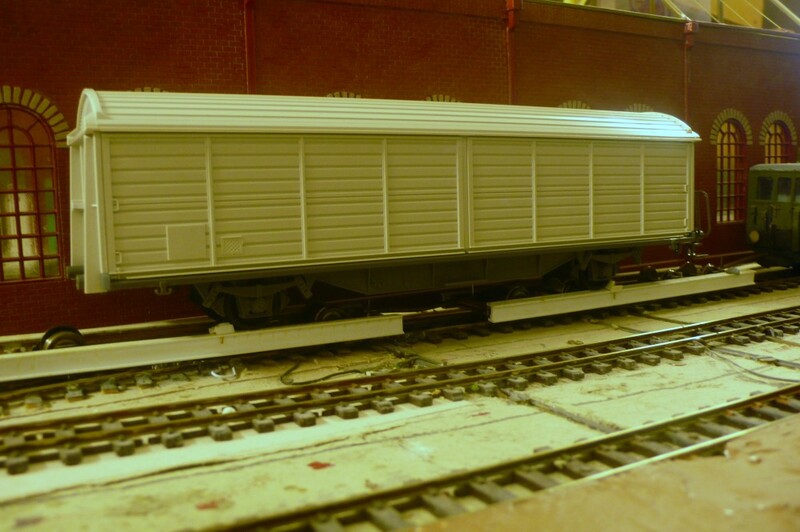 The railcar, which is indistinguishable from its counterpart shown in photo 103, (because it is the same model!) made the crossing at Orbonaraklifo and has reversed at Rivabordo. The train loco will follow shortly and transfer the TPO onto the train. 116. The Tp2500 has been called to run the afternoon mixto today. This will save any piloting issues over the Helcaraxë Pass. The train picks up a slide wall van at Lacono which would definitely put it over the haulage capacities of the steam engines given the loss of thermal efficiency in the frigid conditions appertaining at high altitudes today. This is one reason why steam locos reign supreme on the express once snow has fallen in the high passes. The winter consists are light enough for them to handle without assistance. 117. The railcar shuttle has returned to Lacono from Varden and coupled onto the ambulance. This is one of the few workings scheduled to run into platform 1, which normally sees use as a carriage siding. The diamonds at the near end and the far end restrict train lengths if the adjacent sidings have to be accessed. As a result it is something of a white elephant, although it helps to create an impression of importance. It is apparent, even in this photo, that the train is standing beyond the far shunting signal. The station's main entrance hall will eventually be behind the archway at the right. 118. Running as train 0001 the loco from the car train has returned to Cadsuine-Fanhuidol to pick up the log load in the foreground, as seen from the balcony of the station house. The train number was generated from the standard sequence for identification. 0 indicates light engine and the second 0 indicates "other destination" (not included in the list of stations) whilst the 01 indicates its position in the sequence. It will return as train 9602 propelling the wagon, as allowed for in the Instructions. This number was generated as: 9 extra goods, 6 Ithilarak destination, 02 position in sequence. Quite how the wagon was loaded is a mystery given the lack of a fixed crane in the yard and the restrictive nature of the low bridge across the only road into Cadsuiane (see photo 12). This is, of course, yet another model railwayism. 119. The Eromarbordo shuttle shunts wagons, as required, during its layover at Glissent. Shuffling wagons with a small railcar restricted to moving four of them at a time is no sinecure when a larger number are present, as here. Time is wasted in making two draws out of the siding rather than doing it all in one go as a loco would. The up afternoon goods has a restricted window for shunting, however, and it is expected that the wagons will have been repositioned so that it can make a prompt departure. 120. The Meyer waits at Relforka with the afternoon goods to Eromarbordo. 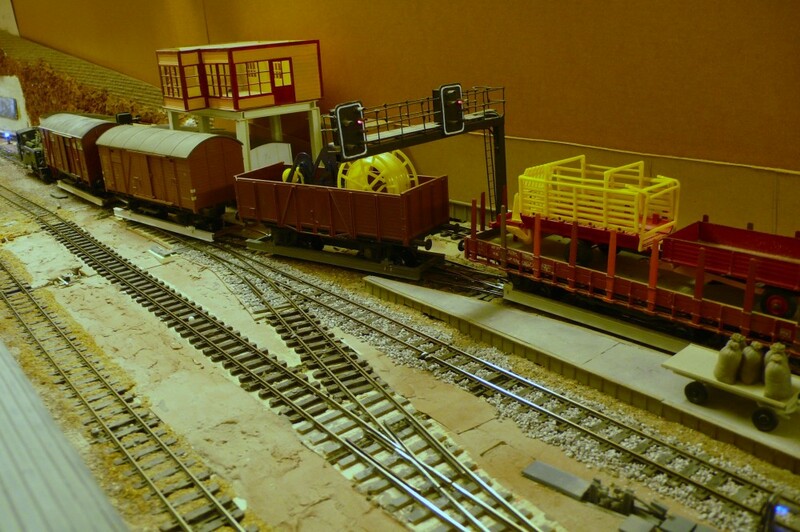 With the mixto having left, a SG shunter clatters over the crossings, in front of the NG train, with a cut of wagons. 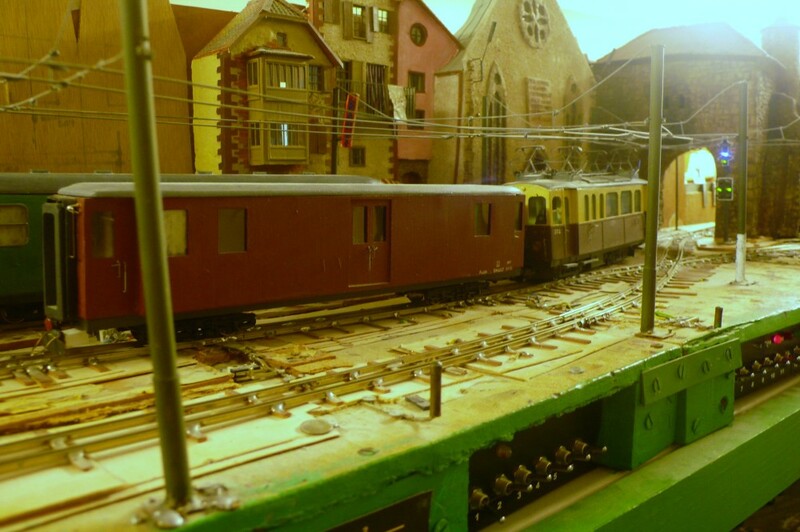 This is a staged photo because the SG is not electrified and the loco motor is, apparently, burnt out. 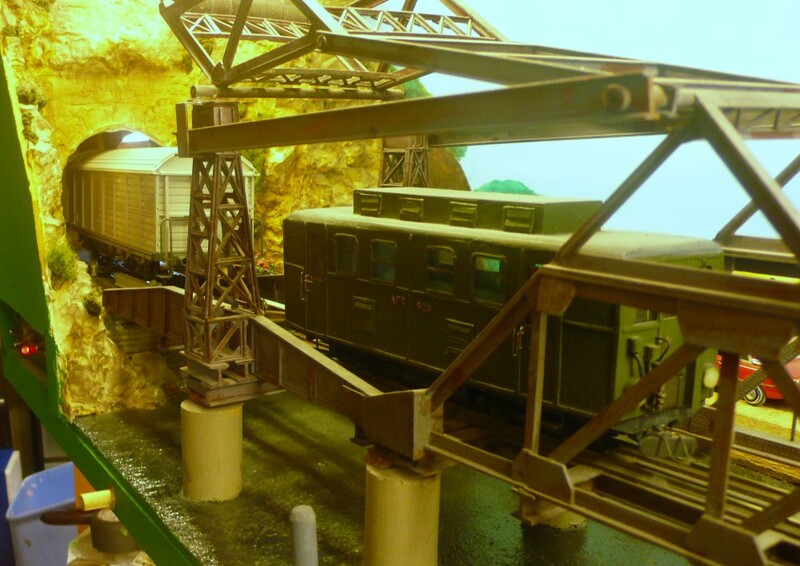 The SG loco usually lurks under the bridge, well clear of the NG. In actuality the SG stock seems to take issue with the mixed gauge crossing but I have not rectified the problems because it is alright to the eye and works through both NG routes. 121. The Jakarutu train has arrived at Ithilarak to provide the afternoon connections with the mainline trains. 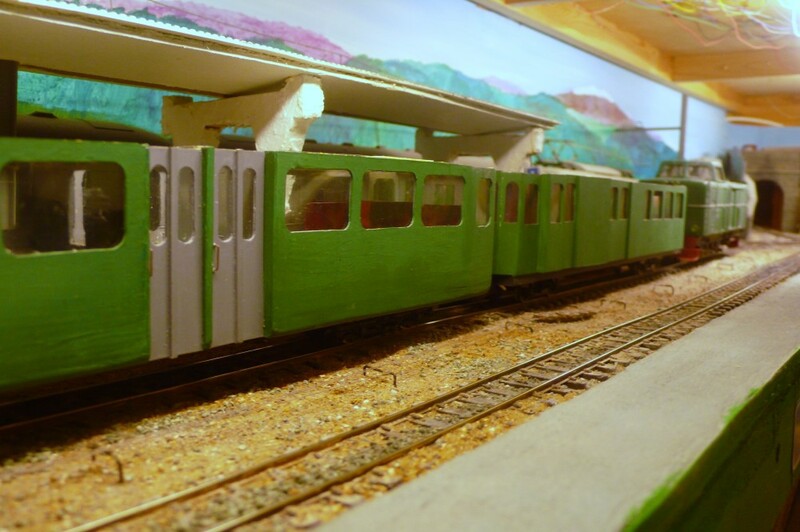 The car train occupies much of the loop with the result that the branch train cannot stand clear of the points. It will wait until the car train departs before drawing forward, dropping off the van and picking up any traffic for Jakarutu. 122. Having returned from Ithilarak with the trip working the banker/pilot shuffles wagons in the 'coal' sidings at Urteno. The majority of the traffic is bound for the Karamspur brewery across the lake. 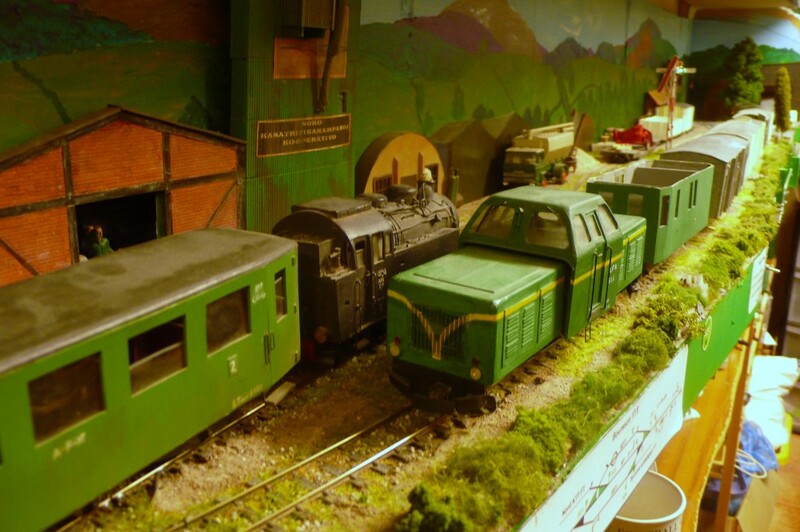 By early afternoon the railway is rounding up as many waifs and strays amongst the vans as possible so that there will be enough on hand at the brewery for tomorrow's traffic. Two of these are loaded, however, with one bound for Eromarbordo. This will be picked up by the last railcar of the day as experience gained over the years shows that this is the easiest and fastest method of forwarding this traffic. 123. Two articulateds pass each other at Breĉo de Glissent. 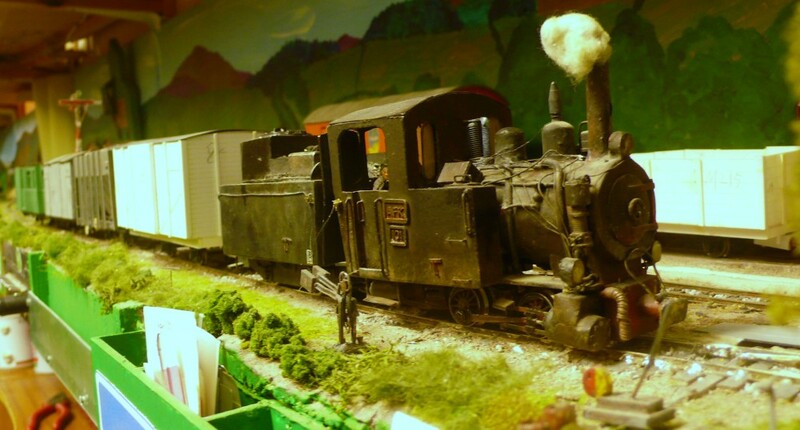 The 0-8-8-0T is on its return working which involves a quick turnaround at Relforka. Usually this train is not too heavily loaded but it is near the maximum today. The Meyer has finally picked up the grain hopper which was left here as a result of the problems in the early morning (see photo 58). 124. The ambulance runs on an intensive diagram and, having been unloaded it will be forwarded by the railcar to be taken to Relforka to transport patients from the Kasatritikakamparoj to the hospital in the evening. 125. Once the road ambulances have retired the limousines begin to ferry the well-to-do from their hotels and sanatoria down to the station at Urteno. The pilot has pulled the Pullman from the siding so that the wealthy clientele can board at leisure. It will attach the vehicle to the down express when it arrives. When it reaches Relforka the carriage will then be handed over to the MFR to continue its journey down to Cassarta on the coast. 126. The express is dropping down the Vulpafaŭkangulo and runs through the Aepto gorge. The fence in the background provides protection from falling boulders. 127. All railways form their own routines and when everything is running smoothly a couple of simple moves suffice to get the job done. As scheduled the Lacono pilot adds the slidewall van loaded with empty milk containers onto the back of the mixto. This, and the van in front which contains unpasteurised milk, will be swapped for similar vehicles at Fenditavalat dairy. 128. The routine continues. 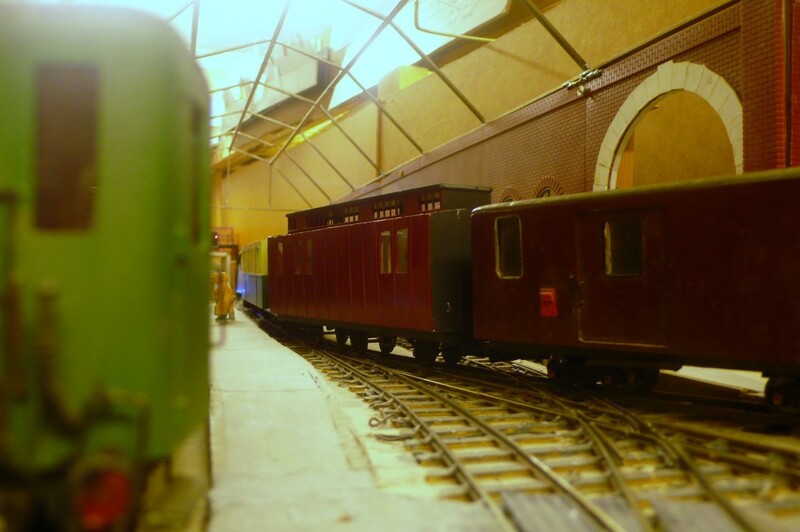 The railcar and ambulance arrive in platform 1 at Lacono. 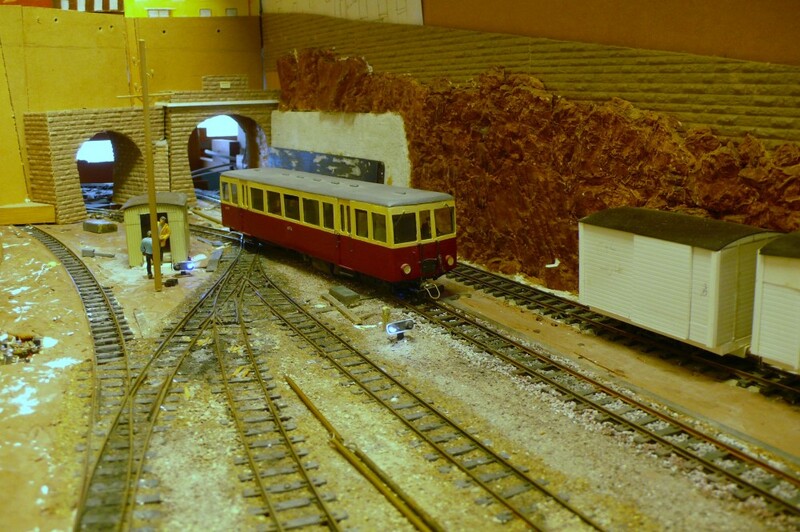 The mixto is set back in platform 2 to provide the clearance necessary and the local stands in platform 3. 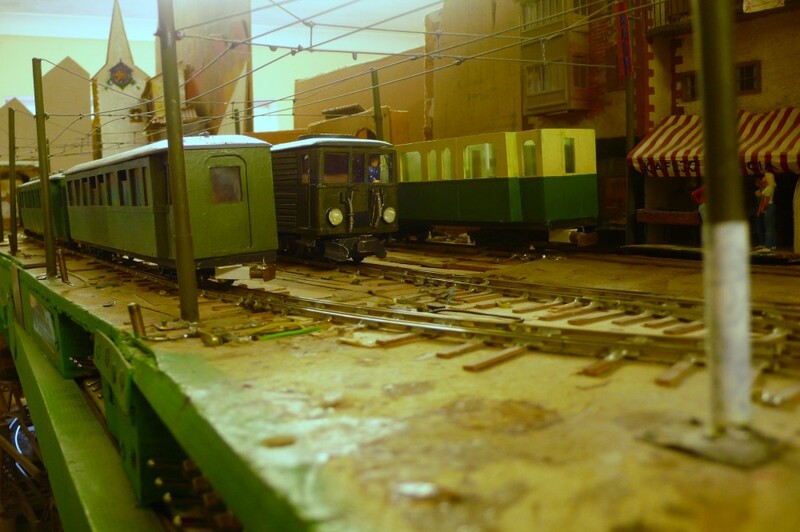 Once the railcar has pulled in the mixto will depart. The railcar will then run to Aspargo leaving the local's train engine to pick up the ambulance and place it on the front of the train. The road traffic in the Karushnaostrato is as chaotic as ever. 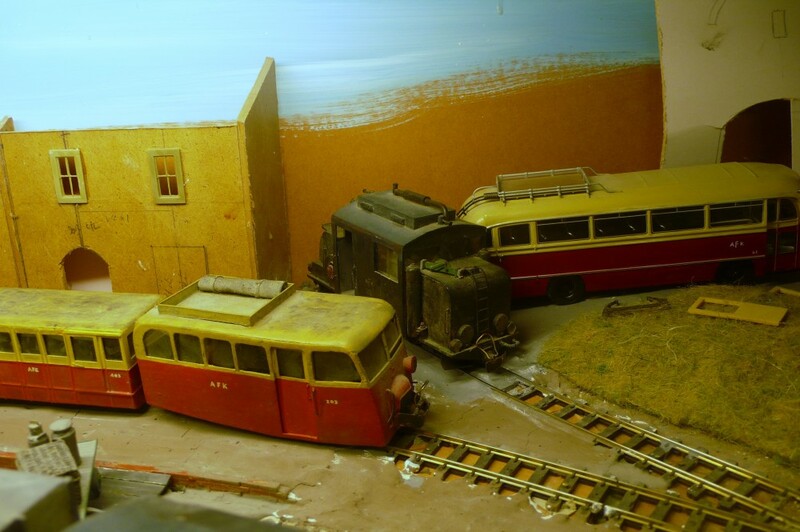 The O scale trolleybuses (which replaced home made conversions of 1:50 models) still await completion. 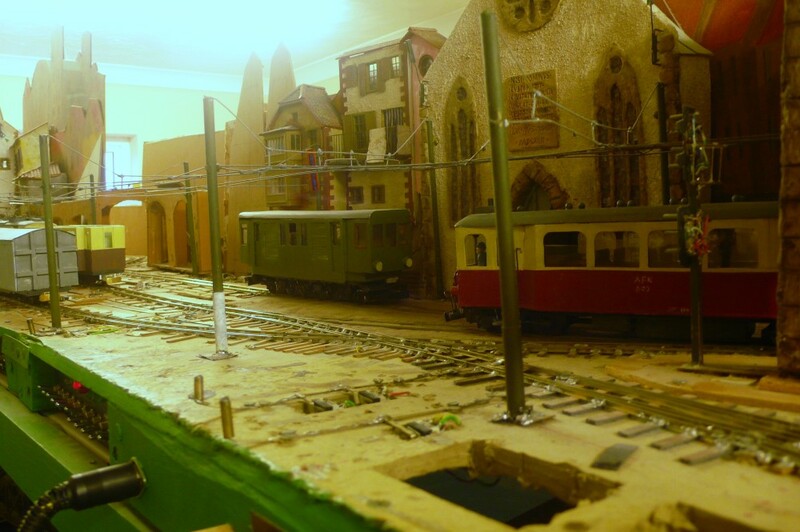 The wiring in the right foreground has also taken a bash and needs remedial attention. 129. With the express having cleared the Ithilarak-Ospicio section the car train pulls out over the upper gorge of the Aepto to begin is journey. I was working on this scene when my father died and for one reason and another it has been left in abeyance ever since. 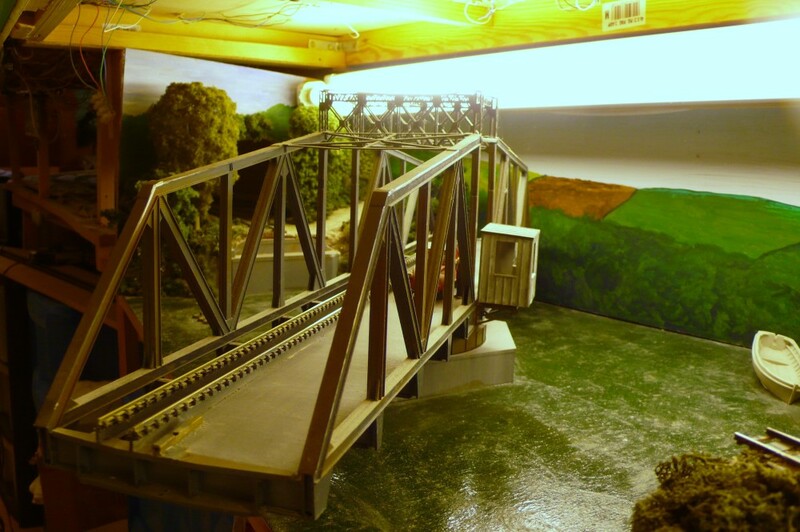 The lower level is completed but the railway viaduct and cuttings need further work. The drawing pins will probably stay! 130. On the other side of the summit the afternoon FDV-RFK goods has reached Caladonno, where it makes the station stop. The view is taken from the road bridge where the RN 424 passes over the railway. Unfortunately the University buildings from the lower level intervene but the brain usually 'airbrushes' them out. This is perhaps the first photo to capture the 'sparkle' of the ice crystals. This effect was created by mixing silver glitter into the Woodland Scenics snow. The track brake on the loop is just visible inside the right hand rail. 131. The car train passes through Ospicio d'Helcaraxë. The local goods has pulled into the PFT to give it a clear run. For such a remote isolated spot, built in the middle of nowhere, mainly for operating purposes, there is a lot of activity here during the middle of winter. the two plough trains are based here during the day time and as the afternoon draws on there is every likelihood that their crews will be called upon to earn their money soon. As an aside, it occurs to me that to be consistent with the use of the Marronĝacan language that I should refer to this station as "Talan" but the Thalnian "Ospicio" has become so engraved in my mind that I invariably refer to it as such. 132. The mixto arrives at Urteno to find the express waiting for it, as shown in the timetable. The express will stop at Ghealdaban on request but once it leaves Lacono it will run non-stop across the Kasatritikakamparoj except in the unlikely event of passengers from the north of Lacono wishing to alight at one of the two stations. 133. The local service across the Kasatritikakamparoj waits in platform 3 at Lacono. 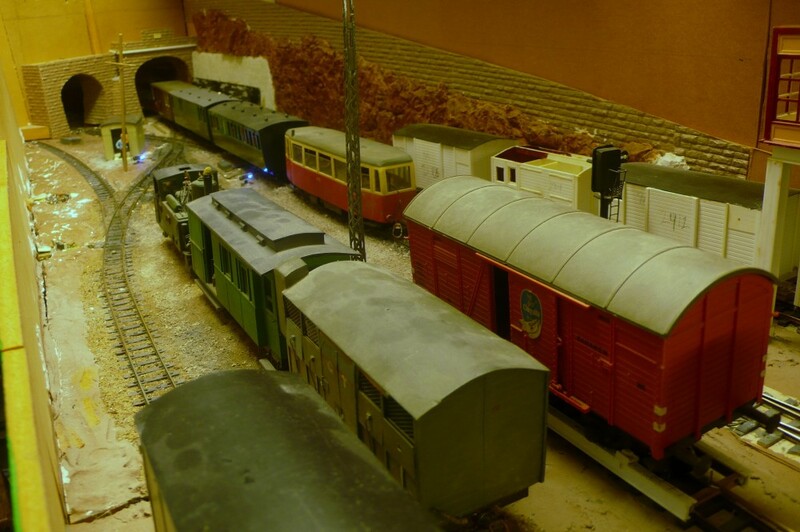 The RFK-FDV goods has pulled into the yard at the left and is busy exchanging wagons. 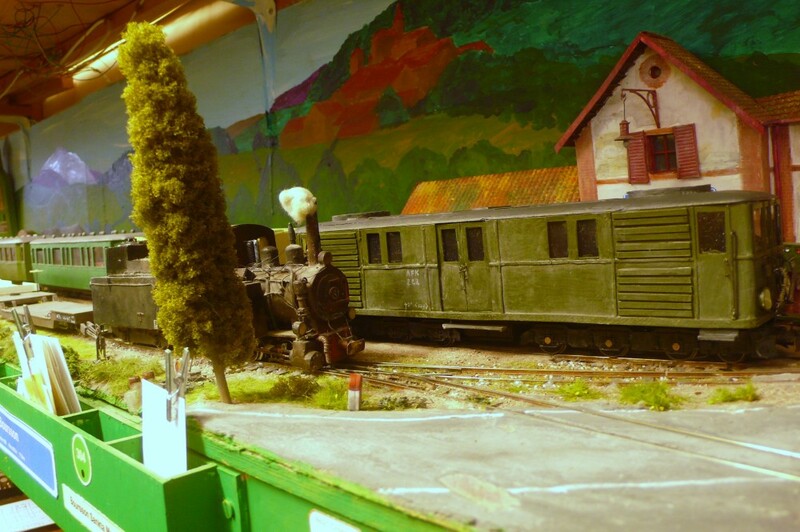 The observant will notice that the local's loco is standing beyond the starting signal. This was/is allowed for in certain circumstances under BR/Network Rail rules. The ambulance has been retrieved from platform 1 and attached to the train but it will run empty over this leg of its diagram. 134. 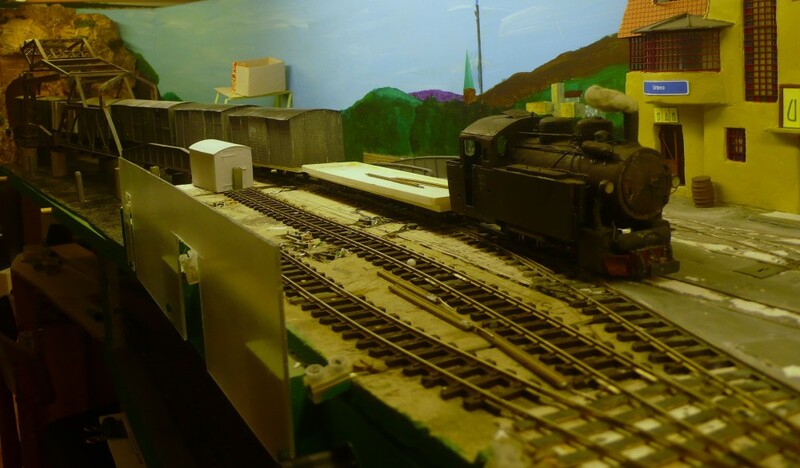 The 2-6-2 diesel has been stopped for minor repairs so the up local goods working is taken by the 0-8-0 which has swapped diagrams. 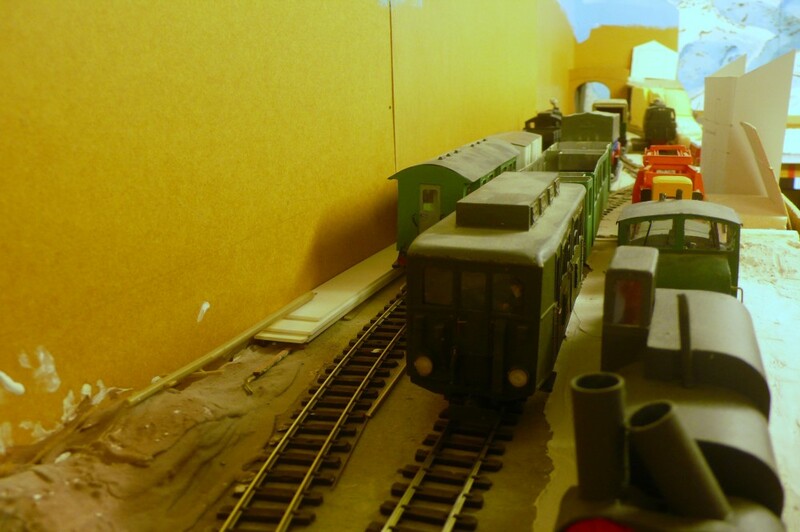 The diesel's buffers are set slightly too high so that it overrides the buffers of adjacent wagons every so often. An inspection has also revealed that it should be possible to pivot the buffers without too much difficulty as well. 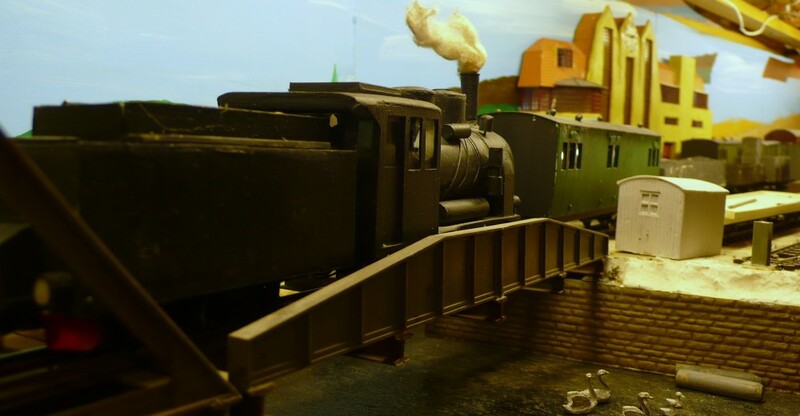 The original rebuild used fixed buffers, which is all that was possible on many smaller locos. The loco is pushing an open covered with a tarpaulin into the goods siding at Glissent. So far it has done all that has been asked of it without fuss, in contrast to the last session. 136. The Fenditavalat pilot finishes pulling the milk wagons from the dairy and shunting them. The two vans' positions needed reversing so that the loaded slide wall van can be dropped off at Lacono and taken to the Carrodontis confectionery factory. The ventilated van will return empty churns to the stations in the KTT, where the cattle are in their winter quarters. 137. The mixto is climbing the Vulpafaŭkangulo and makes the stop at Varden. It must be quite a sight to behold for any unsuspecting walkers using the forest track, although they would have heard it coming from a mile away. The train is being banked in the rear by the 0-10-0T as there are no transporters in the consist. 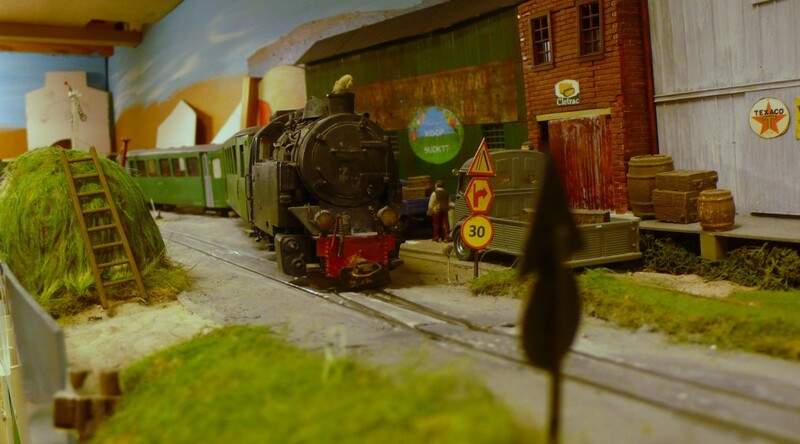 The wagon card for open 216 (Malferma 216) can be seen in Varden's consignment box in the foreground. As has been noted elsewhere (photo 55) there is no traffic today from this remote siding in the forests so the wagon will stand until tomorrow, or whenever another load is offered. 138. Although there is no traffic from Ospicio during the winter it is often necessary to shunt so that wagons brought here from Cadsuiane-Fanhuidol can be forwarded. This wagon was tripped here by the counterpart train during the morning (photo 56) and is now being picked up by the return working. Traffic loaded after the morning train has passed is sometimes worked to Ithilarak by a special trip working, as has happened today (photo 118). 139. 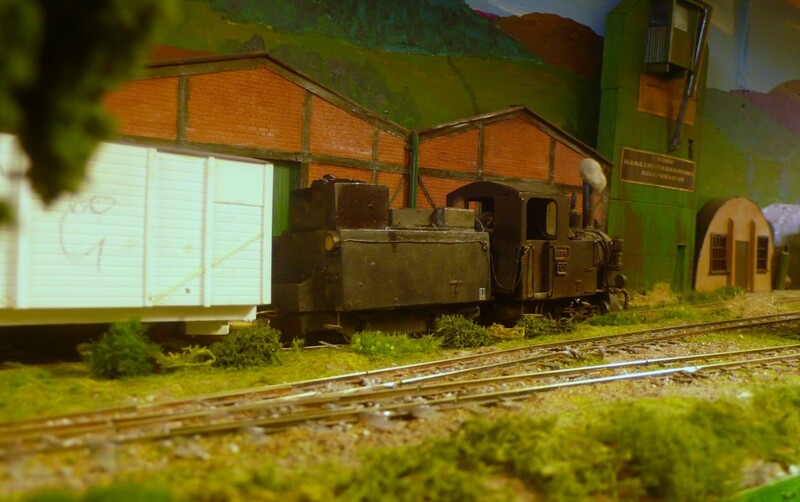 A snapshot taken of two vans with consecutive numbers thrown together during shunting at Boursson. They were obviously built to different diagrams. 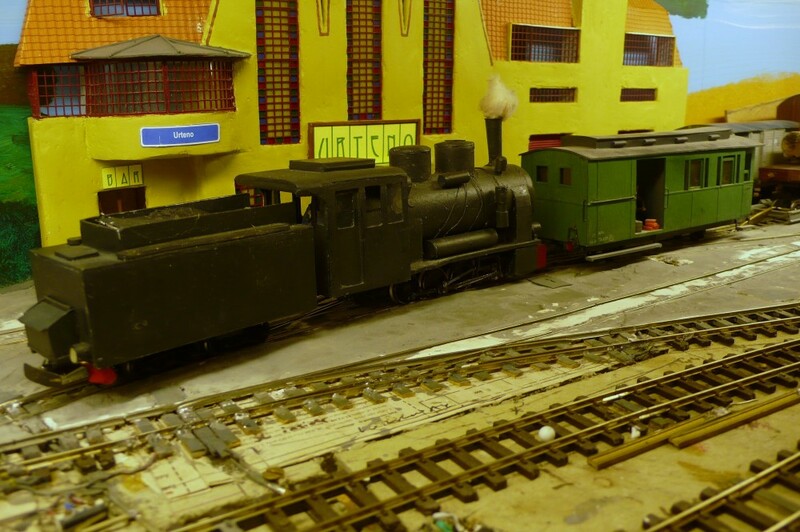 There is now sufficient stock on the layout that such an event is something of a rarity. The avowed intent of painting all the wagons during the course of the session will, more than likely, not be met but the severe equipment shortages are now some distance in the past. 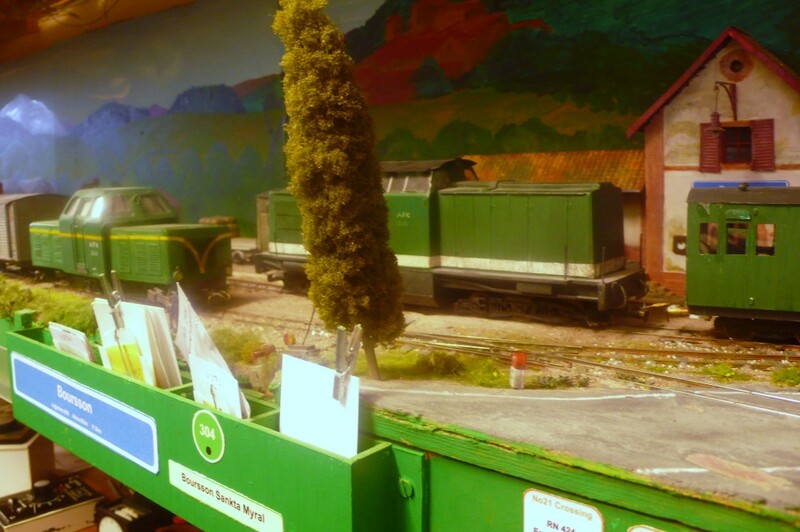 The boxes holding the wagon cards at the station are visible in the foreground. These were crudely constructed (and painted by the look of it) from styrene sheet. 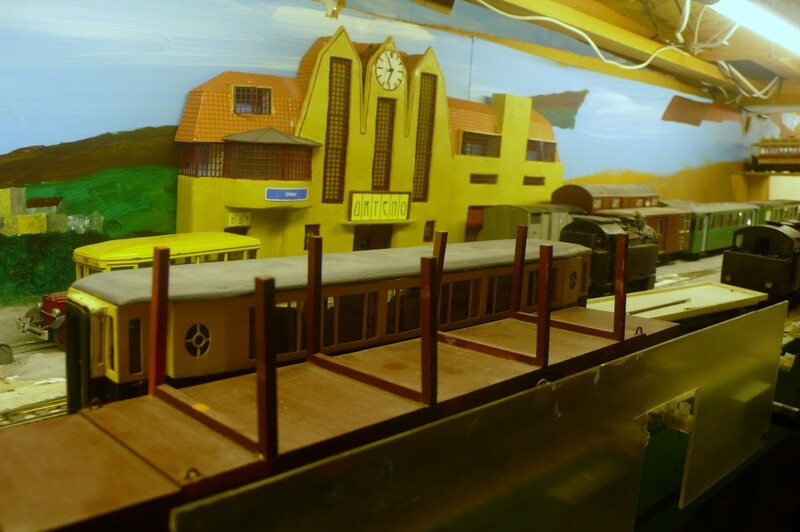 The wagon cards themselves are on the desk below the station so that the models can be sorted out as needed. 140. 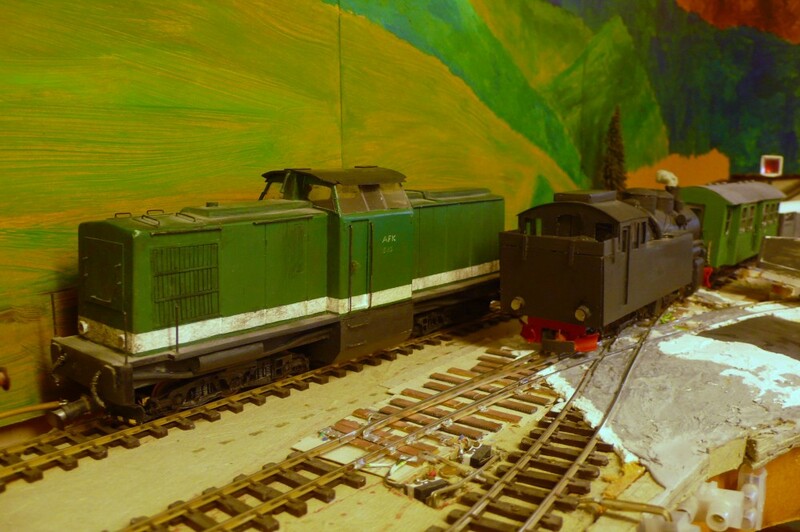 The local goods has arrived at Eromarbordo and has begun shunting. The first job is to push the grain hopper into the silo unloading bay so that this can take place during the remainder of operations. The empty hopper can then be ready for picking up before the train leaves. 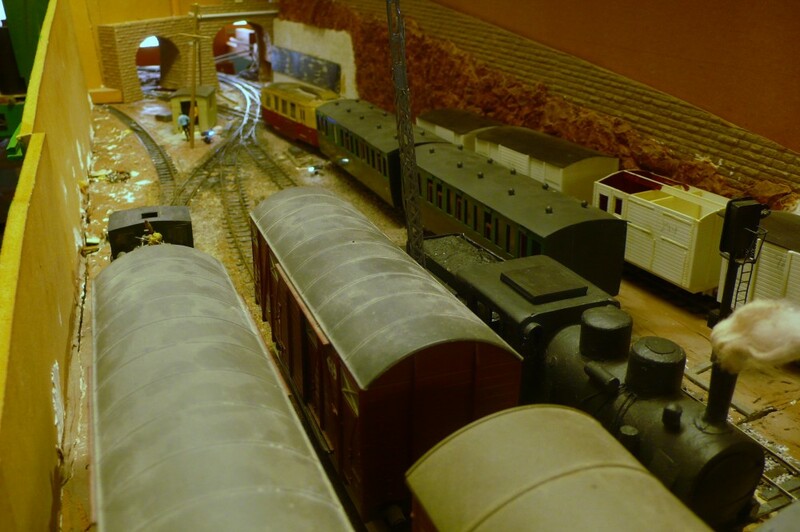 The low level of the lighting is obvious in this picture and has been previously remarked it was not possible to place it at the front of the layout in this location. 141. 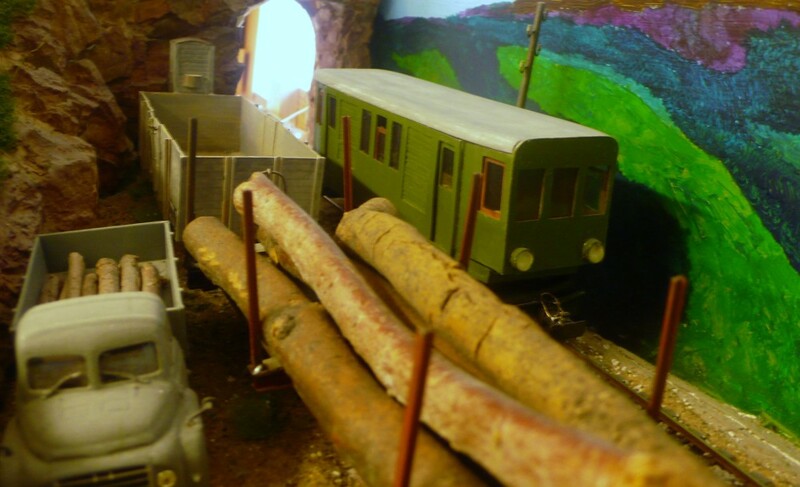 As the shunting continues the Levjatano is removed from the "sea" and placed onto a nearby shelf. This protects it from damage and allows easier access to the quayside. Most of the road vehicles have been removed as well. 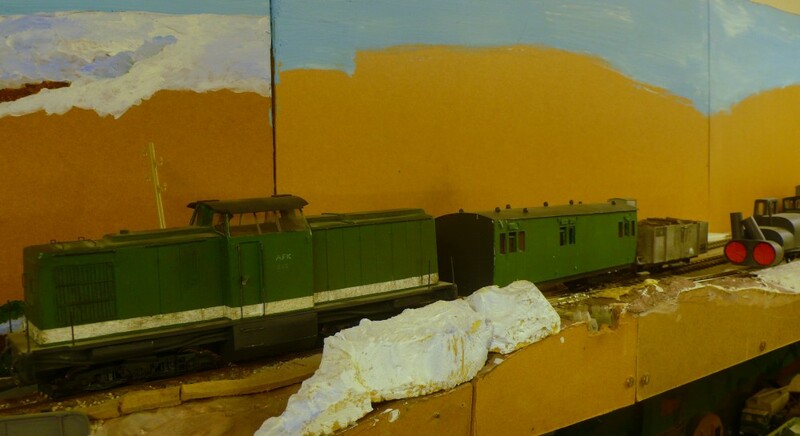 The loco is attached to the front SG refrigerated van and is about to tow the second van (a Lima repaint) into the fish market. 142. 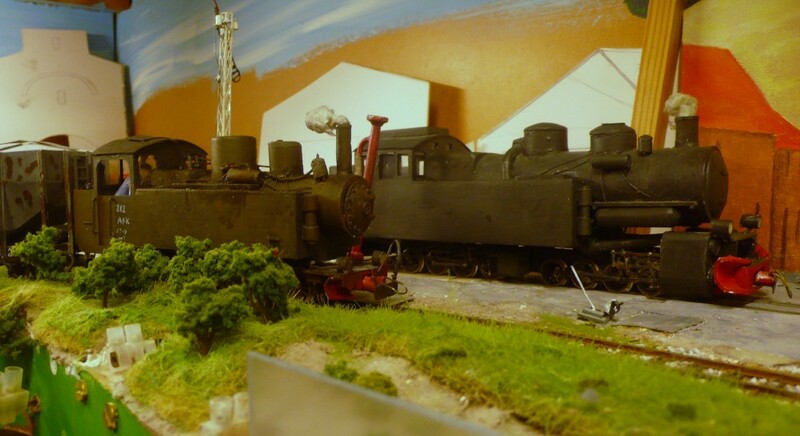 With the shunting finished the ship is replaced. 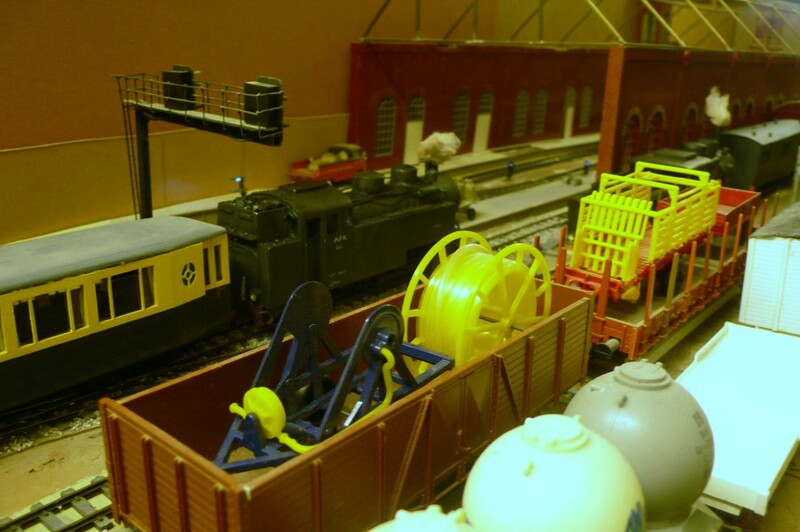 Careful observation will show that the hopper has been picked up from the loading bay, visible behind the loco, and is included in the train. It will be cut out at Breĉo de Glissent on the way back. The first van is loaded with fish boxes bound for Lacono. 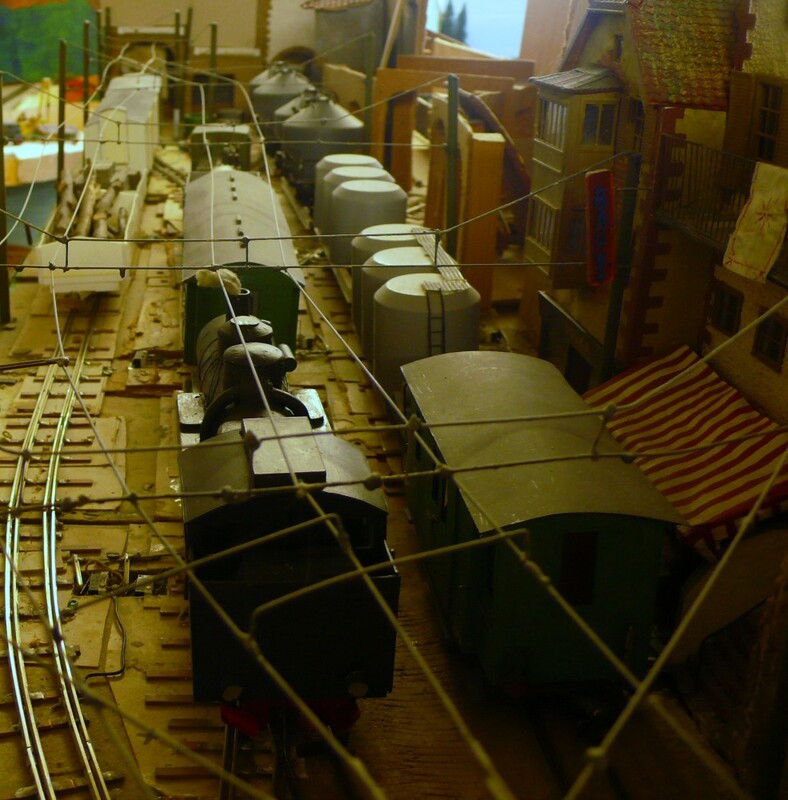 It has taken over 90 minutes to make these shunts due to the space restrictions and the complicated nature of the track layout and there has been no need to run onto the Town Staithe, which trails into the layout, today. 143. The express leaves Lacono on its journey to Relforka. 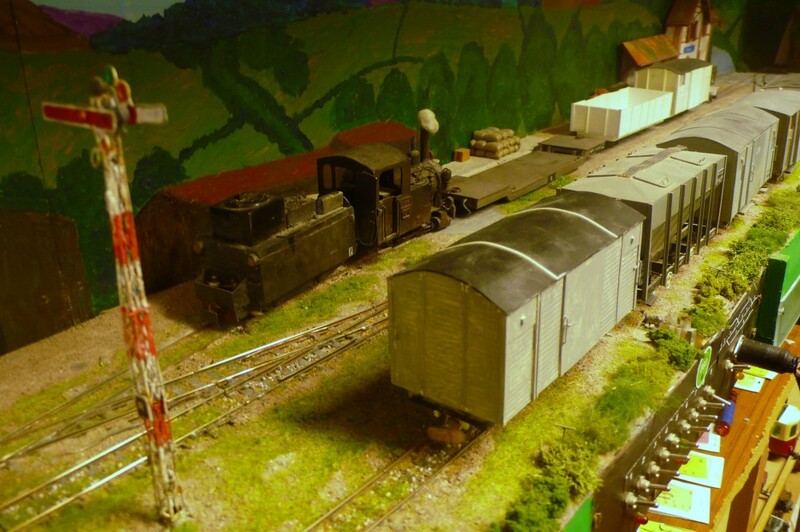 The brake van in the right foreground belongs to the RFK-FDV goods whilst the KTT evening down goods has been made up at the left. 144. The rack branch loco has finished its work for the day and retreats to the shed at Jakarutu. The ganger is still sharpening his scythe, even after returning from his day's work! 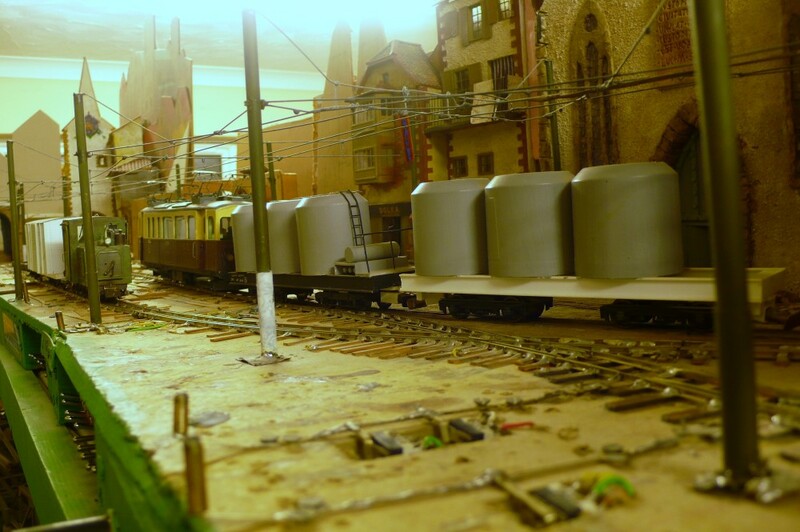 His trolley is in the foreground. 145. The Urteno pilot/banker shunts at Ithilarak after the mixto has left. There are four loads (the stake wagon counting as two) to be taken down the hill and a bogie SG wagon is also loaded at Urteno. The wood siding drops steeply away from the mainline and the large stop block is a necessary rather a cosmetic requirement. The goods, which has left Ospicio by now, will pick up two empty vans for the brewery and would be overloaded if these wagons were not tripped down the Vulpafaŭkangulo. There are sufficient wood loads knocking about by now that it looks a s though a special train may be needed to shift them. 146. 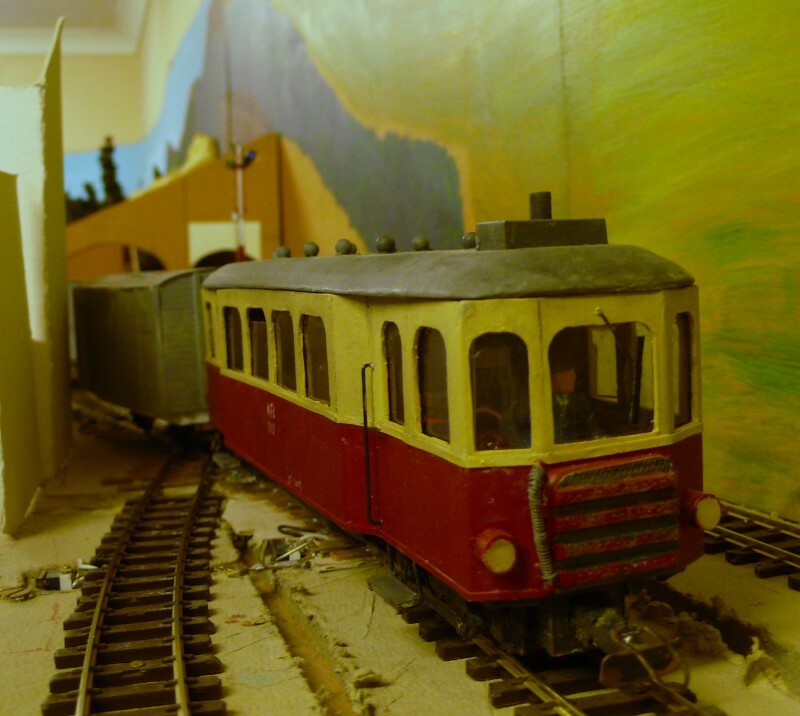 Once the shunter has taken the car train down to Rivaboro for unloading the schools' railcar runs up to the Basabazaro to wait for departure time. The ungainly loco (a I-B-B-I) waits to return to the depot. The railcar will run onto the CFS trailer which has been uncoupled from the electric railcar and push it beyond the points. This is another area that has been in abeyance for some time and could do with some attention. The signal's wiring should be covered, for instance, and I discovered a few days ago that it is still not fixed down! 147. 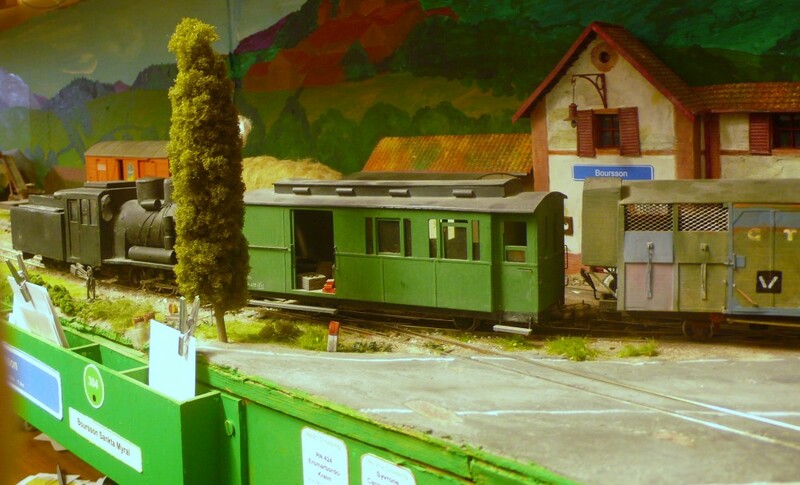 The 0-8-8-0T stands in front of the furniture factory at Urteno. It will have to do its own shunting as the banker is still returning from Ithilarak. 148. The RFK-FDV goods has finished its work and stands waiting for the banker to clear the section to Ithilarak. 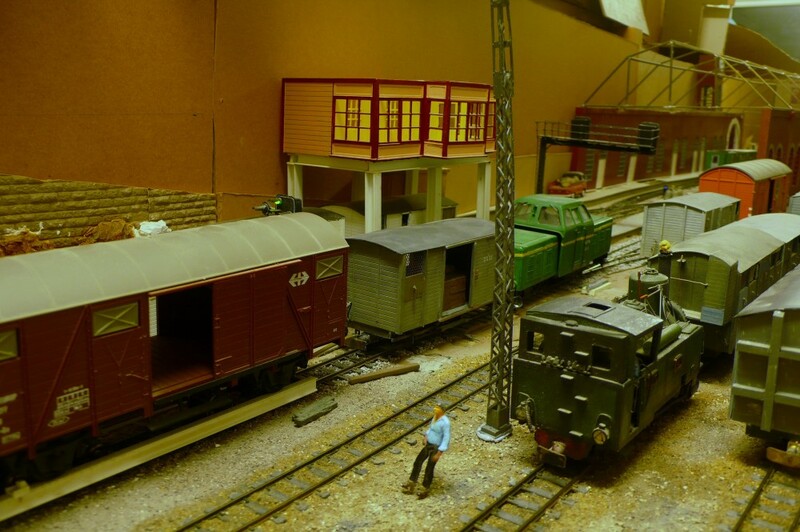 Two wagons have been dropped off which stand on the nearest loop. 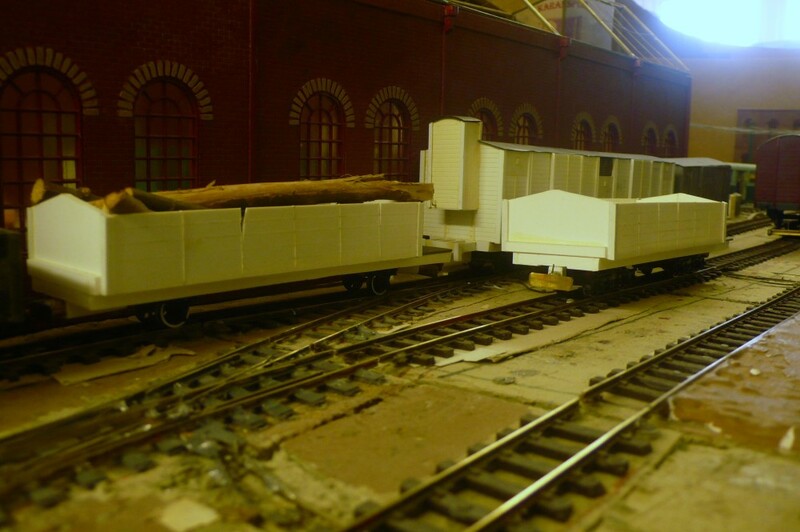 The SG bogie flat, loaded with logs, has also been pulled out of the wood yard and waits picking up. At 120 tons the goods is within the limits prescribed for running up the hill without a banker which will enable the pilot to shunt the station. 149. 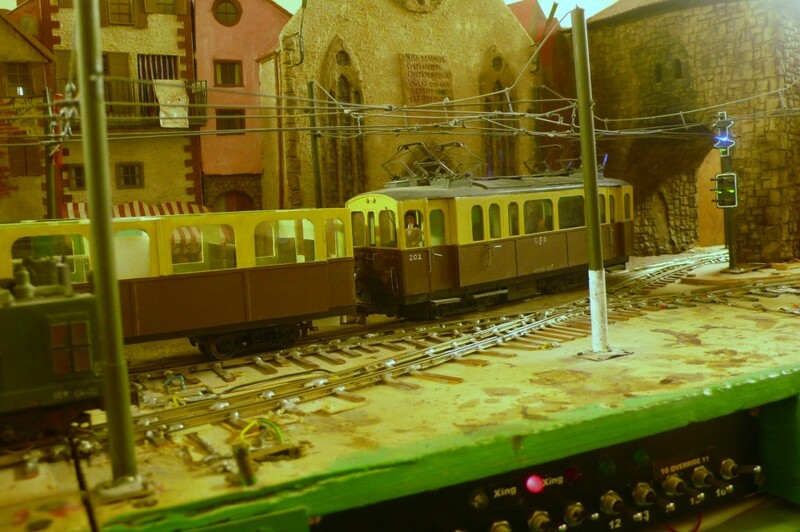 The mixto pulls into Caladonno under clear signals, where it meets the schools' railcar. This is the only crossing of the day scheduled for this short loop. As has been noted elsewhere the loop was an afterthought and serves to allow trains too long for Fenditavalat to cast off extra wagons before returning to trip them in to the city. The railcar crew will be reminded to display a tail lamp before leaving! 150. 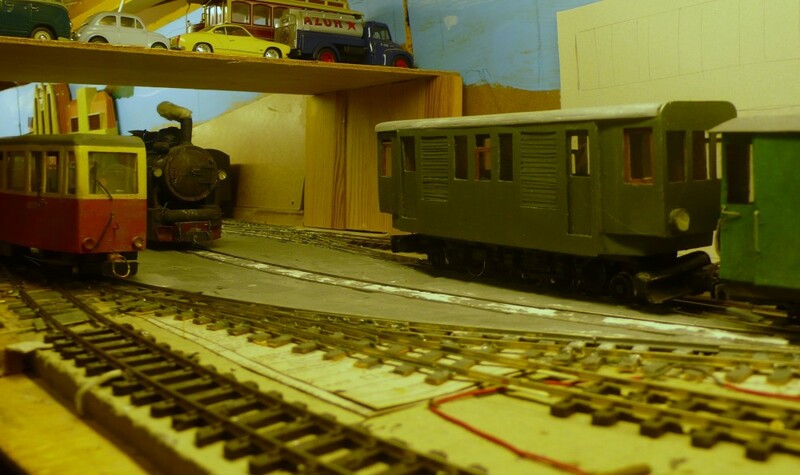 The connecting electric railcar has run onto the loop and waits to attach to the trailer. It has pulled onto the non electrified road and could possibly reach the trailer if it dropped its front set of pans, although I am not sure whether this was technically possible. It seems unlikely that this would have happened, although I suppose that it could have dropped all four pans and run on battery power. The CFS eschews all this palaver and lets the trailer coast onto the train by gravity as was done at stations such as Eyemouth and Amlwch on the British SG. This used to be the CFS school's train but given the time taken to cross the town the pupils now have a special service from "Rivanorda"
151. The crew of the up KTT goods is earning its corn at Boursson, in contrast to its easy ride at Breĉo de Glissent (photos 134/135). There is, by now, absolutely no blocking of wagons and the necessity to avoid passenger trains has not helped either. As a result it has taken the better part of an hour and a half to shunt the cannery and there is still the Co-op and the goods shed to shunt. The crew will take a breather shortly to let the schools'/commuter railcar pass and will then continue their work. 152. 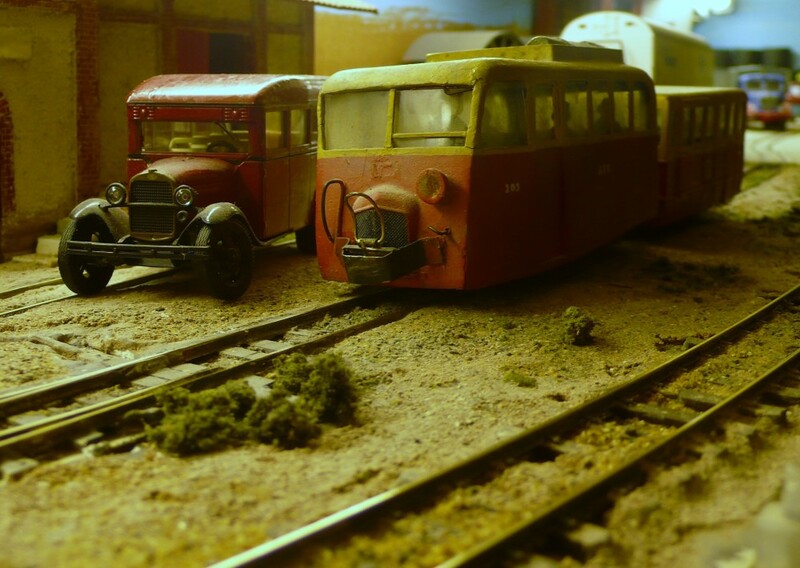 The evening commuter railcars are being readied at Lacono. 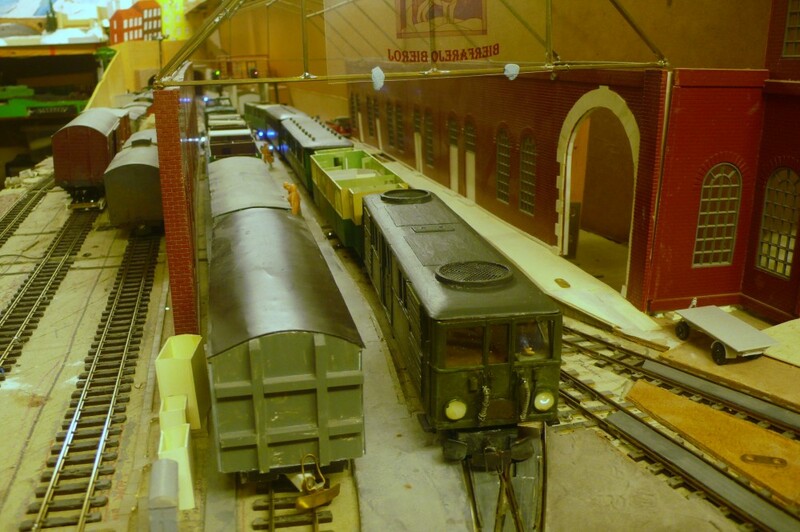 The train which will run across the Kasatritikakamparoj backs down from the shed. 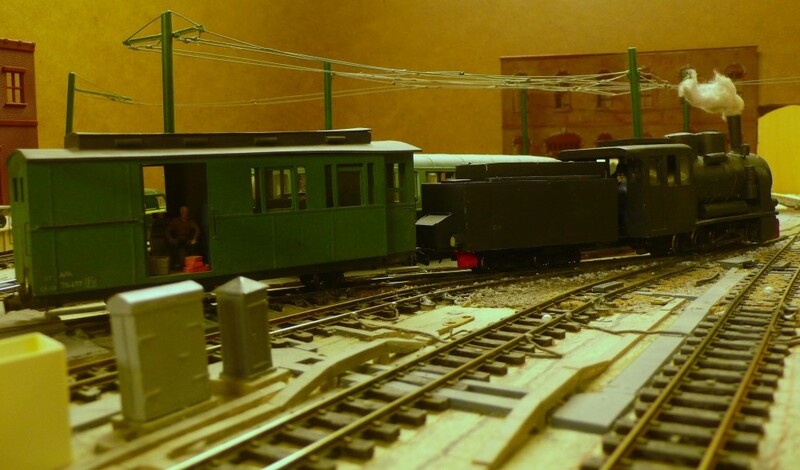 With his view obscured by the carriages the driver has to leave the cab of the railcar to observe the signal aspect before continuing his propelling movement into the platform. The six wheelers are based on GNSR designs. 154. The Urteno commuter run makes its stop at Ghealdaban. Once again this has become a dumping ground for debris from various projects. I suppose that this ought to act as an incentive to landscape the area. It is common practice to stop trains here as the electrics have been wired in such a way that this section can be transferred between Lacono and Urteno on the local circuits rather than using "through running" controller, which can also be used if needed. 155. 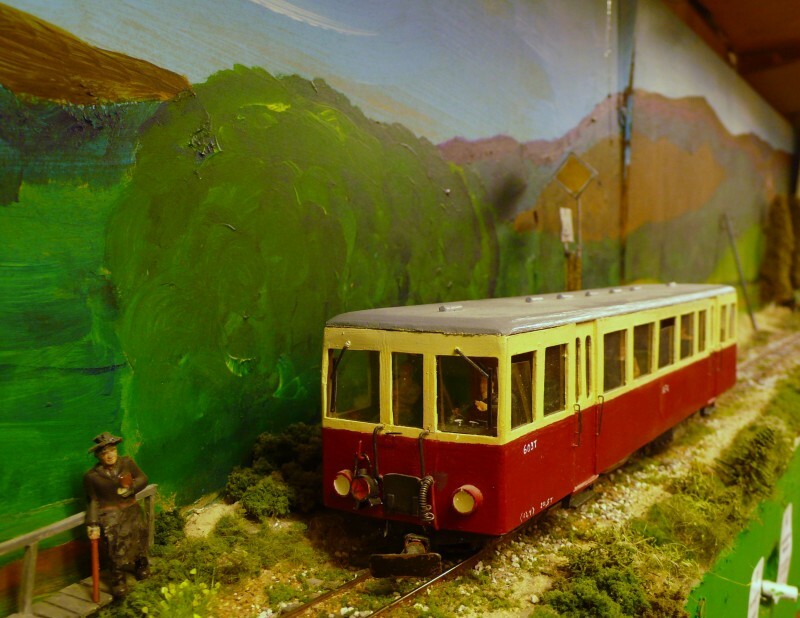 The railcar has arrived at Urteno to disgorge schoolchildren and commuters. It will run through to Varden this evening but the Post van will be detached for loading and unloading. A great deal of mail is generated by correspondence between the various University faculties and this particular diagram is important for the functioning of this institution. Behind the train stands 160t of logging products awaiting forwarding. This is pencilled in to run as a special but the loco, No 818, the 0-8-0, is currently held up shunting at Boursson (photo 151) so it may be some time before this traffic is forwarded. 156. The mixto (train 4213) has arrived on time at Fenditavalat at 16.41, as shown by the clock on the Antaŭpordo gate tower. 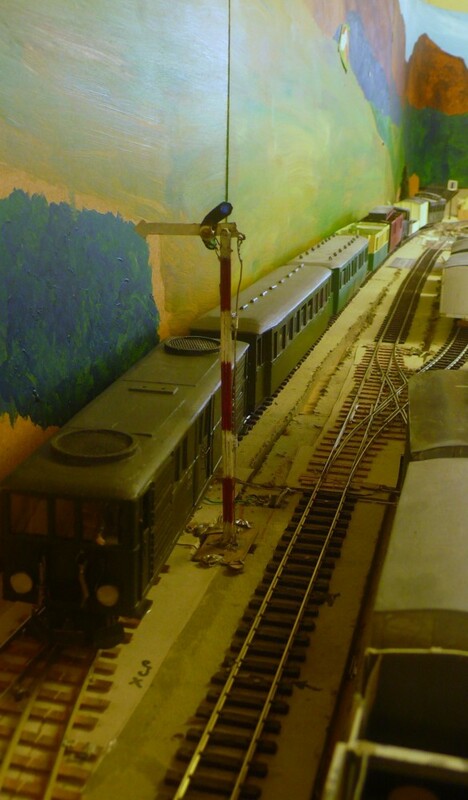 There is very little clearance between the loco and the tower because it is necessary to pull up to the end of the track to leave clearance behind the train. Once again this is a symbol of having crammed too much into too small a space. 157. The moves in the Basabazaro have to be carefully choreographed. The shunter will pull forward with the two vans to remove the vans at the rear of the train. These will then be shunted into the dairy. 158. Once this has been done the CFS railcar can depart for Rivabordo before reversing to Orbonoraklifo.. This is the last through working for Krelm and it gives connections to Strelsau in Ruritania, reached at 06.15 tomorrow. The pans are well short of the wires because the springs have been removed as they were too strong and they catch on the wiring in any case. The red light on the control panel is nowadays superfluous and seemingly comes on at random! I suppose that I should remove it, or remind myself of what it indicates, but it causes no harm so it is left as it is. 159. The down working has been reformed by the train loco and stands ready to leave as train 4124 at 17.30. The vans are at the back of the train because, as noted in photo 136, the slide wall van has to be detached at Lacono. The train is on a tight timing to connect with the last FT train to Sarip, the capital and Nilam the country's second city which is one reason why the moves in the Square have to be carried out efficiently. There are only about ten minutes to spare. There are scurrilous rumours that the names of the major cites and provinces of Thalnia, outside Marronĝacco province, are simply anagrams of European countries and major cities! 160. 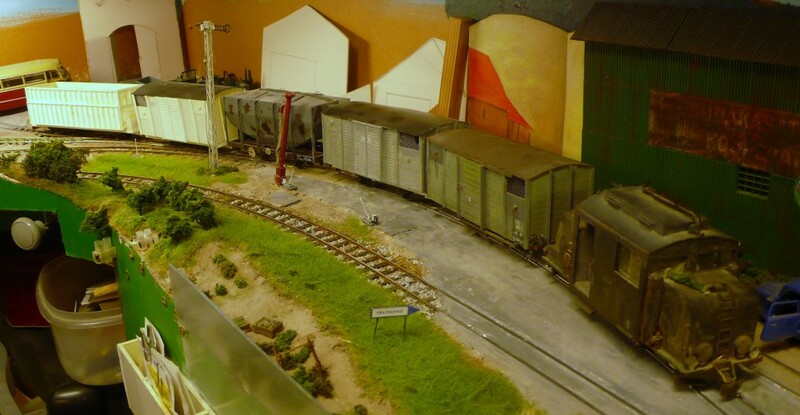 As the shunter pulls the newly loaded SG wagons from the goods shed the motive power appears for the local goods train standing in the near road. Normally the crew are eager to get away early but because of the difficulties faced at Boursson today they will wait for a right time departure. The vertically challenged floodlight pylon is stuck down with "Blu-tac" hence its wandering around in this set of photos. It, and its yet to be built partner, will eventually be set onto fixed bases but the Blu-tac will remain so that they can easily be removed for access. Hopefully this will also save them from too much damage when they inevitably get knocked. 161. 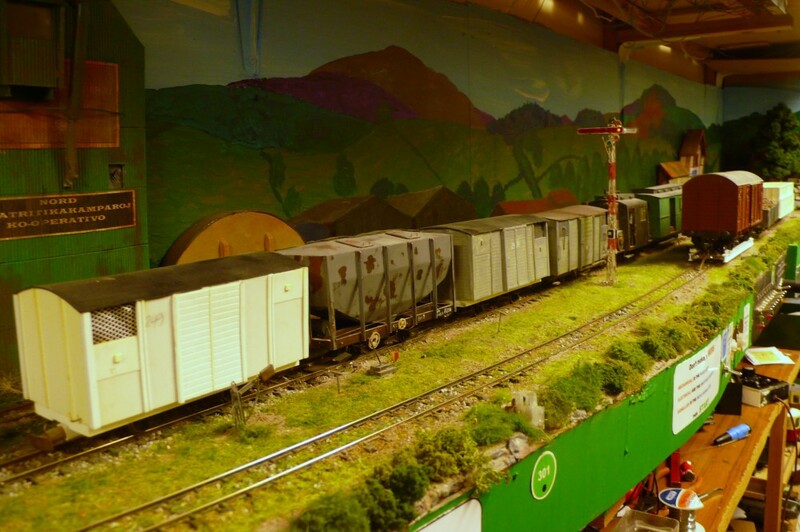 The schools' railcar across the Altingablecaŭtoj is held at Ithilarak's ES today because the down freight is too long to allow it to pull in behind it. There will be a slight wait before it reaches the platforms and the kids depart. The signals are simply clipped in place at the moment and have been disconnected. There is no calling on provision in any case but this is normally circumvented by the driver using the (currently unmodelled) phone to ask for permission to pass it at danger. 162. The up local goods crosses the down local goods at Boursson at 17.45, slightly before the booked time. The up train is loaded to the capacity of the 0-8-0 and cannot fit into the loop. The down train has been stopped at the ES and has then proceeded slowly into the loop ready to stop on sight. The SG van has been picked up to simplify shunting and save time. There will be a use for it at either Lacono or Urteno and there is already one van in the canning factory. 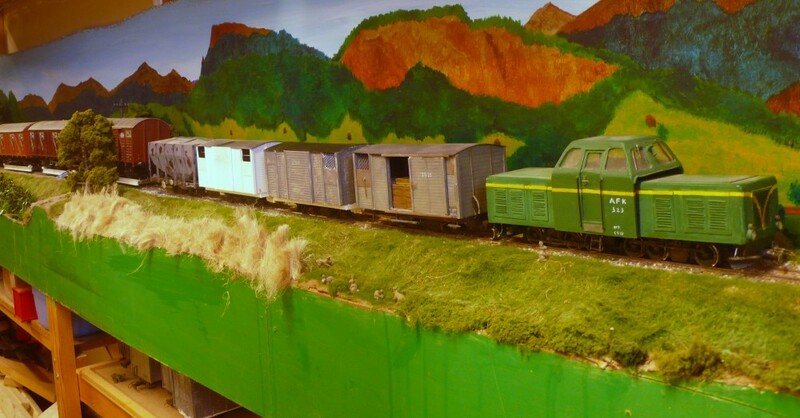 The loading would not have been possible with the loco originally booked to work the train (the 2-6-2 diesel) as it would have exceeded its capacity. 163. 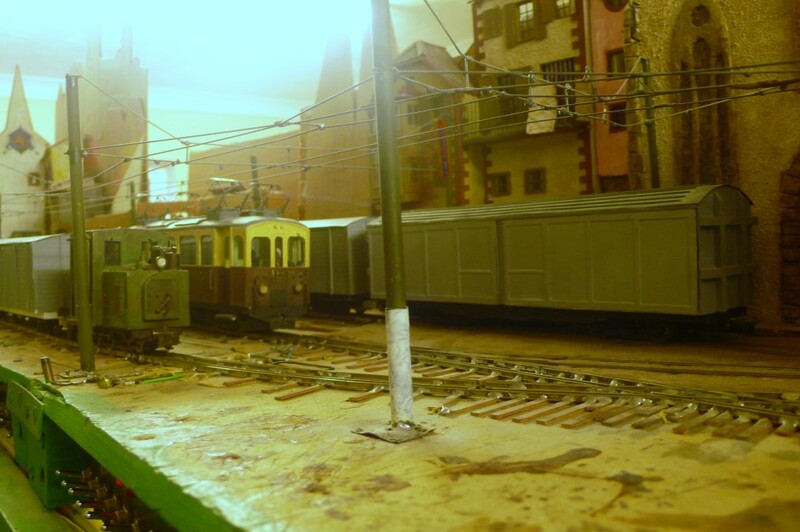 The 0-10-0T begins to sort out the wagons in the sidings at Urteno. Most of these are bound for the ferry to Karamspur but one has to be cut out as it contains beer for Eromarbordo. The reach wagon also has to be correctly positioned so that wagons can be pulled off the ferry and pushed onto it without delays. 164. 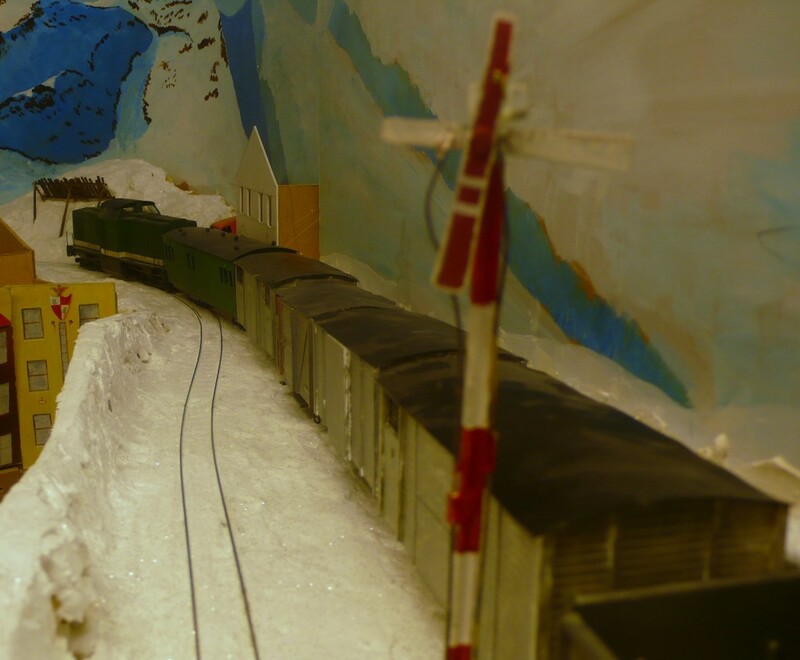 The shunting causes the FDV-RFK goods to be held at the outer signal and it arrives slightly behind time. This train is allowed 60 minutes to work at Urteno but it rarely needs this and often runs early to Lacono. There are only two vans to be detached here and they are on the tail so the slight delay will be of no consequence. 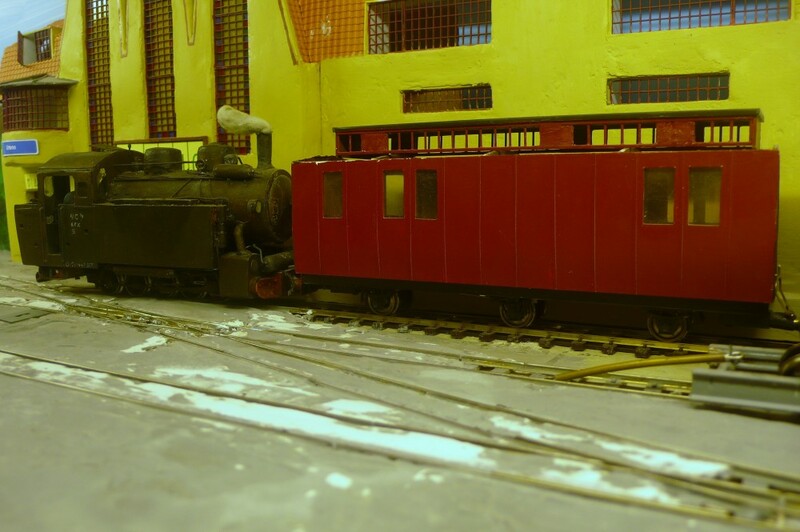 The van next to the 0-10-0T is one with opening doors which has been finished as an empty van. It has been swapped with the nearest van on the next siding as this is carrying beer. The consignment notes have also been crossed over so that they are now correctly loaded. 165. The schools' railcar has helped with the shunting of the up goods at Ithilarak and is now ready to depart on time at 18.00. Those with long memories will recall that this train is notorious for running late once the children have detrained and it was shown running over three hours late in session 2 photo 150! On a slightly different note I observe that the retaining wall behind the signal seems to have gone missing. It was there at one stage but only as a piece of hardboard. 166. 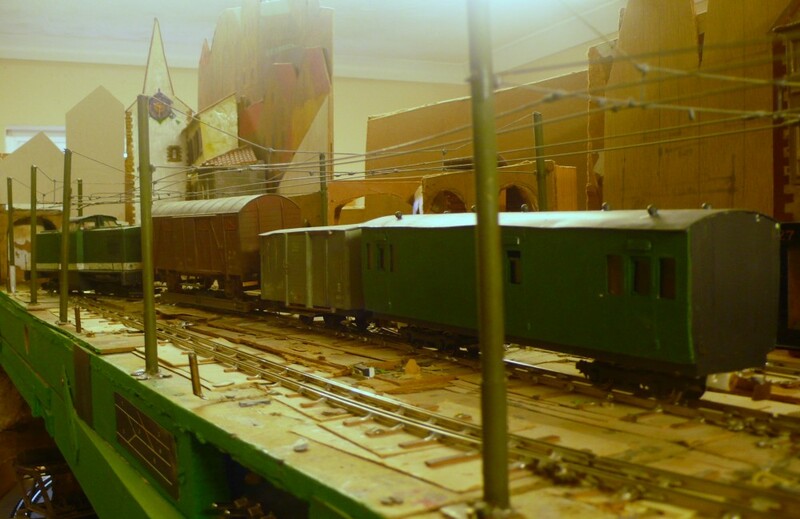 With the mixto having left Fenditavalat there is now time to bring a couple of wagons up from Rivabordo to push into the blanket factory under the archway behind the first wagon. 167. Sporting a somewhat disreputable finish the I-Co-Co-I waits at Relforka with the substitute train for the up evening railcar. The ambulance is just visible, coupled behind it. This is the last leg of its diagram. The down commuter and schools' railcar is pulling in on time at the right. The up railcar, which can often be held for some time waiting its connection will leave slightly behind time today. 168. The down mixto pulls into Ithilarak's PFT. The gradient over the viaduct is clearly visible in this shot. There was also a rock face which fitted above the tunnel but that seems to have gone walkabout as well. 169. The waiting up goods wastes no time in getting away once the mixto has pulled in. By this stage in its journey it is down to three vehicles. all bound for Fenditavalat. 170. The arrival of the heavily loaded up KTT goods and the early running FDV-RFK train have caused problems for the miniscule yard at Lacono. For most of the day, once the morning rush was sorted out, the yard has been very quiet but now it is full again. The down train has been run into the passenger platforms, having been held outside the station, to allow the pilot to take the crew van into platform 2. The torch/uncoupler has inadvertantly been left lying on the layout! 171. 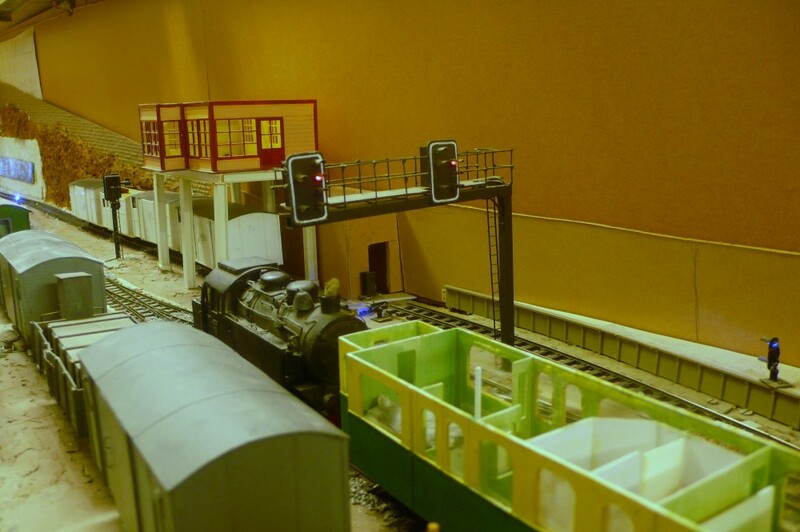 With the pilot in the clear the down train runs onto the mainline at the southern end of the station before reversing into the middle road to couple onto the two SG vans. These have been pushed down beyond the double slip to enable the pilot to reach the van in the foreground. This is the road van to be exchanged with the CFS. The goods will wait in the yard to cross the up railcar and to be overtaken by the mixto. 172. The 0-8-0 and the crew van leave to make the shortish hop to Urteno. This engine and van movement is running on the schools' railcar's path so once again that train will be delayed. The sharpness of the curve at the northern end of the station is all too apparent. 173. 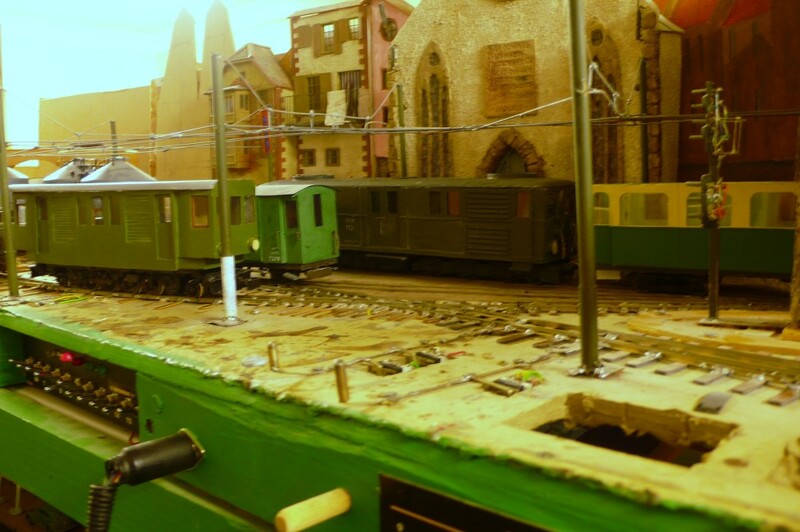 The railcar has reached Urteno slightly behind time, because the shunting of wagons ready for the ferry's arrival took precedence. 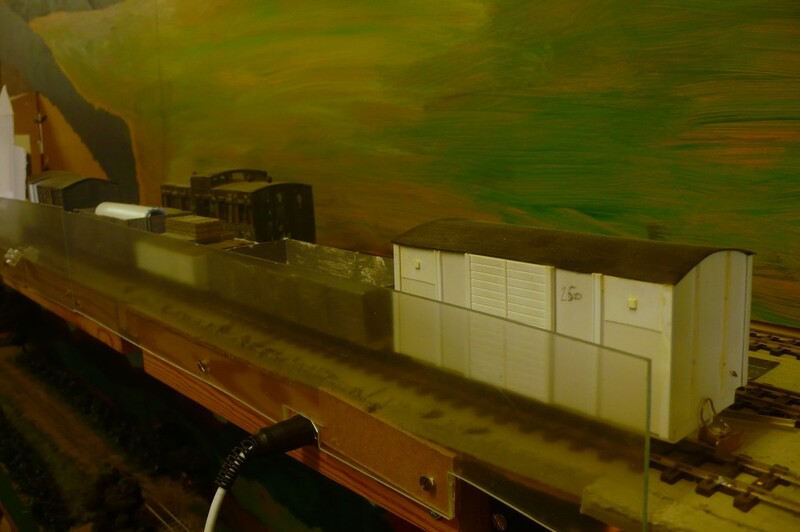 Its further progress will be restricted in any case and it will probably have to run into the woodyard sidings to allow the light engine to come into the station. The mixto is also descending the Vulpafaŭkangulo by now as well. 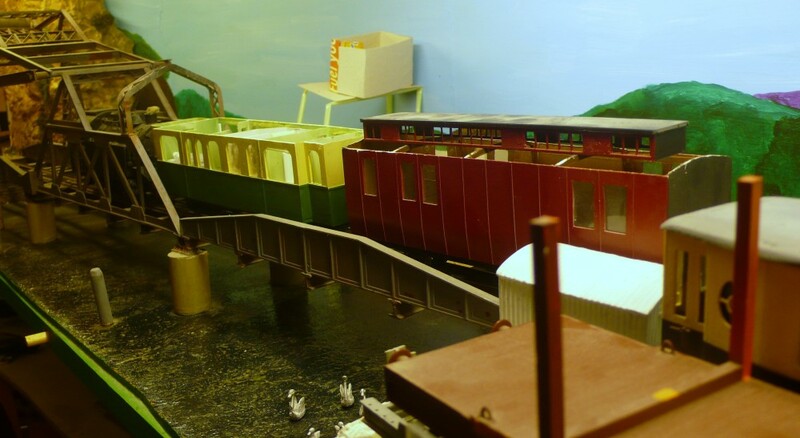 Any passengers wishing to catch this service will be directed towards the mixto and the railcar will then run ecs, forwarding any Lacono loads that come off the ferry. 174. The mixto has arrived at Urteno. To say that the station was congested would be an understatement! 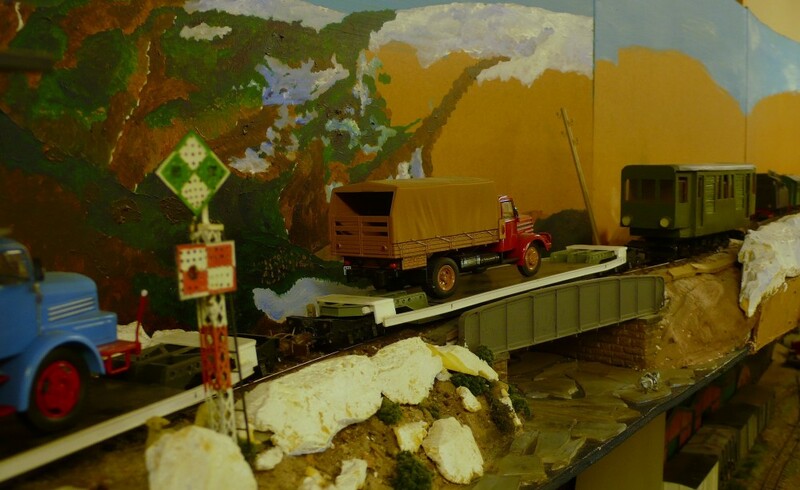 The mixto stands on the inner track whilst the pilot and the cut of wagons due to go to the ferry stand in the middle road. 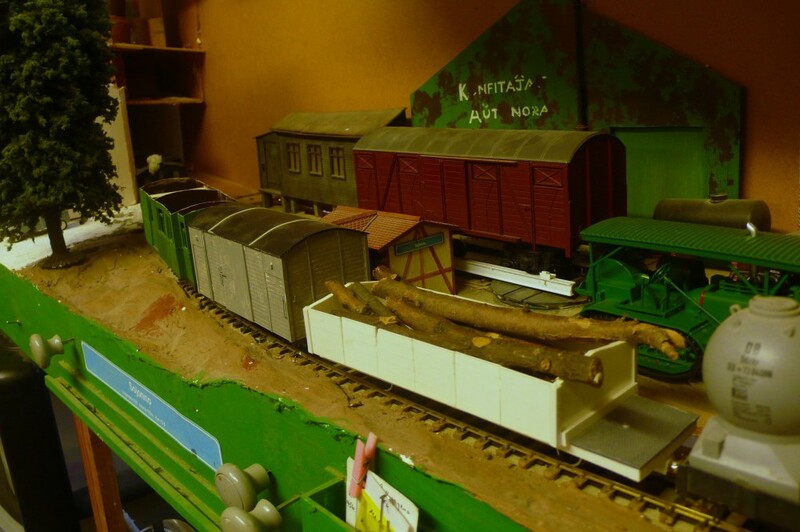 The train of forestry products stands on the far road, waiting to transfer the brake to the correct position, whilst the railcar stands in the sidings. A little legerdemain has been called for to squeeze the mixto past the other traffic but this is the price that has to be paid to operate intensively on such restricted station layouts. 175. The up "railcar" pauses at Boursson where it crosses the KTT goods. The railcar was checked by the distant being "on" as it approached but by now the goods loco is in the clear. 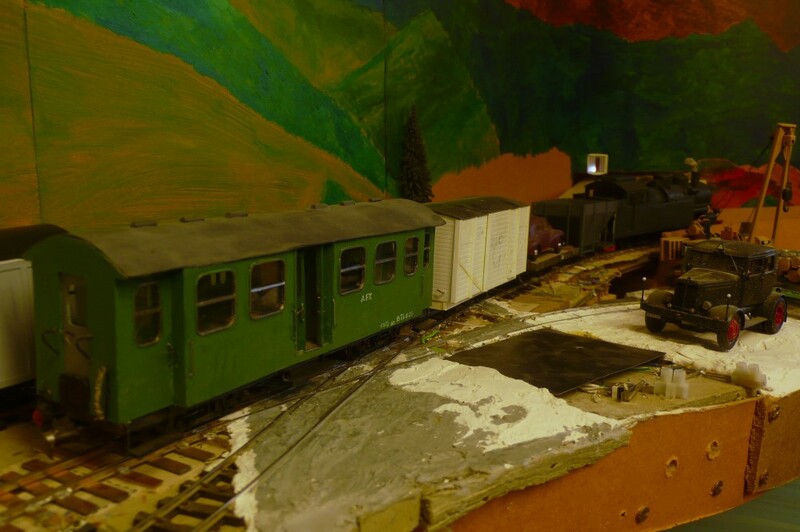 It is on the wrong end of the train at the moment but all the set outs and pick ups have been made and the van for Sojonno is correctly positioned so it should recover time once it departs the intermediate halt, unless there is a glut of traffic. 176. 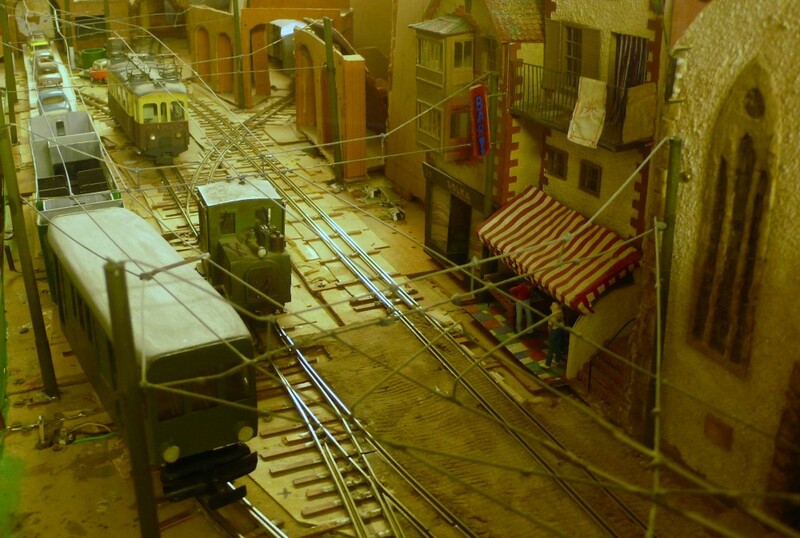 The Eromarbordo goods has arrived at Breĉo de Glissent where it will run round its train before departing for Relforka. The van behind the loco is the one with opening doors that is loaded with fish boxes. The hopper will be cut out before departure. 177. 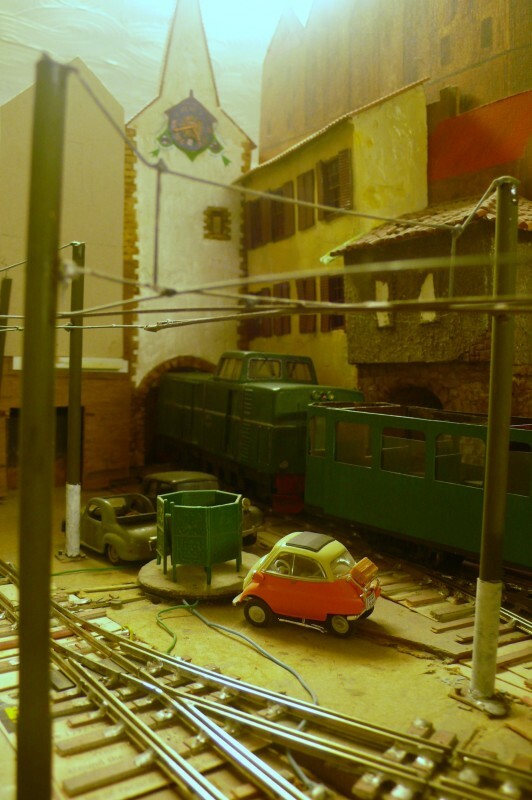 The mixto, at the left, and the up railcar cross at Lacono Cittavecchia. On this occasion they have reversed their normal platforms. 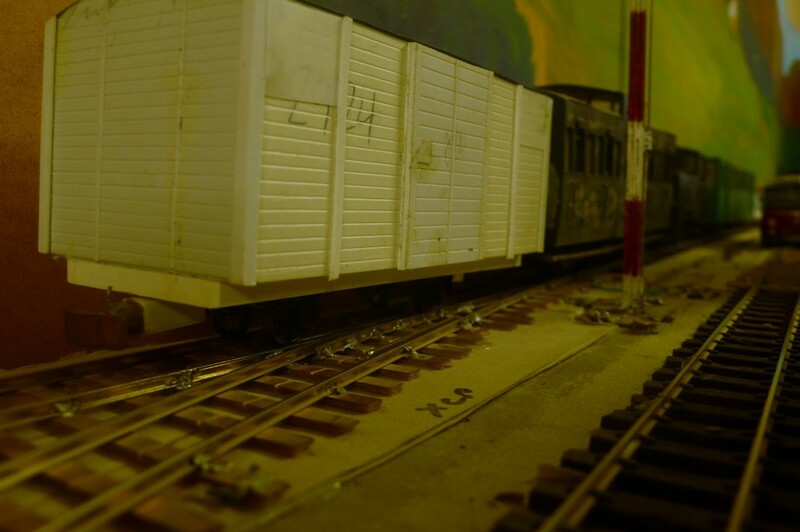 The mixto makes a brief stop to detach the rear van and, even as it runs in, the signals are "off" to enable a quick departure. 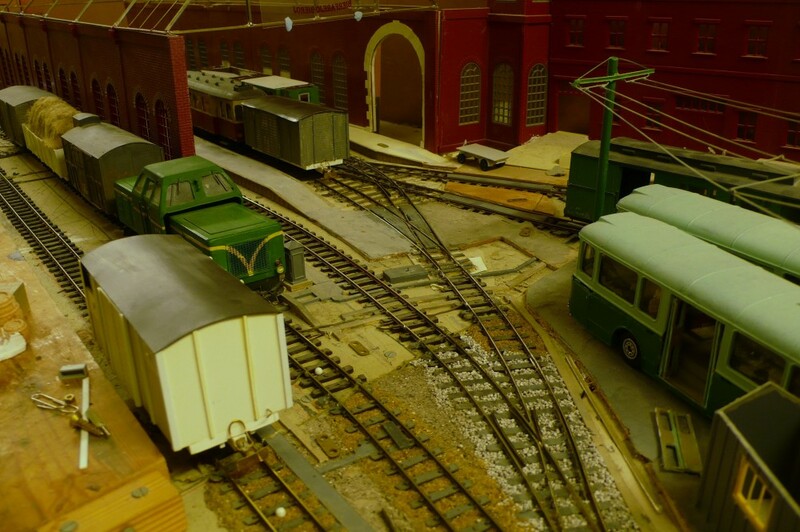 The green over yellow aspect is just visible in the bottom left hand corner of the trainshed front. In defence to its increased length and the need for the mixto's prompt departure shunting of the "railcar's" trailing vehicles has been delayed and so it will depart late. 178. With time pressing the loco for the lorry train runs around in the square at Fenditavalat. 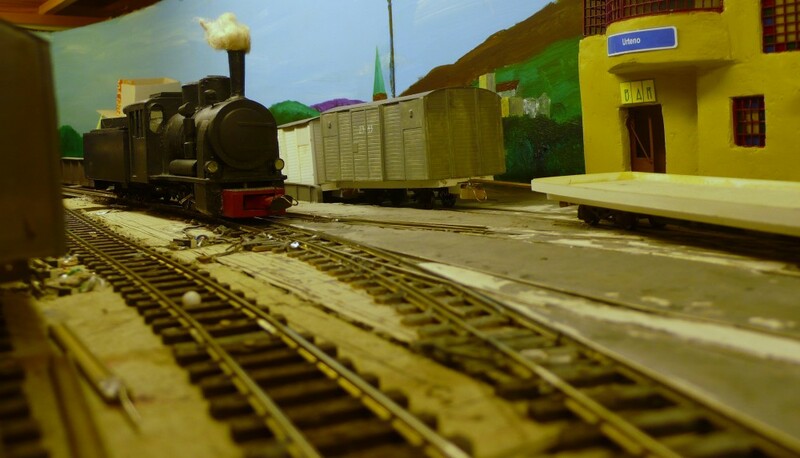 The shunter has pushed its wagons into the blanket factory and stands clear of the run round loop, although it is blocking the main. 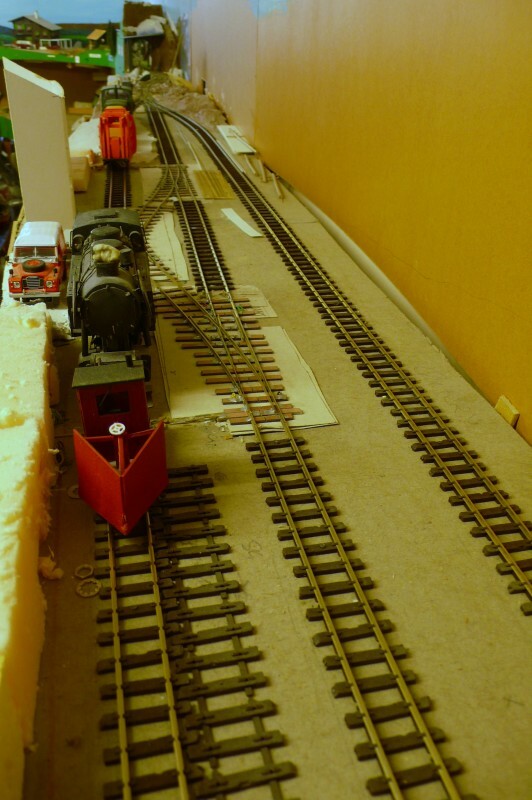 This was not an anticipated move when the layout was built and it has never been needed before so I was pleasantly surprised when no electrical problems were encountered. 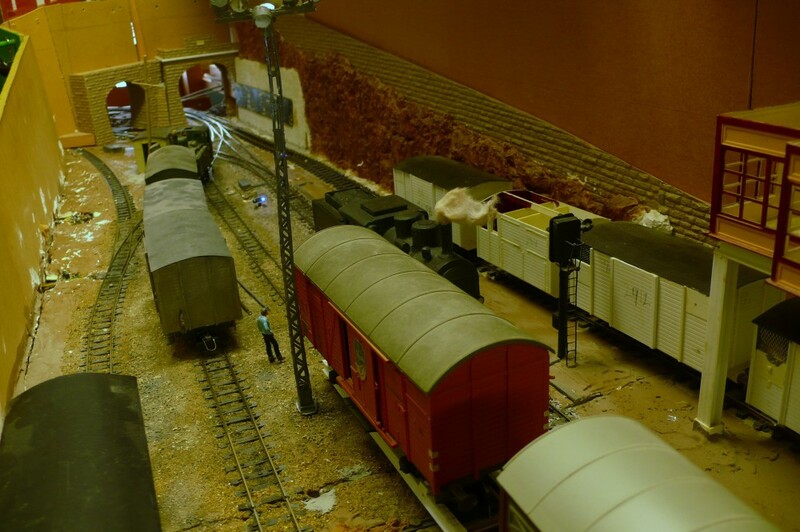 The lorries on the well wagons have been swapped for others standing around the layout to ring the changes. Also visible is a chock under the wheels to stop them rolling on the flat beds as this has caused problems previously. Unfortunately these lorries are larger than the ones that they replaced so there were issues with clearances. The one in the picture belted the signal at Caladonno as it passed and the other one stuck in the tunnel at Ospicio. This is something else that will have to be considered in future. 179. The RFK-FDV goods stands in the PFT at Ospicio whilst the lorry train runs through after restarting. It was held to allow the goods an unhindered entry. The dice throw chances for the possibility of snow will probably be altered after this session as the ploughs seem to stand idle too much during the day time. 180. The LAC-RFK goods has reached Sojonno a dozen minutes late. The SG van full of jam needs removing and the first van, containing sugar, needs to be left behind. This will probably take the train's full time allocation leading to control having to make a decision about whether to run the RFK-URT goods currently standing at Relforka. This is the train that distributes empty wagons around the lower part of the system. It generally runs to a full load and it will not be possible to pass the three trains at Glissent. 182. A similar photo taken fifteen or so minutes later shows that the shunter has attached the inbound wagons to the outbound ones so that it can push them onto the ferry. 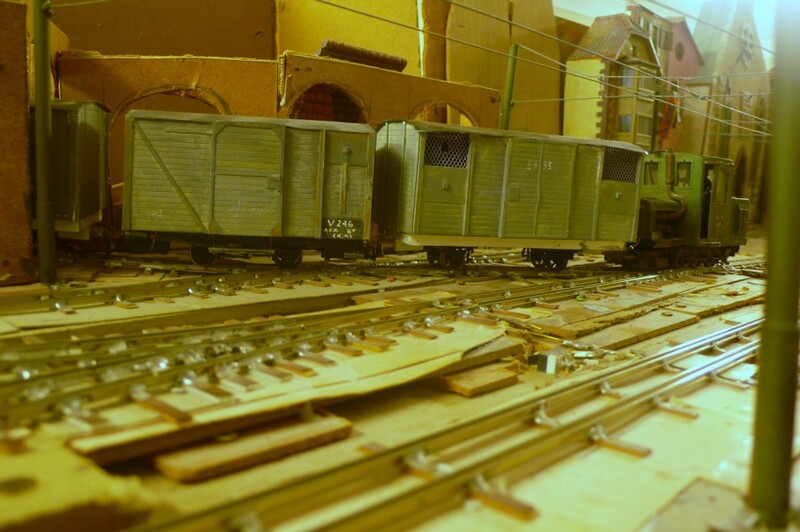 The poles on the reach wagon have been disconnected as the inbound wagons will act as a 'handle'. 183. By now the railway bus waits for its passage on the ferry and the road ambulances have started to arrive to pick up patients from the railway ambulance. 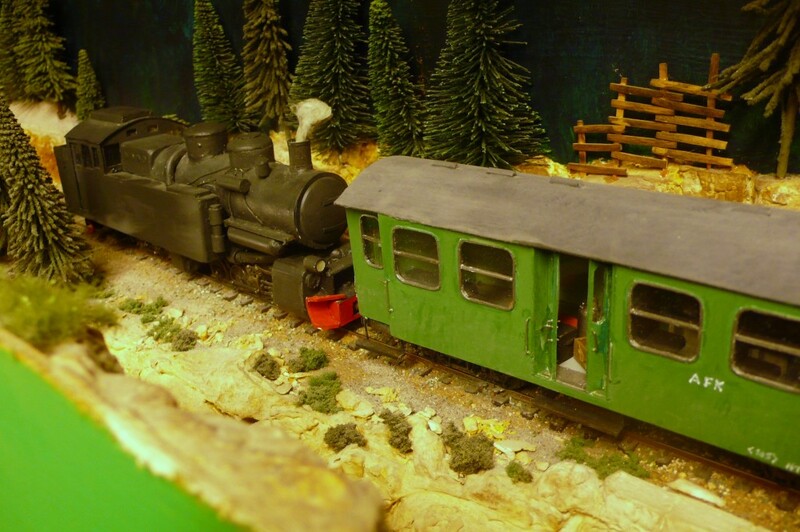 The 0-8-0 is now on the downside of the brake and will soon be ready to leave. 184. 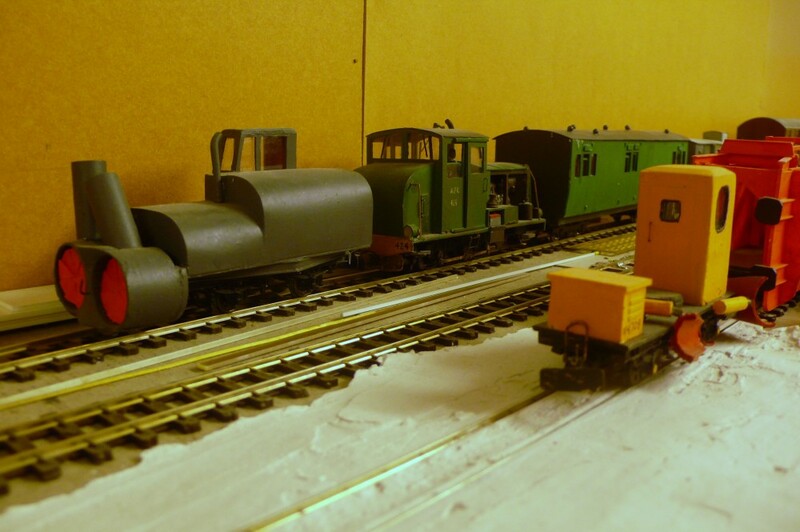 The railcar has adopted its usual role of subsidiary shunter and is about to take the two vans left by the through freight (photo 164) to the coal sidings. To be honest I suppose that this railcar, and its morning balancing working, should really be shown in the public timetable as originating and terminating at Ithilarak. Given the AFK's policy of carrying passenger accommodation on all trains they could then continue to run with the usual caveat emptor disclaimer. The time is 19.50 but the Fenditavalat bound railcar is running 30 minutes late. This delay will hopefully allow things to be sorted out before its appearance at Urteno. 185. The late evening RFK-URT goods stands in the platforms at Relforka, ready to leave. Rather unusually this is not totally formed of SG vehicles because there is a shortage of equipment at Boursson, which will be addressed by dropping NG wagons from this train. In addition the first van has been transferred from the Eromarbordo goods as it is full of fish bound for Lacono. The transfer has put the goods 10 minutes behind schedule. Control has a decision to make. Is this train let out late, running against the mixto, or is it held to ensure a clear run for the mixto? The Narnian railways, rather like their Thalnian counterparts, are not noted for their speed or promptness and three times out of four the FT train that the mixto connects into is late. Feeling lucky? Do you twist or do you stick?! 186. Meanwhile the problems at Urteno need watching. From my experience of dealing with Control this is where their attention would be resolutely fixed and the rest of the AFK could go to hell! The wagons have been pushed to the very front of the ferry to allow the bus to board. Whether this would keep it in trim is open to debate. 187. The banker/pilot, having deposited the Karamspur vehicles onto the ferry, couples onto the Post van which has unloaded the missives to the Urteno campus from Lacono and has reloaded with communications between the Urteno and Fenditavalat campi (campuses?). Some sacks between Lacono and the stations north of Urteno also remain on board. 188. 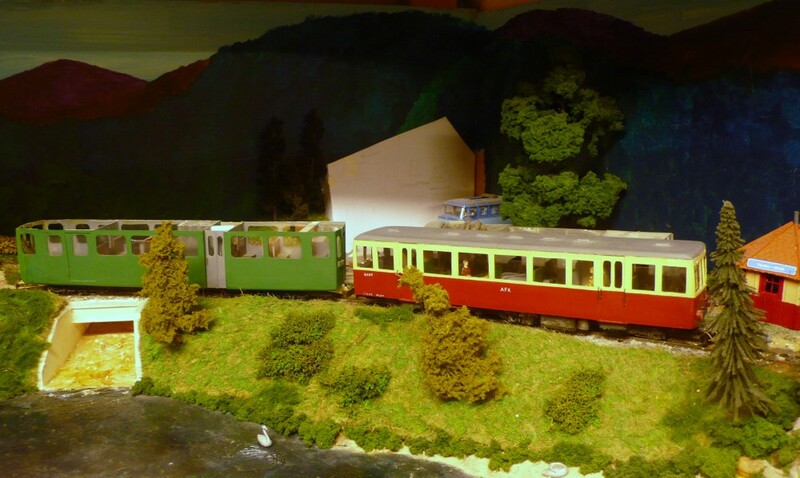 The RFK-FDV train pulls into Urteno. 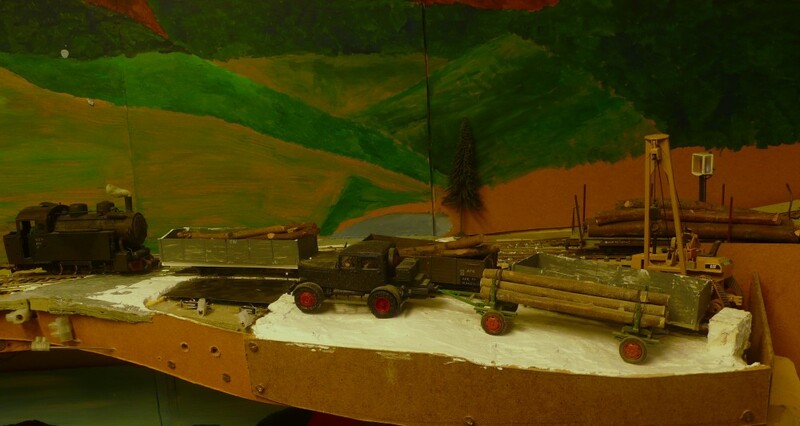 The log train still stands in the far loop and the middle road is full of wagons removed from the ferry. The near loop is the only road available to the passenger. 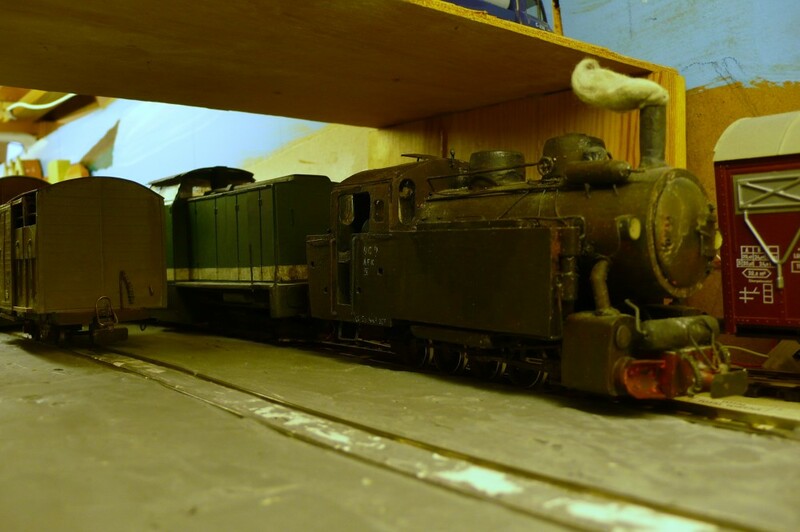 The 0-8-0 is currently standing in the wood sidings to provide clearance and., along with the railcar, it will have to deal with the aftermath of the problems once the train has left. 189. The local goods runs across the valley bottom around ten minutes behind time. This will delay the up goods which will then impact upon the mixto. As an aside, the long wheelbase wagon behind the SG van has behaved itself perfectly well in contrast to its sister (photo 91). The criteria for successful scratchbuilding are obviously very fine margins. 190. Running roughly a dozen minutes behind time the up goods crosses the Kasatritikakamaparoj. Even at this late stage in proceedings it is not clear whether the gamble to let this train out, guaranteeing a delay to the mixto, will pay dividends. The AFK "rules" forbid crystal ball gazing and the punctuality of the connecting service only becomes apparent around 20.00 (when the die is cast). These close calls were part of everyday life on the real thing. When you got it right nothing was said, not even, "Thanks mate". On the few occasions that you got it wrong, boy, did you hear about it! 191. Having been tipped the wink by Glissent, the mixto moves along the short loop at Boursson because the freight is too long to fit into the loop. Once this has cleared the south end, and the signal has clattered to the near vertical 'clear' aspect the mixto wastes no time getting onto the move. 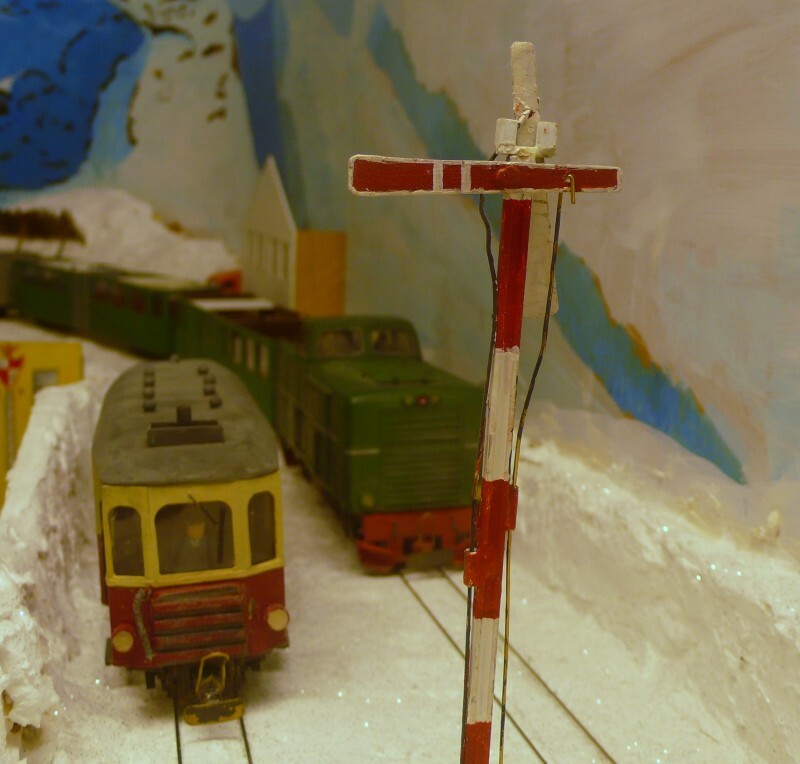 As it happens the crew and AFK Control need not have worried because Nerv FT Control have rung through to say that the connecting train from Beruna in Narnia is running 15 minutes late. (This was divined from the dice throw.) Nerv is the FT junction between the Ruritanian and Narnian lines and oversees all SG running in the province whilst liasing with the neighbouring countries' railways. 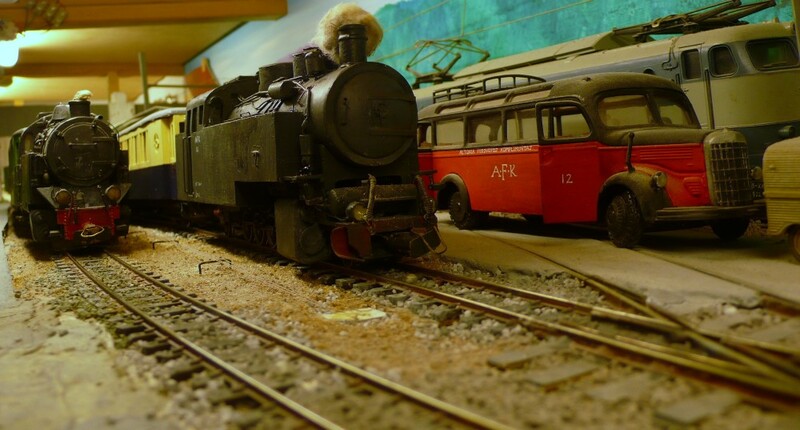 The standard practice, in any case, is to hold the SG train at Relforka for the AFK connection, although the AFK management try to avoid the opprobrium that follows this necessity. A large number of Provincial functionaries and politicians use the mixto to connect into the sleepers added at Gascari (the border station) to reach Sarip on the following morning. The FT HQ would never hear the end of it if these connections were missed! 192. 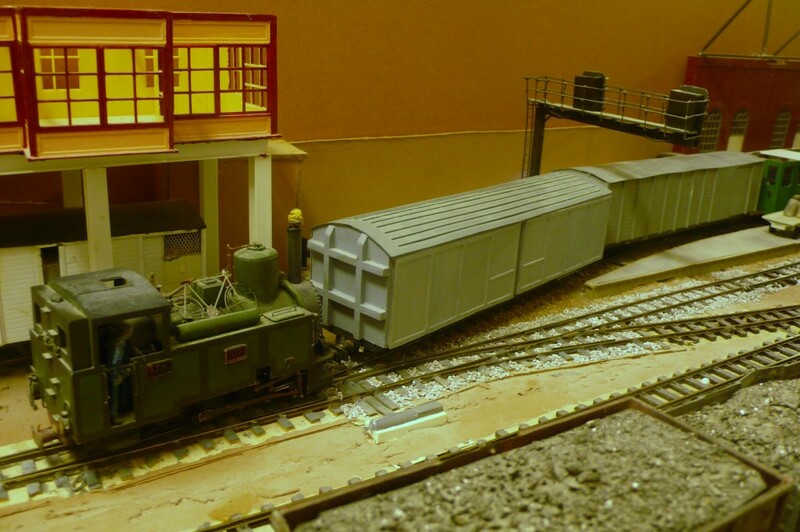 The RFK-URT freight is not booked to shunt at Boursson but on this occasion it drops off a hopper and van at the Co-op. As it was already running behind time a decision was made to let the FDV-RFK train out of Lacono early. 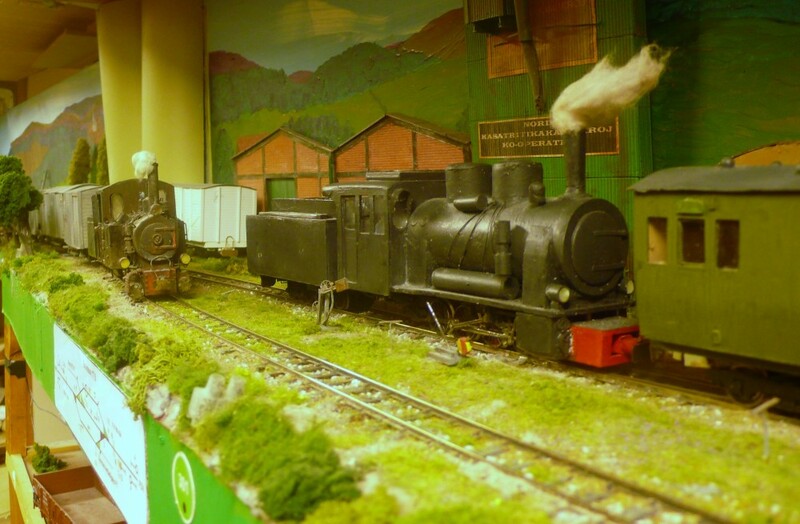 This was held at the ES before running through the station to pass the late running train. Running the down train early provides a path for the late running train and avoids any conflicting timings. As I have observed before, freight train timetables are regarded as advisory by the AFK, much as they often were on the real railway. 193. As the evening draws in snow is falling over the high passes of the Marronĝaco Massif and it is necessary to plough the route between Cadsuiane and Calodonno. 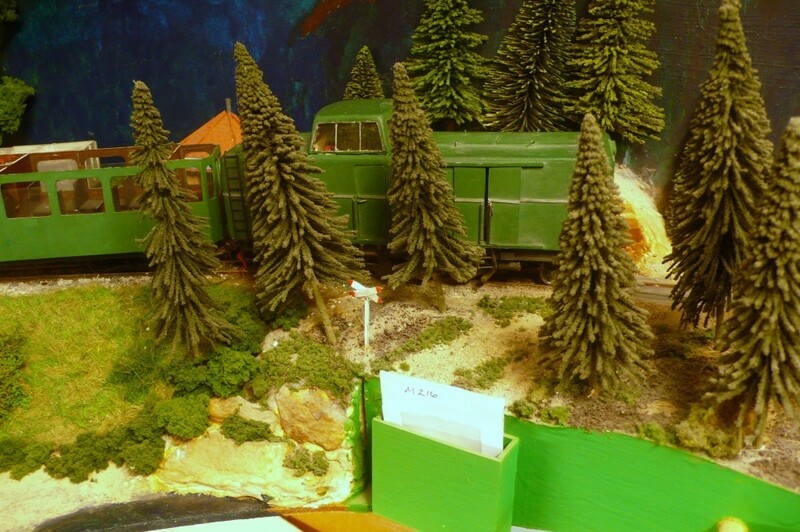 The plough has been coupled to the front of the RFK-FDV freight for the run down the north side of the Hecaraxë pass. Here it has been uncoupled to allow the plough to run into the loop. I am considering altering the profile of the watermill, which has remained untouched throughout the session despite good intentions, so that it does not obscure the (eye level) view of the line on the shelf above the village. 194. Apologies for the indistinct nature of this image, although it does give an impression of mist. With the plough safely out of the way the big Mallet runs along the mainline. Any snow drifts in its path on the lower section of line will be capably dealt with by its own ploughs. The 2-8-2T will be relieved by a diesel and the blade plough will be replaced by the large rotary once the assemblage reaches Fenditavalat. 195. 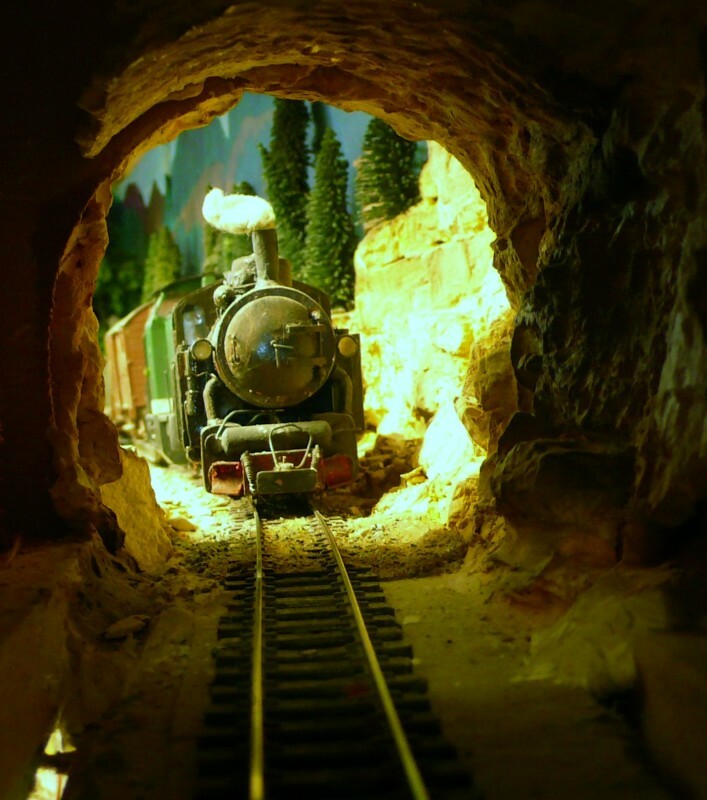 The last train of the day climbs the Aepto Gorge in the darkness. As was noted in the last session this is a remote stretch of line far from any habitation. 196. 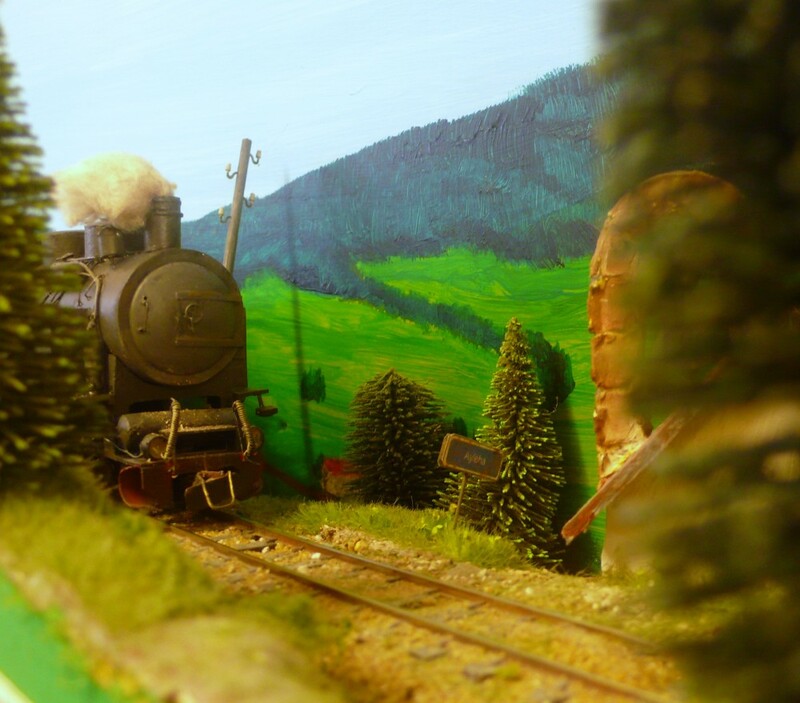 It is banked by the 0-10-0T shoving on the rear of the train, which is over the weight limit that the train locomotive is allowed to take over the Vulpafaŭkangulo unassisted. The train is running around twenty minutes late, which compared to previous performances noted in the archived sessions, is reasonably punctual! There will be a slight delay at Ithilarak to allow the plough train operating on the south side of the Helcaraxë Pass to run into the loop. I suppose that this lax time keeping is the price paid by the locals for living in a high alpine area with copious snowfall. It would be interesting to know how punctually the Rhaetian or Roslagansban trains run before the ploughs can get out to clear the lines. 197. The banker makes a quick getaway from the top of the Vulpafaŭkangulo and runs back down the hill. There will doubtlessly be plenty of work for it at Urteno. 198. The mixto overtakes the local goods at Breĉo deGlissent. The loco is on the back of the goods train having attached a van of cattle. 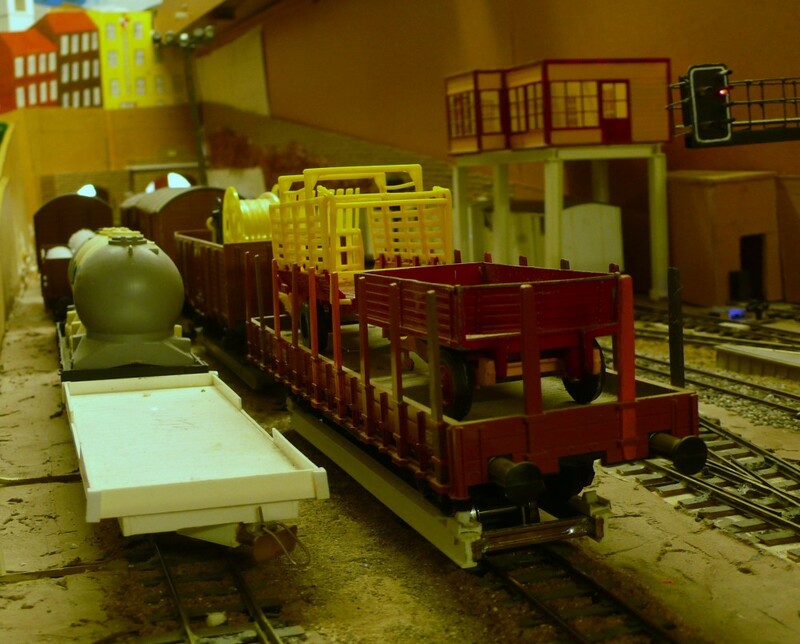 Once the mixto leaves the tarpaulined wagon will be replaced at the loading dock and the engine will run round to the front of the train. 199. The snowplough descends the south side of the Helcaraxë pass. The line has left the Orbon and Ero basins at this point and is in that of the Spelcia, which drains into Rolnth canton. The symbolic snow in front of the plough acts as a reminder that it takes an additional 5 minutes to clear each segment of the affected line. There are 4 segments on this stretch that need clearing in the current weather conditions. It will therefore take the plough 50 minutes to reach Ithilarak instead of the usual 30 for a freight train. 200. Urteno's congestion has cleared to some extent by 20.50. 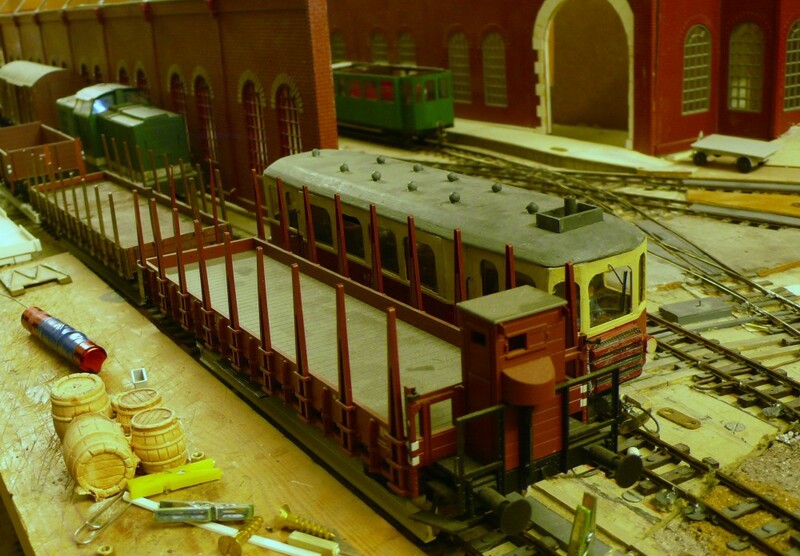 The 0-8-0 has sorted out the wagons from the ferry and placed the crew van onto the extra train. Once again thoughts are changing about this. The three loads behind the loco need to go to Relforka. If these are added to the extra this will fill it out to 220 tons, the maximum load. With the RFK-URT goods now at Lacono it would make sense for the loco to run through as booked and take this train away on the scheduled path. The 0-8-0 and van could then return to Lacono which would save the problem of finding another crew van for tomorrow's KTT goods. 201. The 0-8-8-0T has propelled its train into the goods yard at Fenditavalat before waiting for the plough to arrive. Both locos have coupled up and are proceeding down the hill to the depot at Rivaborda. 202. It is 20.40 before the Lacono pilot can begin to contemplate breaking down the long goods train brought in by the afternoon KTT goods. This was last seen in photo 170 and arrived at 18.20 but other duties have called. 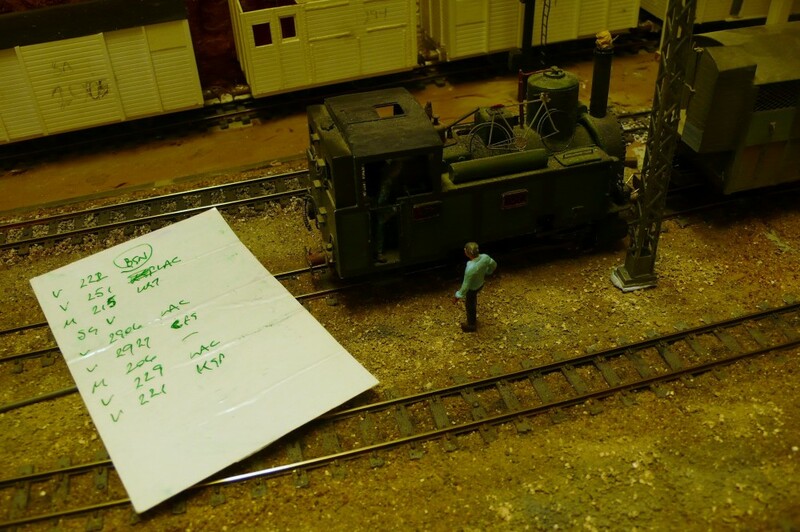 The shunter discusses the moves with the loco crew having written down the destinations of each wagon onto a sheet of paper. This is what our American cousins refer to as a switchlist, but I am sure that there was an English equivalent name (shunt list?). This is the first time that I have followed this procedure but the reasons for doing it are the same as those used on US layouts. All the wagons are listed on one sheet of paper rather than fumbling roughly a dozen consignment notes around on the edge of the layout. It seems likely that this will become a standard procedure in the future as similar ideas would have benefitted the chaos at Urteno. At one point there were twenty plus wagons to keep track of. The eagle eyed will have spotted that van 222 has been carried past Boursson and will need to be sent back. Jasmond will be on the case in the morning! 203. The small yard at Lacono is blocked and the RFK-URT goods is signalled into the station, as it often is during the late evening. 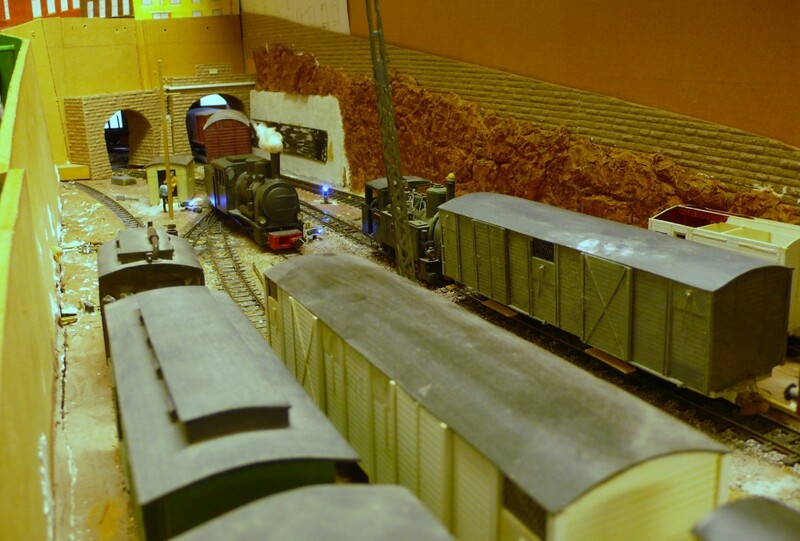 The loco can pull forward onto the mainline at the north end of the station and attach and detach wagons from there. 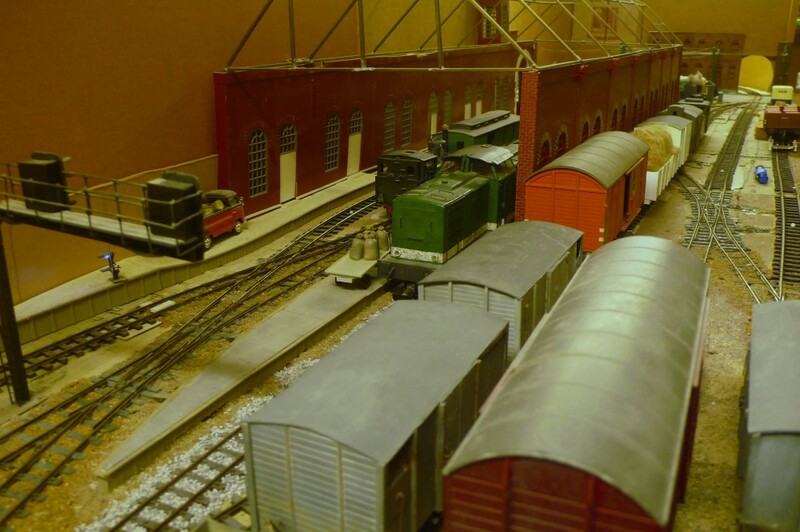 The shunting engine can then continue to work the south end of the yard without interference. 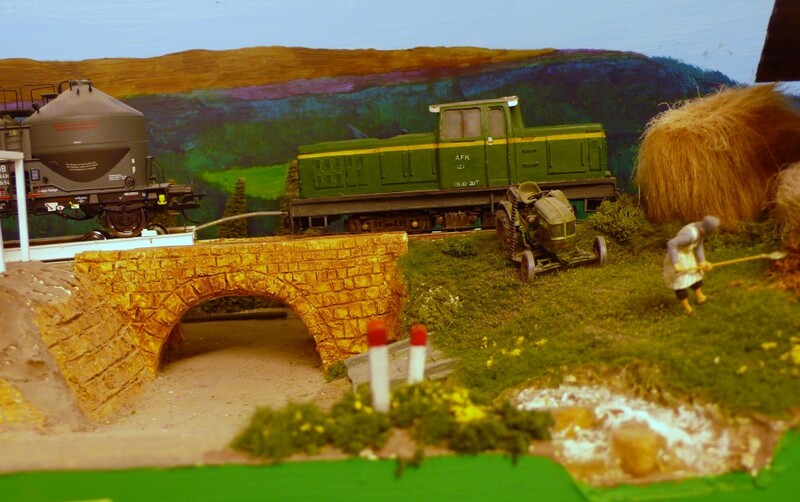 The shunter himself seems to have lost his bearings. 204. 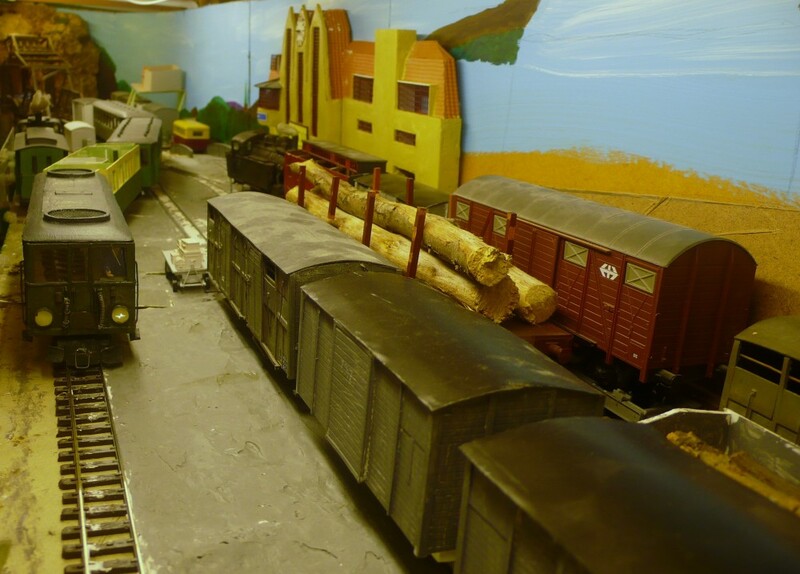 The original intention of working the log train as a special has been shelved. 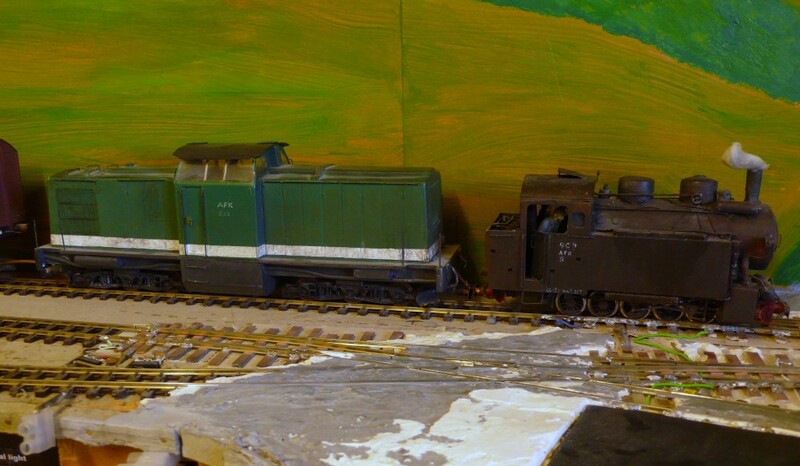 The 0-8-0 retrieves the van and will return to Lacono as 'engine and van'. Its time has not been wasted, however, because it has performed important shunting duties whilst the banker/pilot was up the hill. That loco is about to return to resume shunting duties. 205. 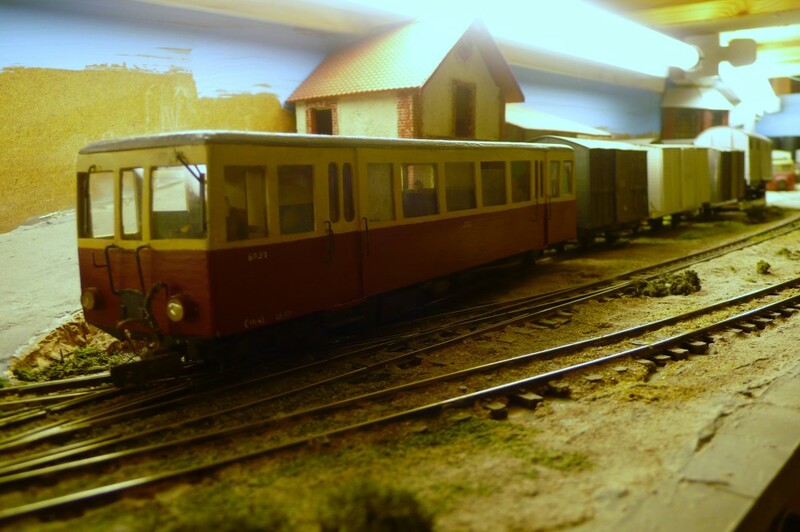 The evening railcar departure from Urteno provides the last down train of the day across the KTT. It runs to Eromarbordo rather than Relforka as there is no connecting SG train at this late stage of the day. It usually finds little custom in midweek but serves as a convenient method of transferring wagons to the coatal town. The traffic is mainly vans of beer but this one contains brand new fish boxes from Ithilarak. 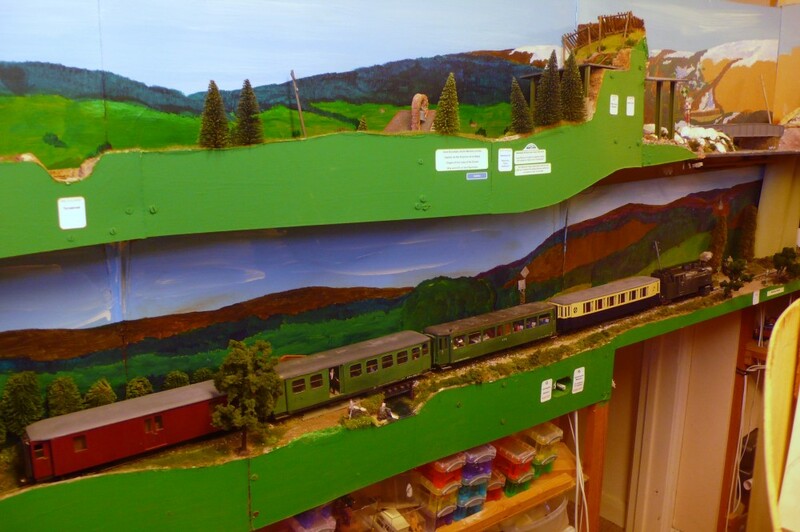 The schools' railcar, nominally running over three hours late, has been coupled onto the rear to find a path to Lacono. 206. 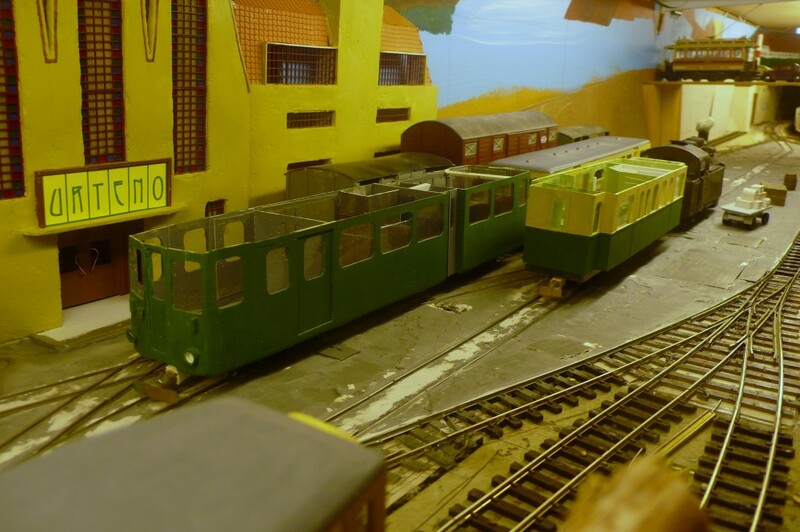 By 21.33 the two railcars have arrived at Lacono, although they were held outside the station for shunting moves. The RFK-URT goods loco is in the sidings with the vehicles that it has picked up to forward to Urteno. 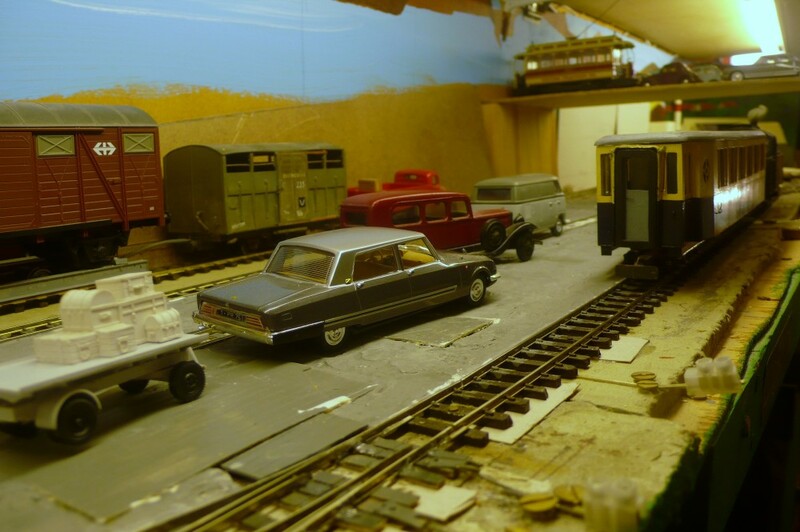 The schools' railcar driver cannot clock off just yet because he will have to retrieve the crew van from the industrial lead and drop that and the van off in the yard. 207. 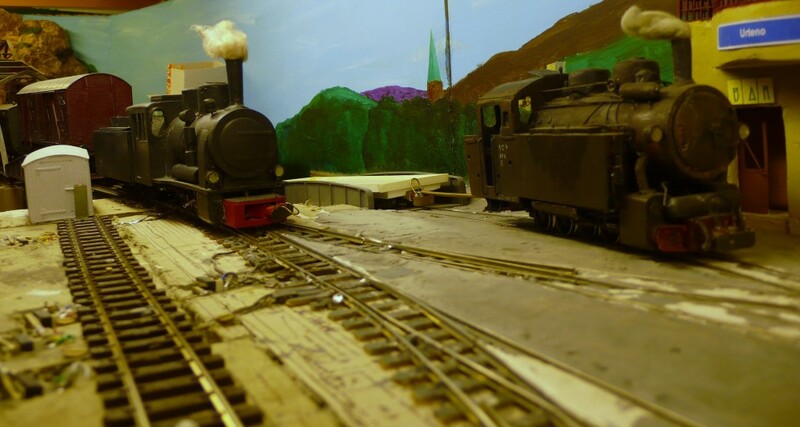 The 0-8-0 is standing on the main line waiting for a shunting move to clear the crossing before it can go to the shed. This will add a couple of extra minutes to the already delayed railcar's departure. 208. 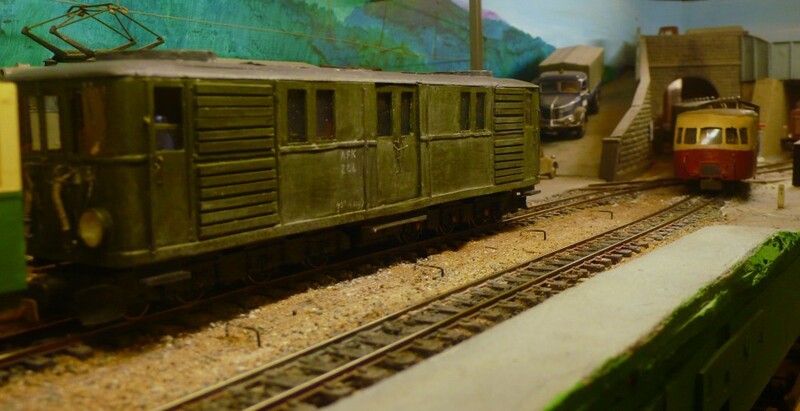 The slightly behind time railcar arrives at Boursson to find that it has a clear signal to run to Glissent. In theory the up and down railcars cross here but the up train is frequently delayed awaiting connections so the crossing point is often moved. 209. The RFK-FDV passenger train breasts the top of the hill at Ospicio. This is the last scheduled up train of the evening but more than likely the ploughs will be in action during the night. 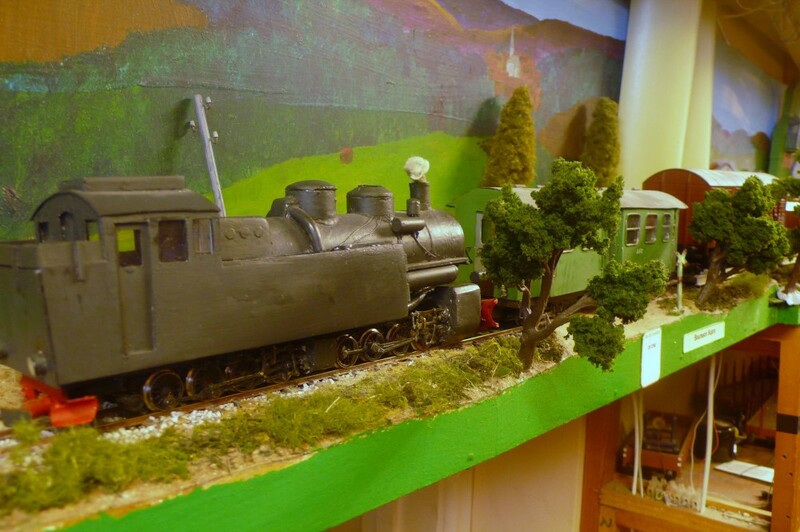 The light switch for the room will be hidden by a building eventually (when the railway is running). 210. The FDV-RFK goods finally pulls into Relforka running early. 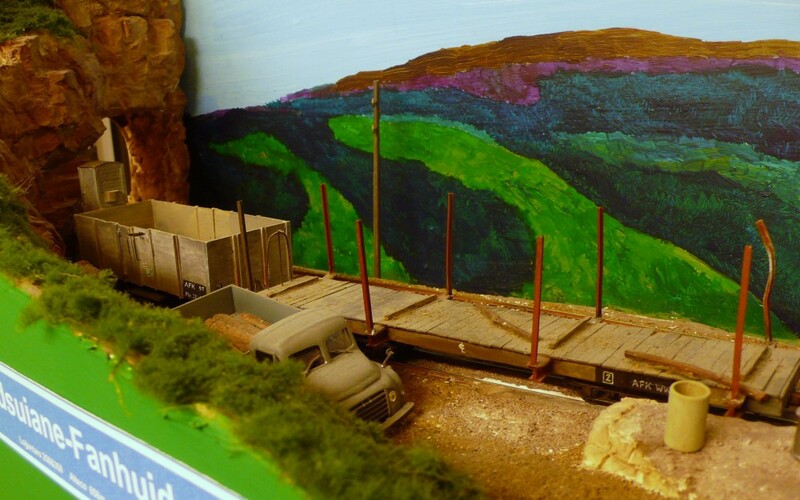 The train is usually held at Glissent for the railcar but as this is running late the freight was given the road. The railcar will terminate at Urteno. 212...... the loco has to wait in the third loop until the passenger arrives and then double over to attach to its train. Rather late in the proceedings it was also realised that the train substituting for the railcar was too long to get into the loop and so two vehicles were left behind at Caladonno. 213. The cement train runs through the loop at Caladonno to avoid the road van and Post van left on the main. This is one move that certainly was not envisaged when the layout was redesigned to incorporate the loop but it presented no problems. Caladonno is ten minutes away from Fenditavalat so the marooned wagons will soon be rescued by the pilot. 214. 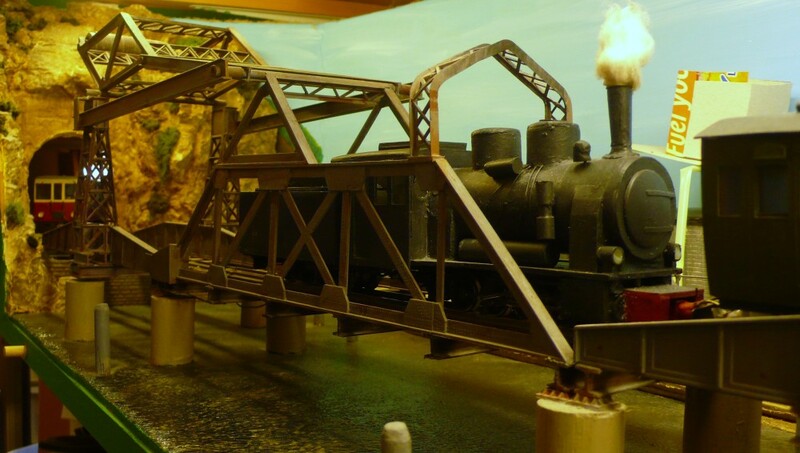 The late running RFK-URT goods crosses the bascule bridge to pull into Urteno. The pilot, after much manoeuvring, has pushed two coal hoppers onto the ferry. These will replenish the ship's bunkers. The ferry will wait for the arrival of the last railcar before departing and this is the easiest way of doing the job. The two vans and the hoppers will be removed before the ferry sails and will be replaced by another cut of empty vans. The two vans on the ferry contain blemding spirits for the Fenditavalat Marronĝaco distillery and will continue their journey tomorrow. Marronĝaco is a spirit named after the area where it is distilled (in a manner similar to Calvados and other spirits). 215. The log train is finally ready to depart. In the light of experience I would try to avoid assembling the train so early if the situation recurred. It would have been easier to hold the wagons in the sidings rather than to take one loop out of the equation for most of the evening. To be fair when the original decision was made to form the train there seemed to be a real possibility that it could leave shortly afterwards. As I have remarked before, the AFK is only one bad decision away from tying it in knots, as the real thing often was. 216. The last two passenger trains of the day cross at Breĉo de Glissent. The up train departed late and has had to stand to allow the down railcar to arrive. 217. It has lost further time and is now running around thirty minutes late as it stops at Boursson's home signal which is at danger. This is an expected delay because the station is now closed. The driver will sound the horn and proceed, ready to stop on sight, before the trajnaĉefo operates the block instruments to give access to the next section. 218. The railcar's arrival at Lacono shows that there are problems elsewhere. The cut of SG vans should have already been pushed into the confectionery factory as should the vans in the foreground. Placing the Post van at the Post Office, as should happen, will block access to the factory so the postal staff will have to unload it from a more inconvenient place than they would like. 219. The pilot is scheduled to remove the tail traffic from the railcar but the long freight is given priority to depart. It is running at the maximum tonnage and is so long that it has taxed the capacity of every the loop that it has had to use. A quick review of the previous sessions will show that the loadings and promptness of this train vary from day to day. Usually it runs much later and sometimes is held until the following day or even cancelled. Today everyone will be glad to see the back of it! 220. 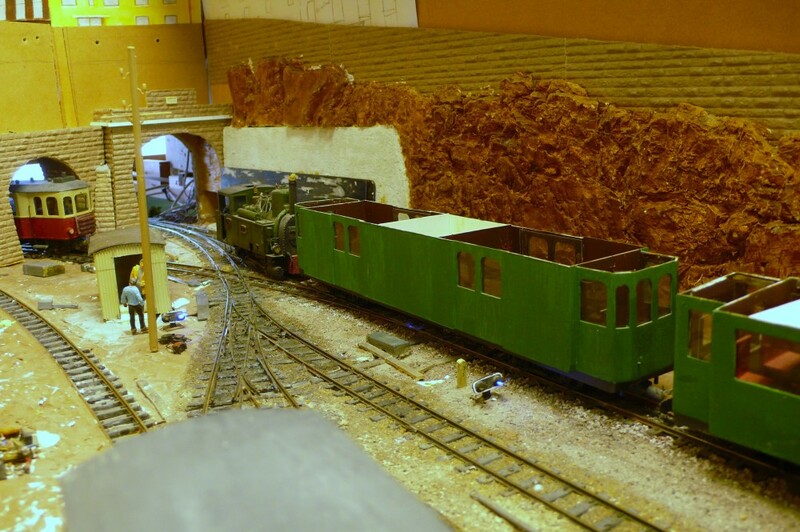 The URT-RFK goods is the last scheduled down train of the day and is seen here crossing the only modelled section of the Ero on the layout. At 220 tons the train is the largest authorised in the Instructions and needs careful handling. 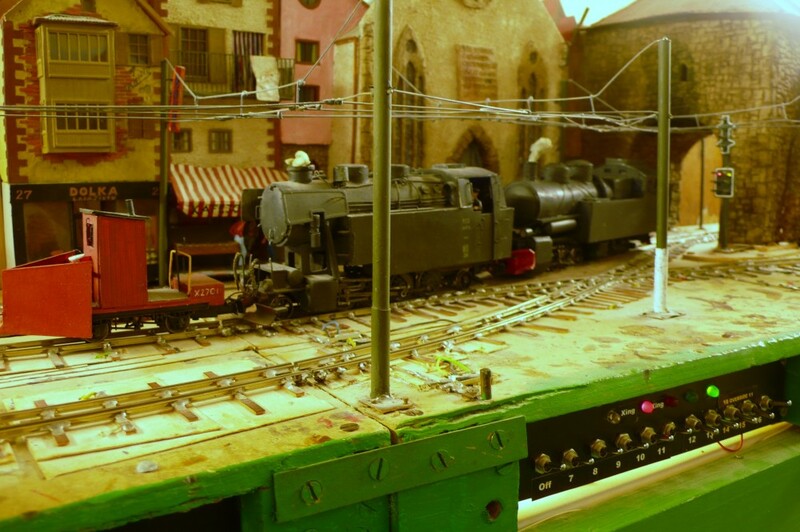 The furthest wagons are eight feet away from the loco, which makes the train considerable longer then many layouts, in a British context. 221. The session is reaching the last knockings by now. The final down train has arrived at Eromarbordo and has run round the beer wagon. This is now being propelled toward the goods shed for unloading tomorrow. 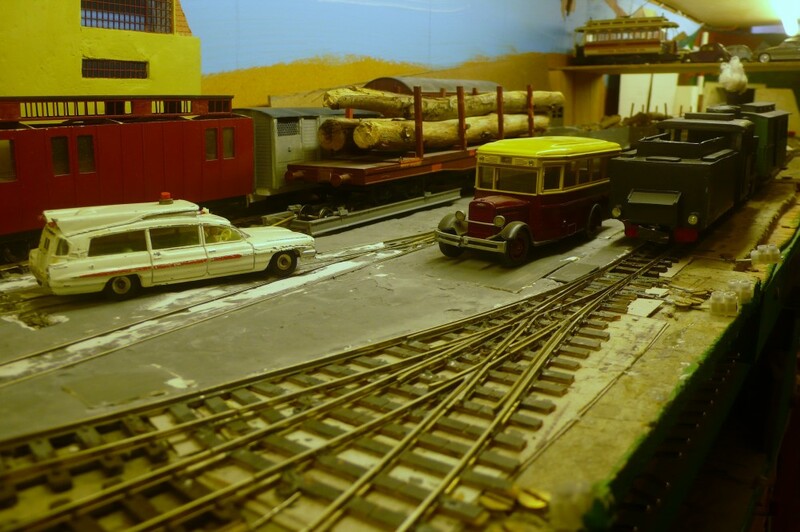 The railcar shuttle set was run onto one of the industry leads to allow the crew of the last train an easy shunt and early finish. 222. The upper section of the layout is similarly in the throes of shutting down. The Fenditavalat shunter retrieves the wagons left behind at Caladonno by the train substituting for the railcar. This looks like it will become a regular procedure during the snowfall season. 223. 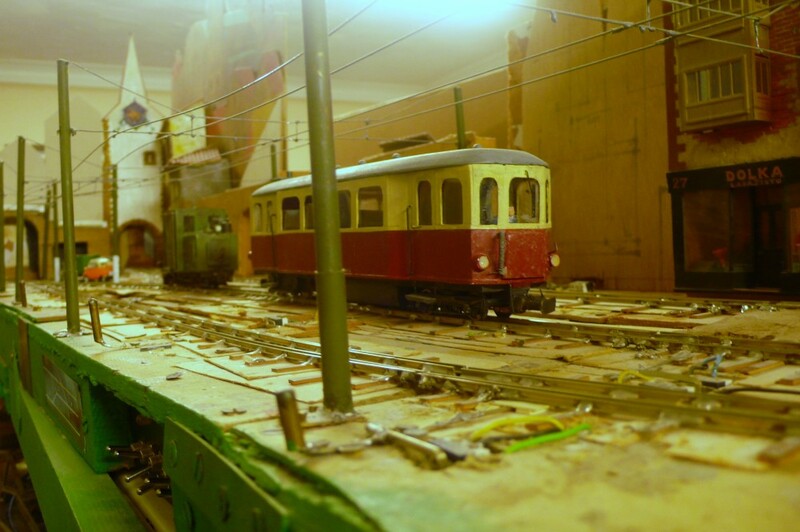 The terminating railcar arrives at Urteno at 23.40. The shunter is still busy removing the wagons from the ferry. There is no onward bus service at this time of night but the ferry waits for any stragglers who might need to cross the lake. 224. Urteno is still busy as midnight strikes. 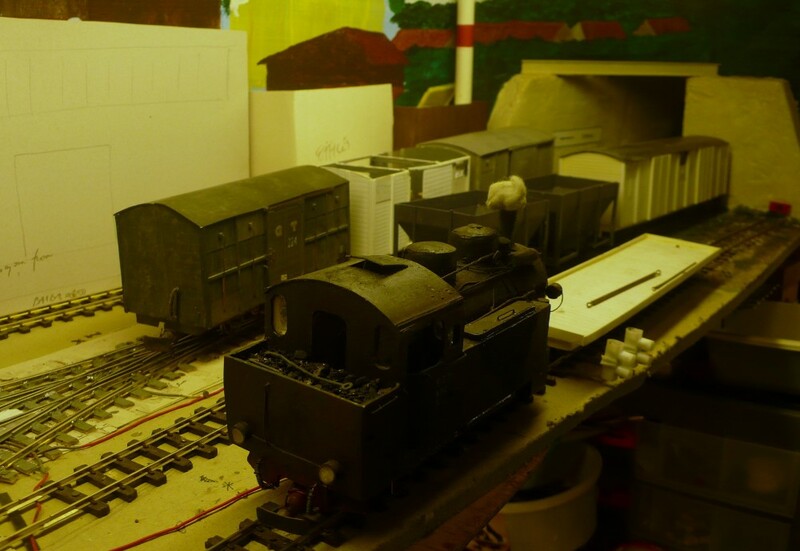 The railcar needs to run round the Post van and the shunter still needs to sort out the wagons from the ferry as well as pushing SG wagons into the furniture factory. 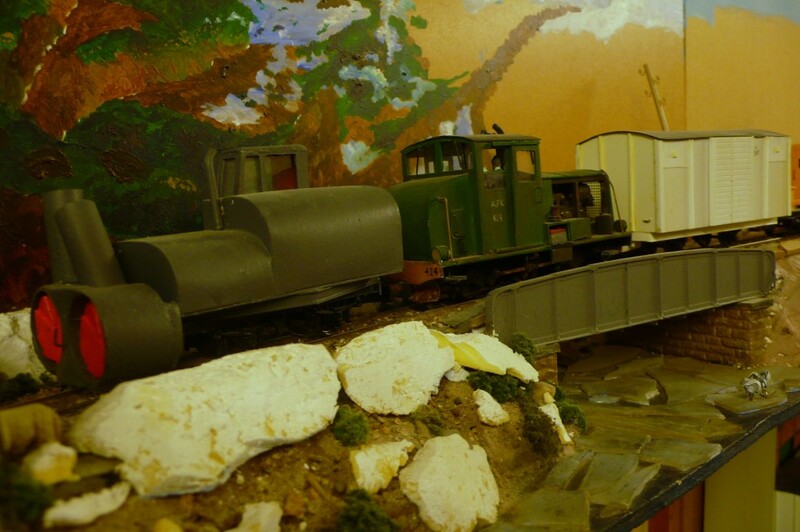 The cement train (FDV-LAC) has been held because no path was available but it is now running through one of the loops. 225. The ferry is only supposed to carry four rail vehicles normally but as there is no demand from road vehicles to cross tonight it is loaded to five vans (the bogie van is counted as two). The van at the front has had a quick transfer as it was tripped in from Lacono as it was part of the train in photo 214. 226. The traditional shot of the last move of the day. The 0-10-0T returns to the shed at Lacono having left Urteno at 01.00. Activities at Lacono finished some time since but will recommence shortly. 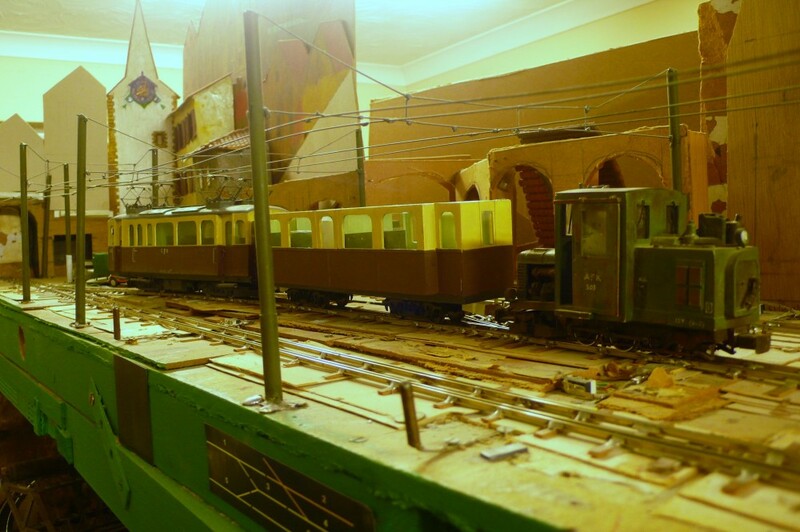 The railway has now closed down for maintenance. During the interregnum certain items will need attention as noted below. Some point microswitches are not activating as they should do, but it came as a shock to realise that some have been in place for almost twenty years! 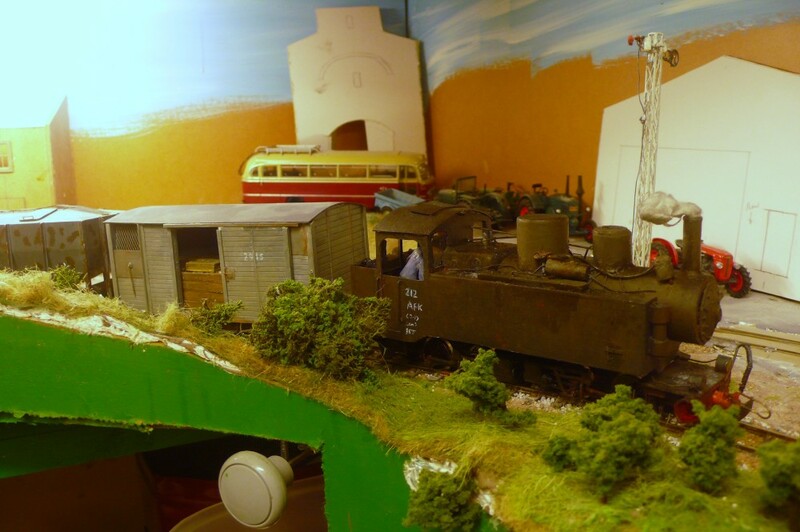 The Billard railcar needs attention. That is now forty years old. The 0-8-0 performed in an acceptable manner so that needs completing, as do various diesels. The 0-8-8-0T mallet performed reasonably well but still needs some attention. 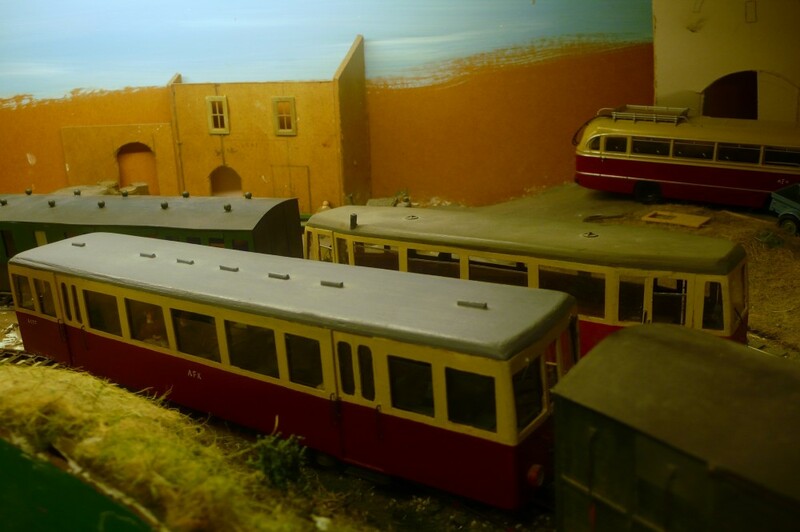 There are plenty of wagons awaiting paint and many coaches want roofs. 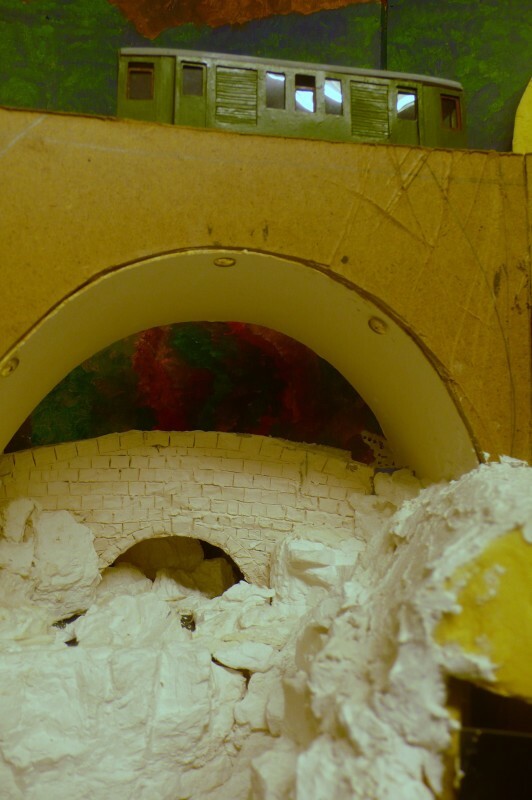 That is before any work is done on scenery, building new stock and carrying out an in depth survey about whether, where and how to add a paper factory. It has become noticeable in recent sessions that traffic has grown in the last twenty years and that many trains now run at or close to capacity.